Posted on July 13, 2016 by Elizabeth E.
First up, some business to take care of. I recently had a post about creativity/uniqueness/Uppercase/Collaboration, where I had a giveaway with two Uppercase magazines and a charm pack of Uppercase Fabric. So many of your comments were incredibly thoughtful about the process of creativity and the quality of being unique. Several were very encouraging to me, which was quite appreciated and touched my heart. Of course, I’ve pasted them in my journal for those less-than-stellar creative days. Thank you all so very much. 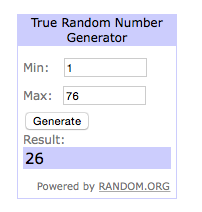 I used the True Random Number Generator (I like to spread the love around the random number generators), and it picked Mary, of NeedledMom. Email is on it’s way to you, Mary, and I’ll get the treats mailed off to you this week! 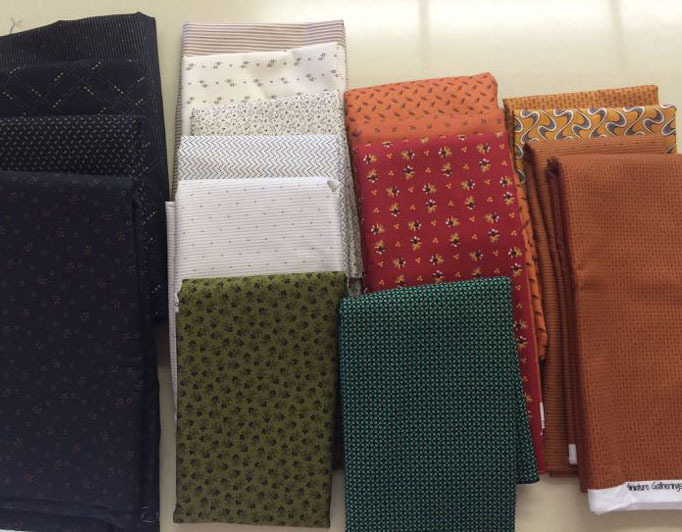 Step 1 (Preparation): February 13, 2016–buy all the fabrics and find the pattern. Patterns are available from Primitive Gatherings. The quilt measures 90 by 90, which is too large for me, so I’m only doing nine blocks. 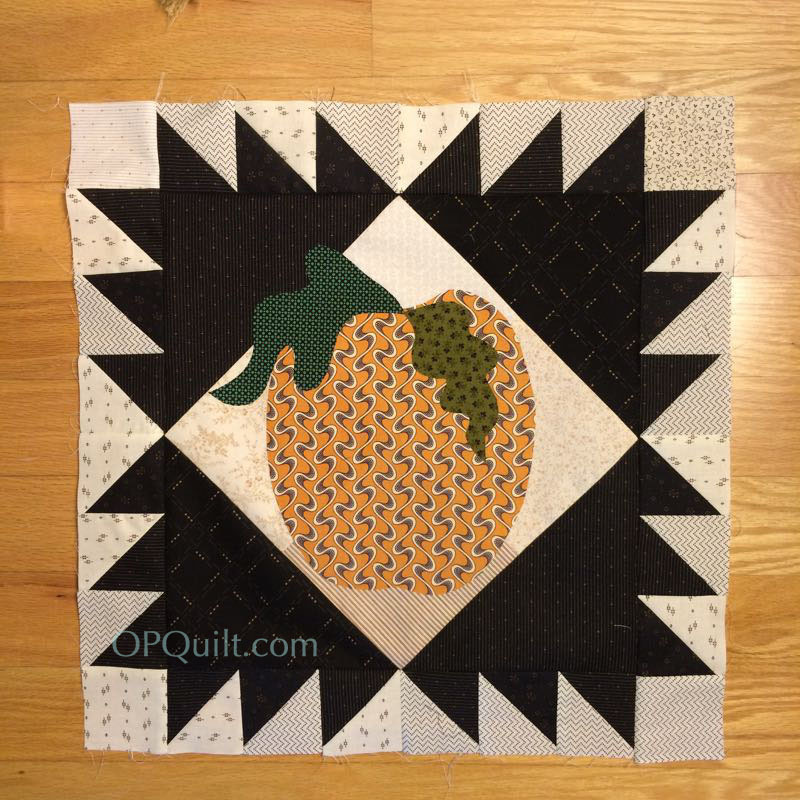 Each block is 20″ square, and with the outer borders, that should come to roughly 65″ square. I may change my mind, but this looks good from here. 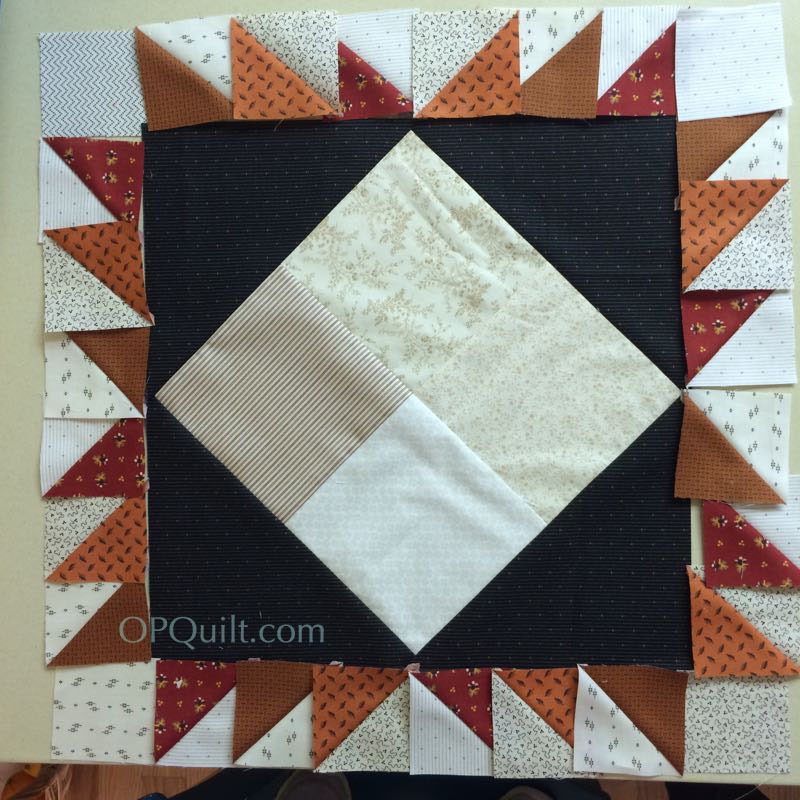 Step 2: March 13, 2016–Cut out the quilt: the tan backgrounds of the squares, the border triangles, the smaller half-square triangles, strips for the wonky stars, but save the piano key border for later. Step 3: April 13, 2016–Assemble four blocks and add large appliques; use Thelma’s method (of Cupcakes and Daisies) for adding the curlicue stem. 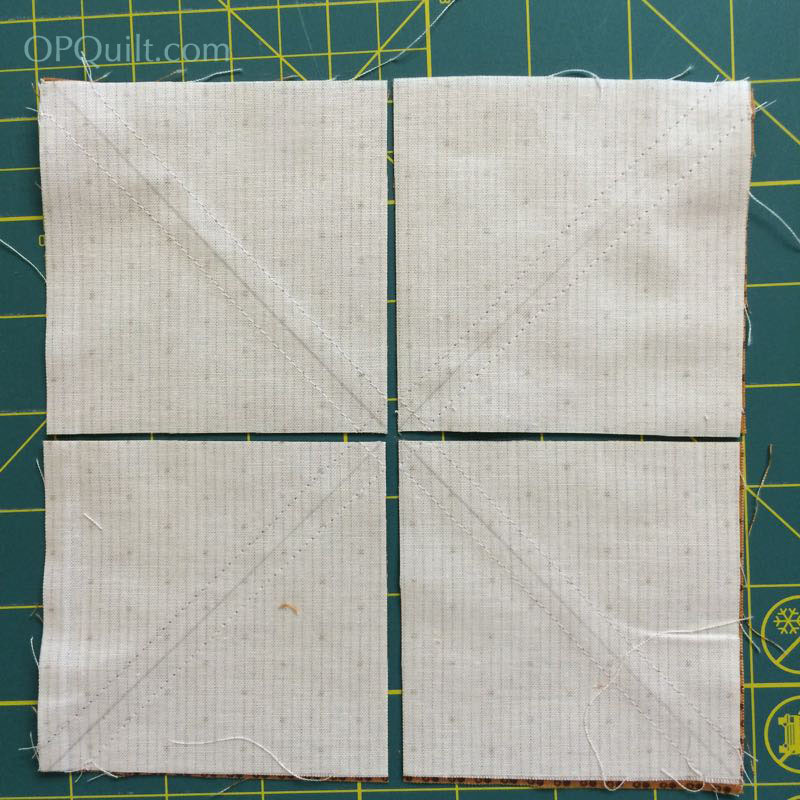 Make and add half-square triangeles (HSTs) around these blocks, using the 8-at-a-time method of HSTs. 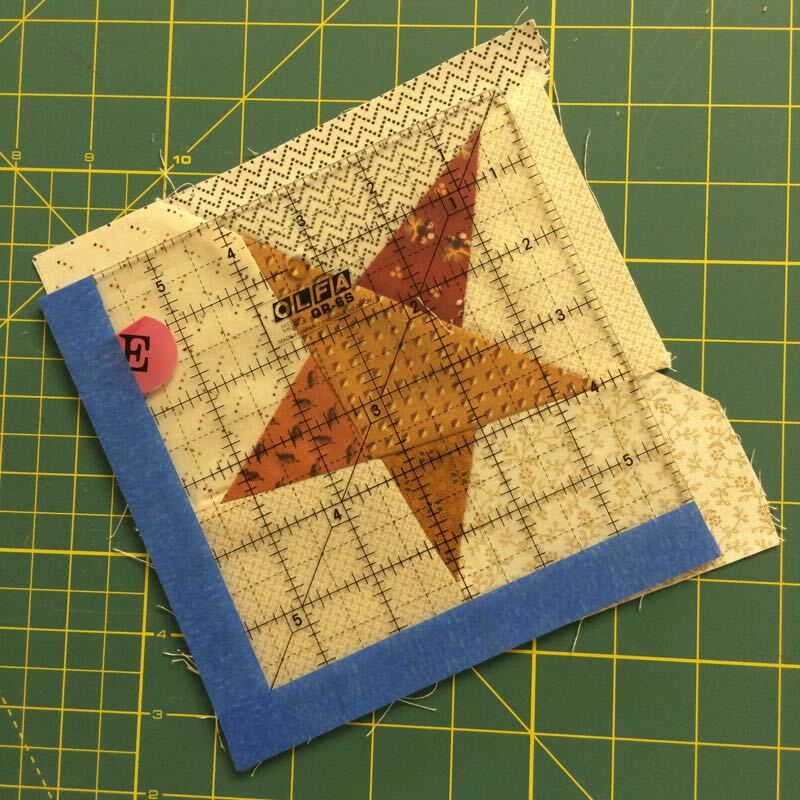 Step 4: May 13, 2016–Cut and make the wonky star blocks from templates and strips. I’m doing five blocks, so will need to make twenty wonky stars and true them up. Add on the large outside triangles. 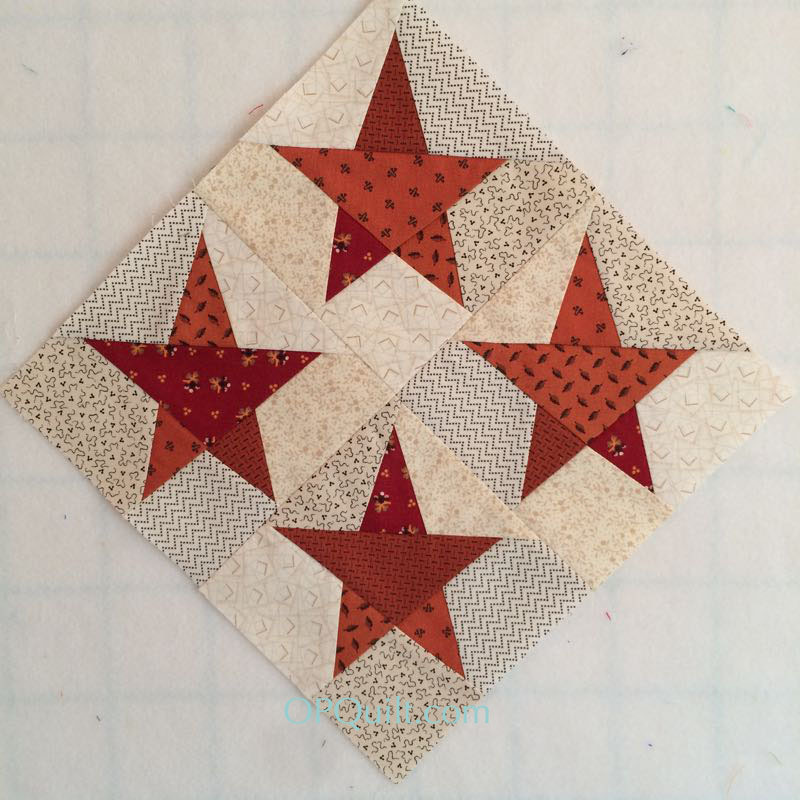 Step 5: June 13, 2016–Assemble the rest of the star blocks, by adding their HST borders. In the pattern, they are mixed up and varied, but also harmonized (some have a mix of orange and black, some have just black, some have just orange.) Make your own rules and go with it. AND NOW! 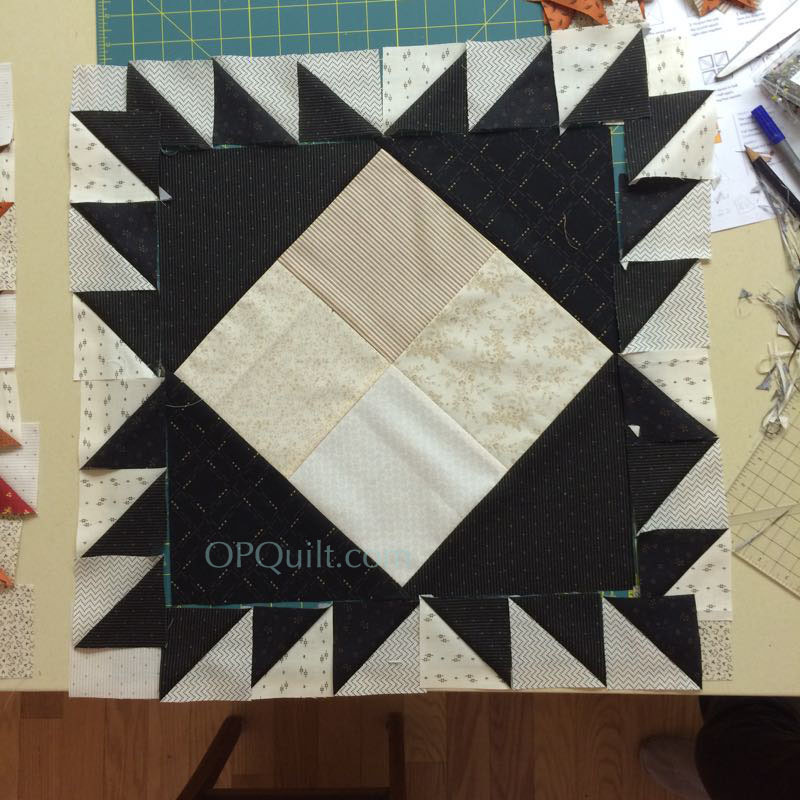 WE ARE AT Step 6: July 13, 2016–Arrange the blocks on your design wall and stitch together. Cut the pieces for your borders. Make the four corner pinwheels. 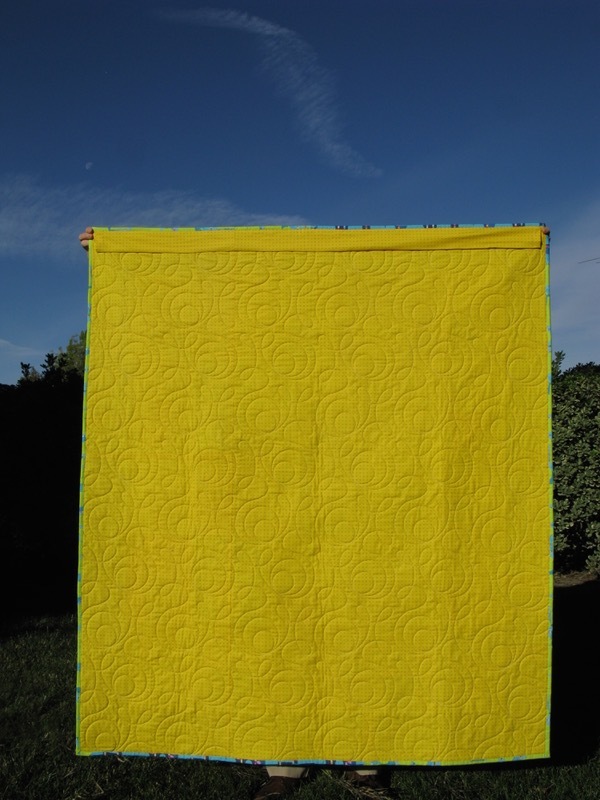 Sew borders together and attach them to the quilt. Ta-Done!! We finished up here last time, with the center of the quilt put together, the blocks placed and sewn together (and yes, I fixed the lower sawtooth edge on the right). Leisa and I are making a 9-block quilt; the pattern calls for 12 blocks. 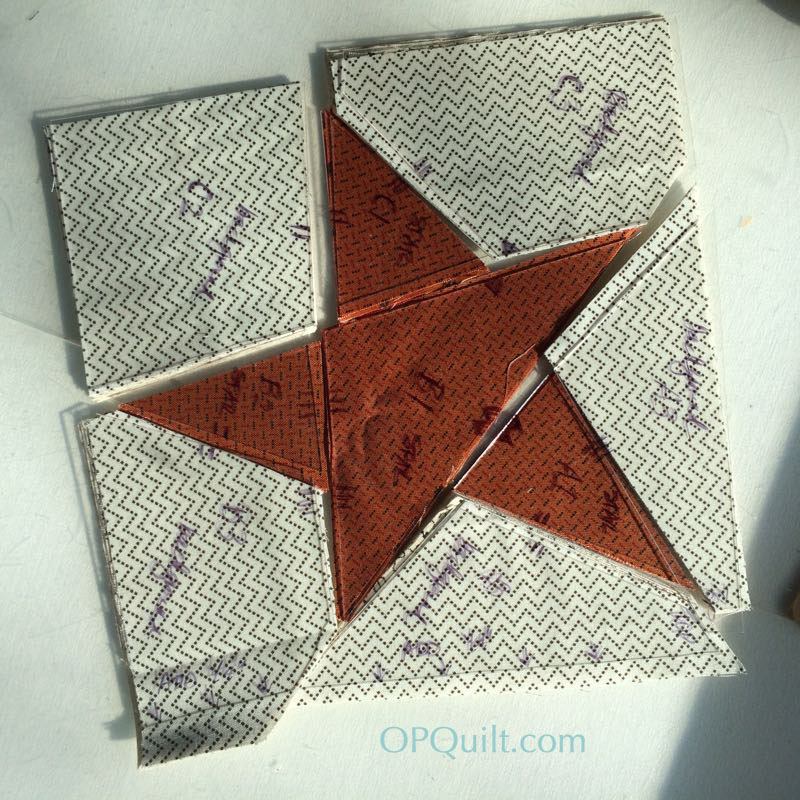 Make more HST blocks: there are four blocks per pinwheel, so this time I didn’t use the eight-at-a-time method, but instead, followed the pattern’s recipe for two-at-a-time (check there for dimensions). 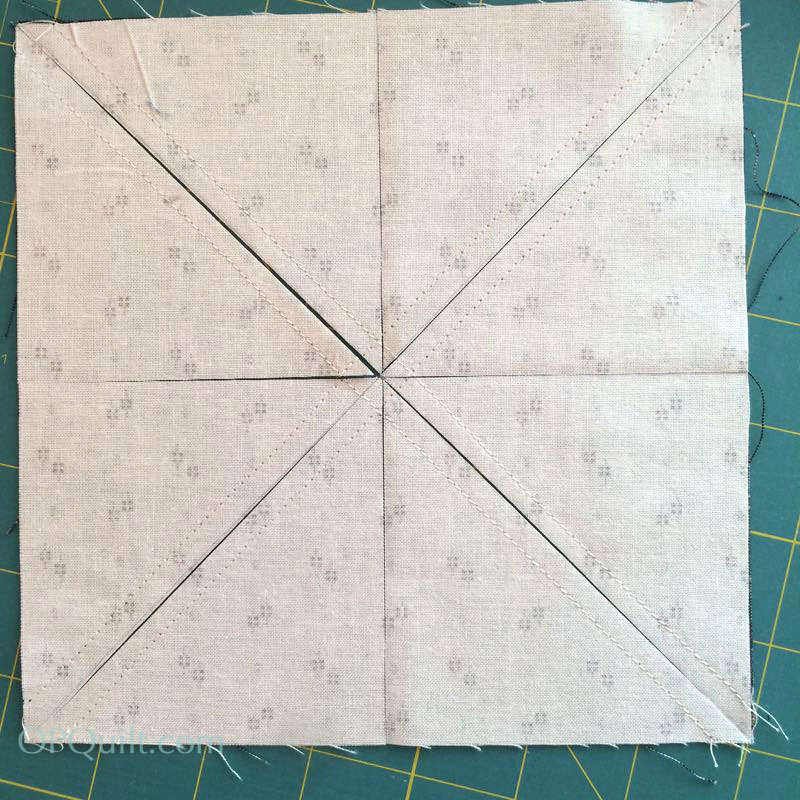 Trim each HST to 3″ using your favorite method, then stitch four together to make a pinwheel. 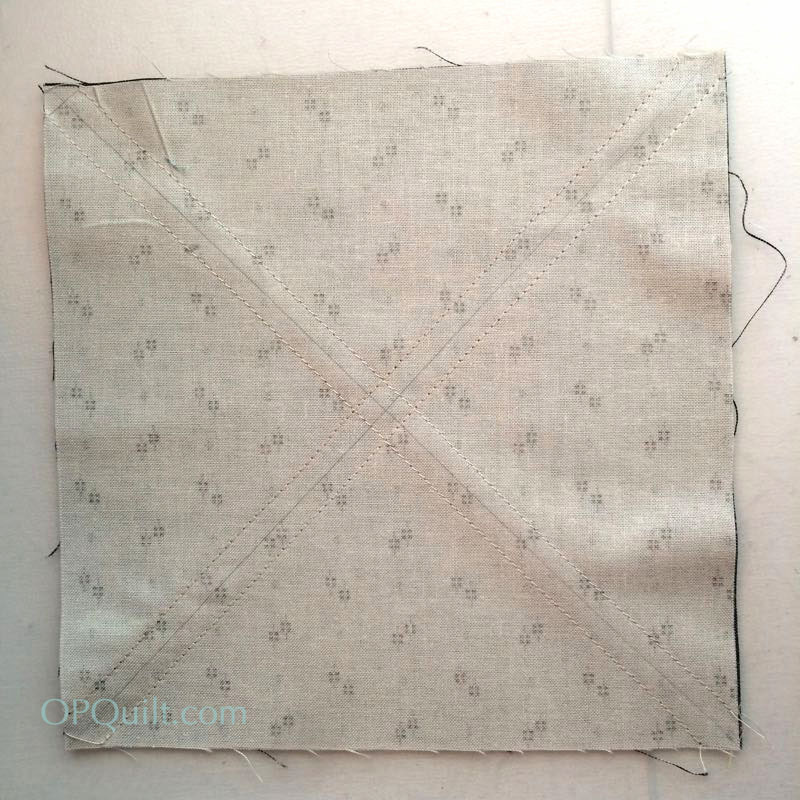 Press, as shown, with all seams to the dark, popping a few stitches in the middle to allow the seam allowances to make their own tiny pinwheel. You’ll be making four corner pinwheels. 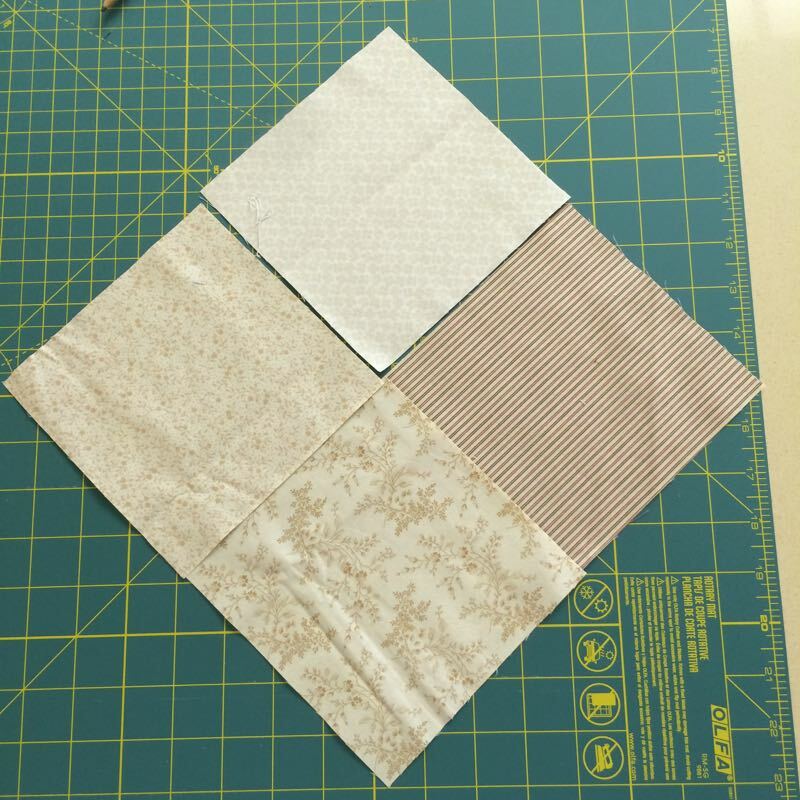 Cut your pieces for your borders, following the pattern directions. 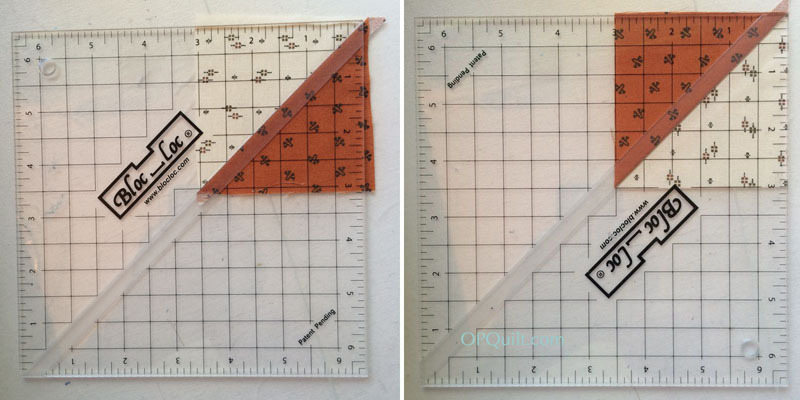 For the smaller nine-block quilt, adjust down to 24 total per side. 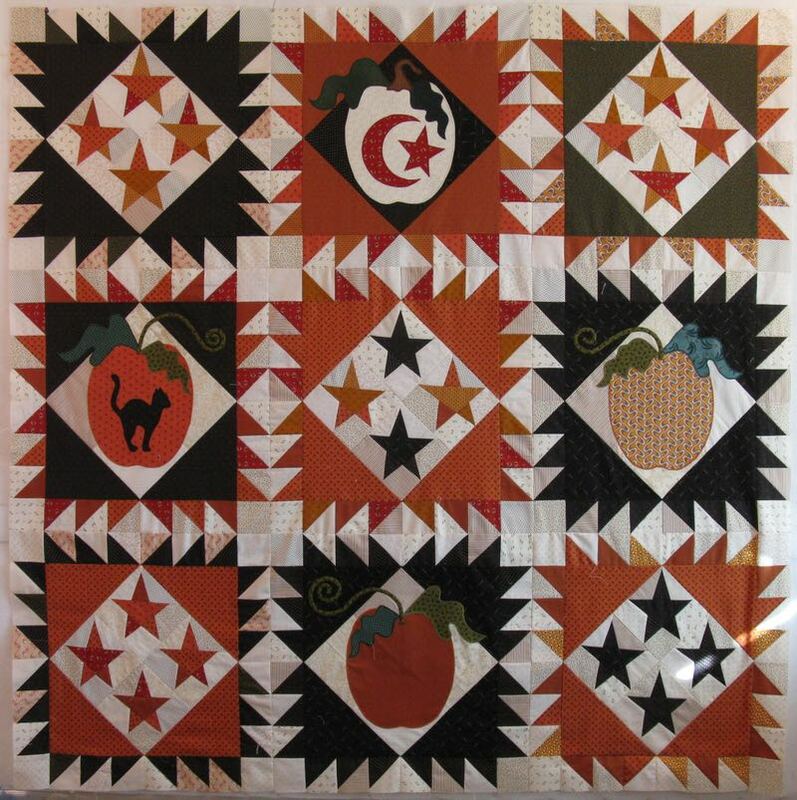 I tried to randomize the sewing of the oranges in between the black pieces, as I had many more different types of orange. Just do your best. Press the seams going one way. You’ll notice that you begin with a black and end with an orange piece (or visa versa). 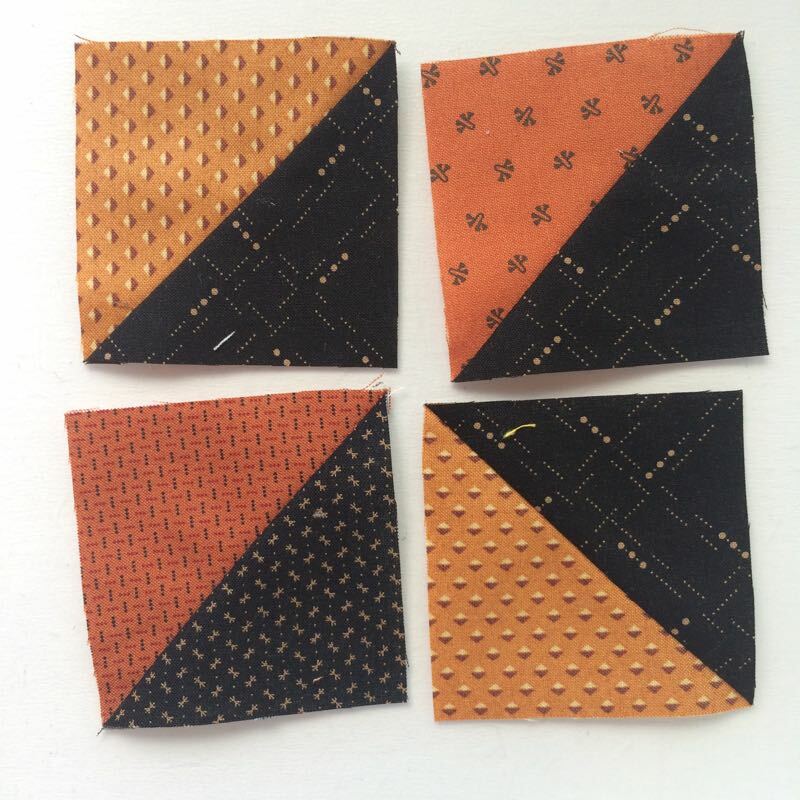 I chose to press my seams toward the orange, from the black, doing the same on all four border strips. Matching all the seams, pin and stitch on the borders: I sewed on the top border and the bottom border and pressed the seam away from the quilt top (towards the border). Then I sewed the sides on, but I left one inch free on the beginning of that seam and on the end of that seam, which would allow me to stitch on the pinwheel blocks later. You can kind of see where it’s not sewn down, above. Now, audition your pinwheels–you’ll like them going one way or the other, or swap them out to get the look that pleases you. But please don’t overthink this step. When you get them how you like them, stitch them on the side borders at both ends. Press. Then finish stitching the side seams. 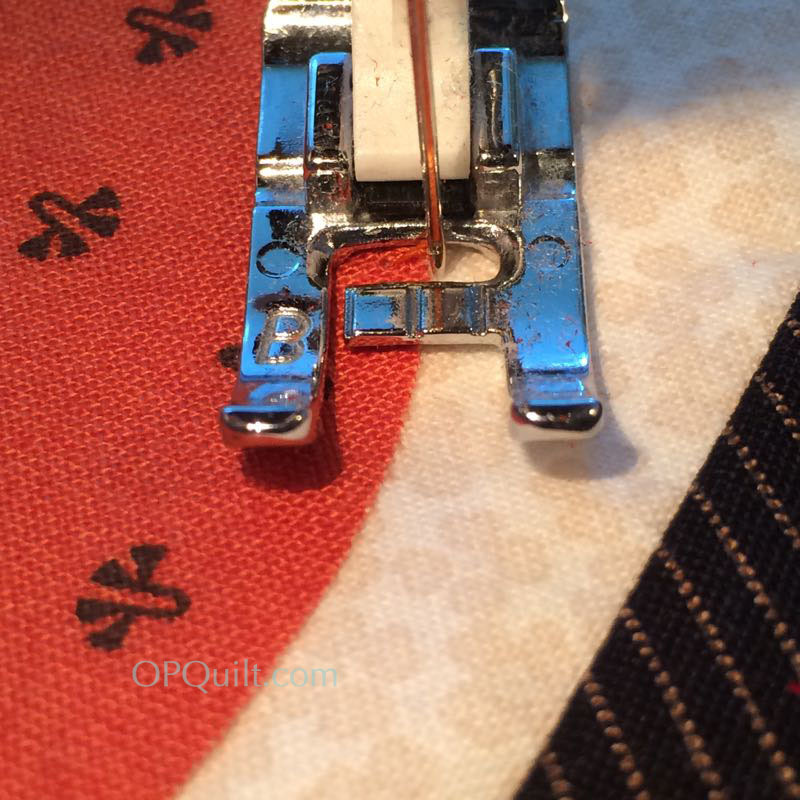 Now press those seams away from the quilt top, towards the border. You are done! 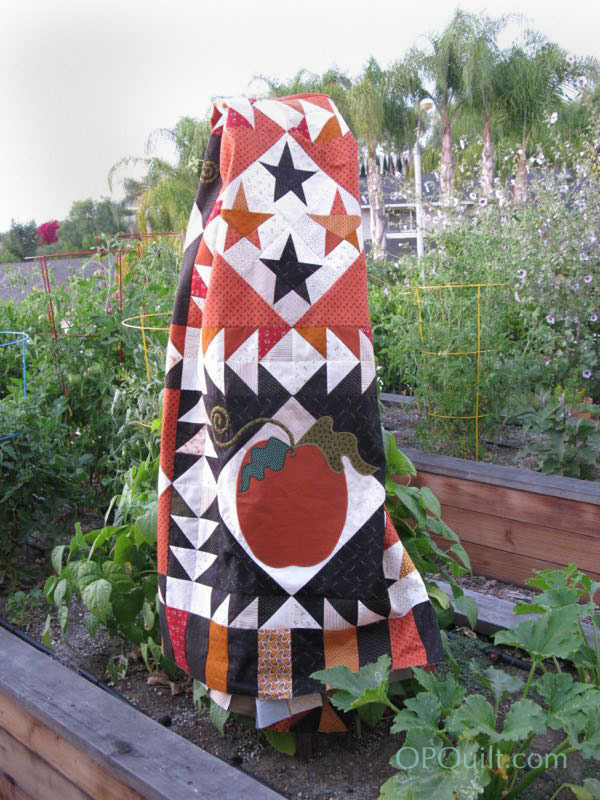 I went outside in the sunset and took pictures of the completed quilt top. 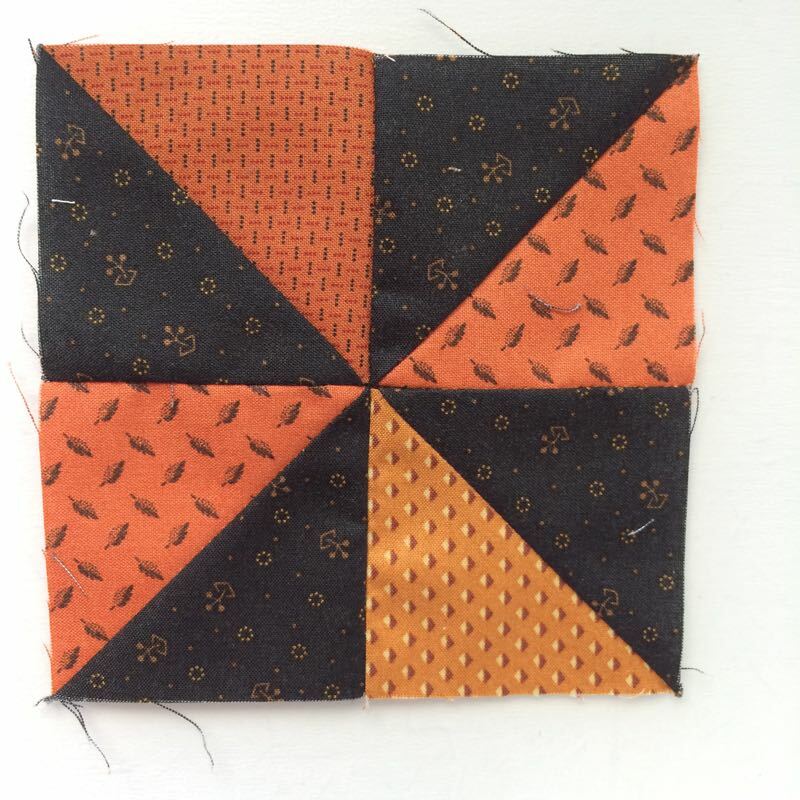 I know when you were deep in wonky stars and then deeper in making millions of half-square triangles, you wanted to quit; however, this last part is easy-peasy, so you should come roaring into the finish line. Update (December 2016): I finished the quilt, taking it over to my quilter. She got it back to me by the end of November and by December, the binding and sleeve were on. 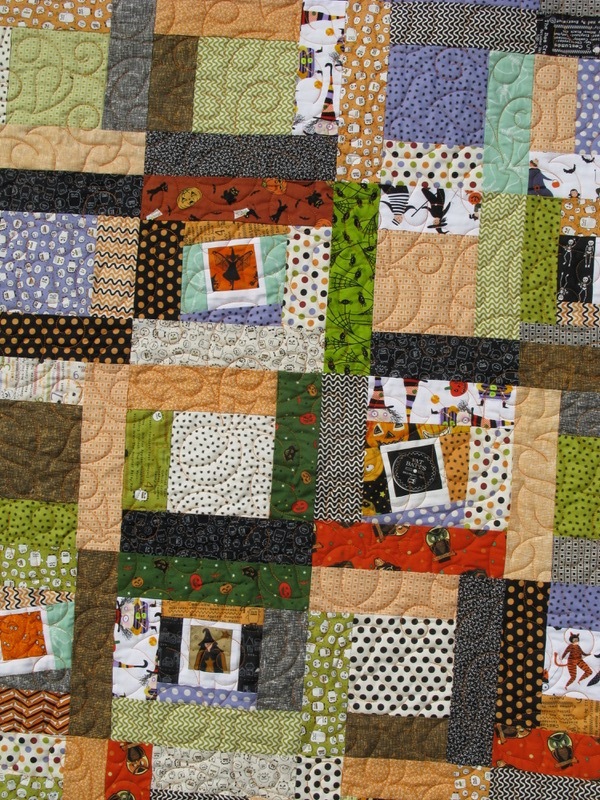 Congratulations on finishing your Halloween Quilt, and so early! Thanks for following along our QAL. 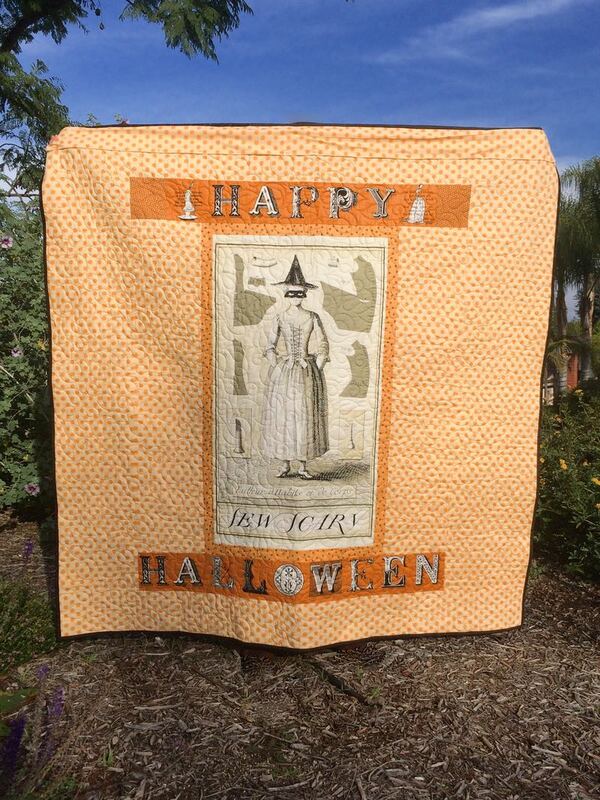 Hope you enjoy your quilt this Halloween! When you finish, send me a photo (or two) and I’ll put them up on the blog. Happy Haunting, everyone! 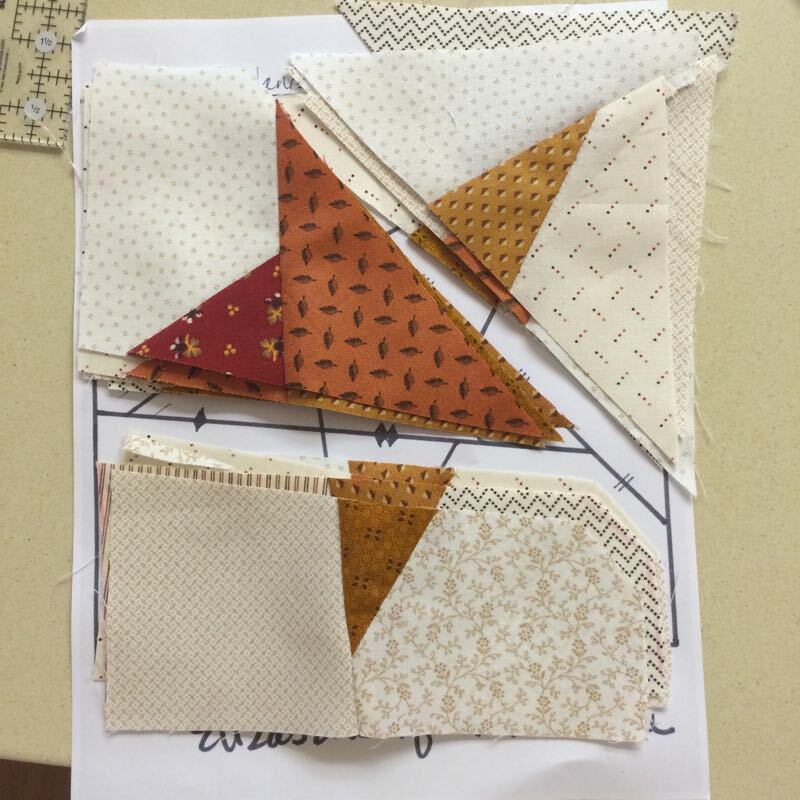 Posted on May 13, 2016 by Elizabeth E.
It’s the WONKY STARS step! 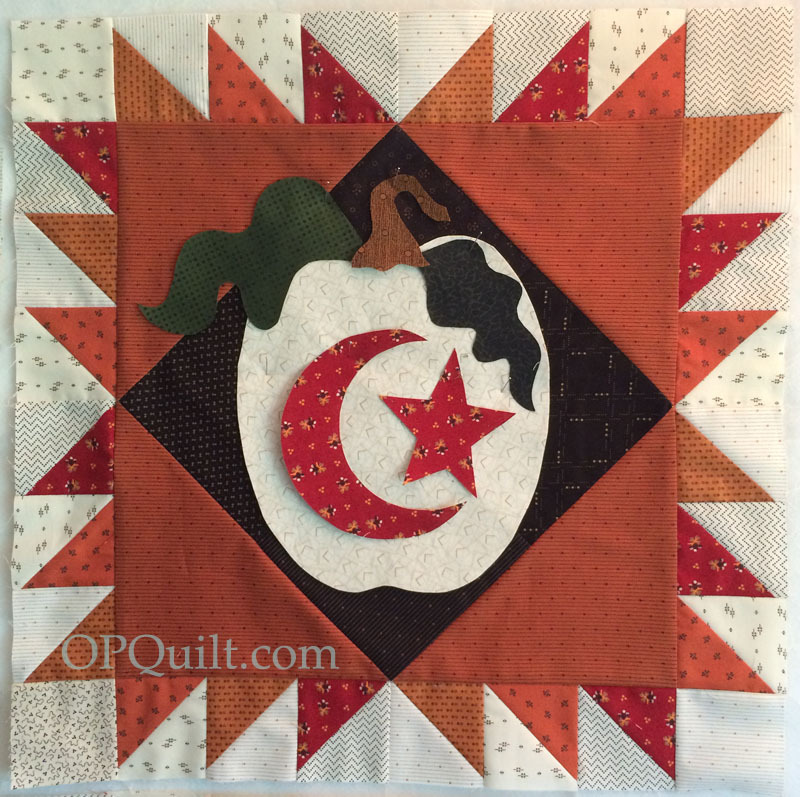 If you are appliquéing your stars onto your smaller background blocks, go for it and we’ll see you next month. 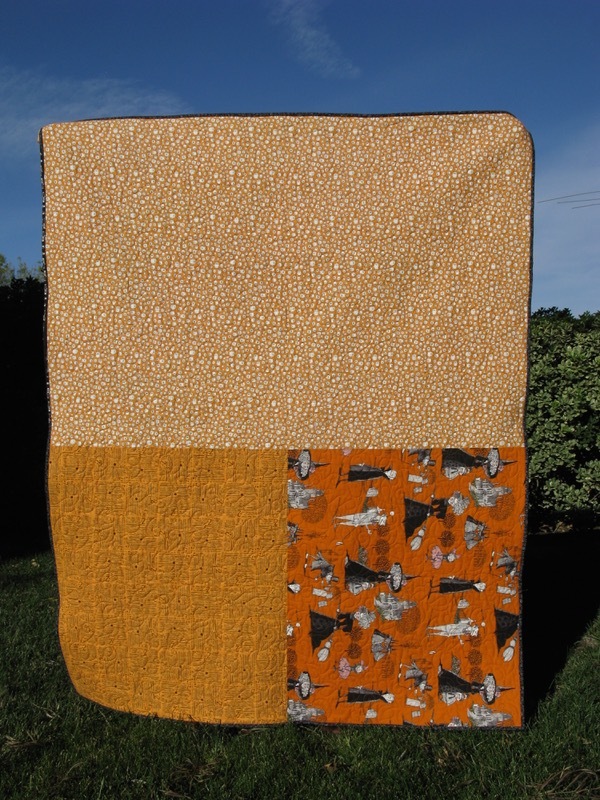 For the rest of you, even those not making this quilt, I’ll walk you through a stack and slash version of a star, pioneered by Thelma of Cupcakes and Daisies. 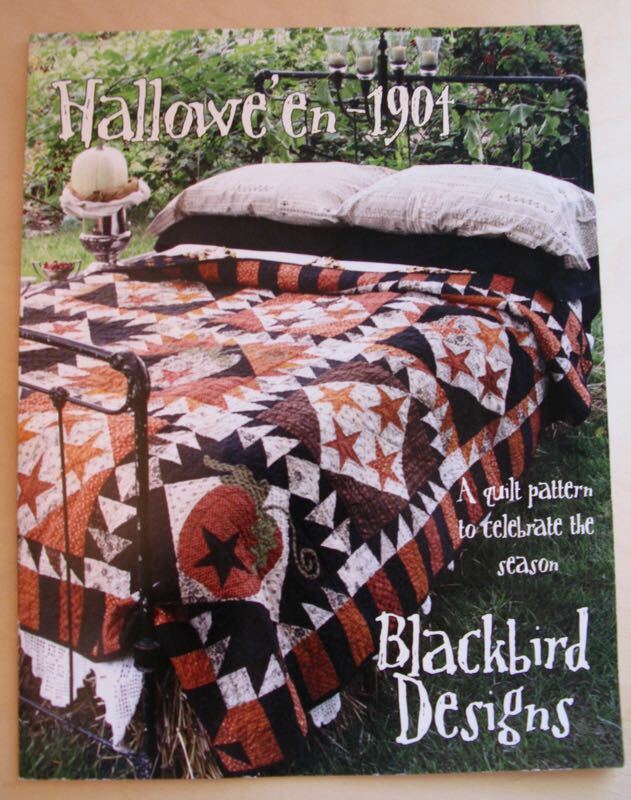 You’ve seen this before; this is an image I found on the web some time ago of the quilt we are making, Hallowe’en 1904 by Blackbird Designs. Yes, we are again hard at it for the Hallowe’en 1904 Quilt-A-Long. 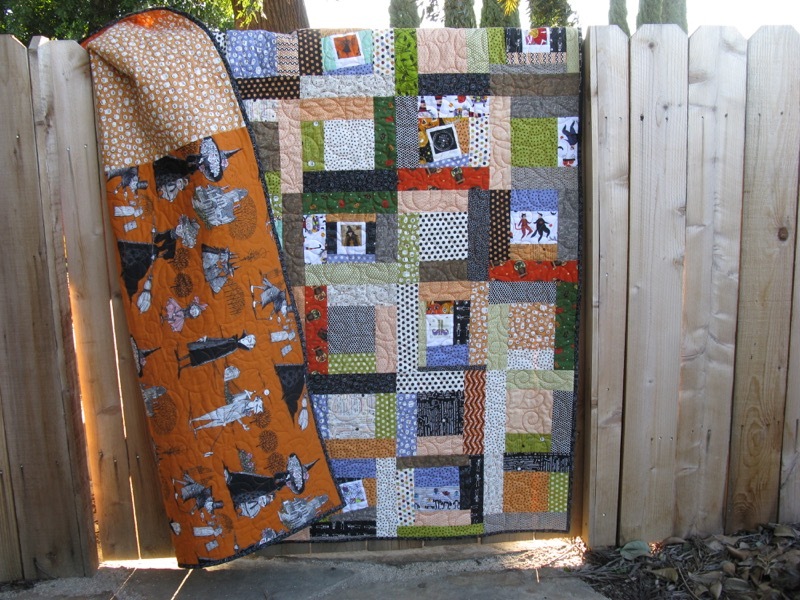 All of four of us will have quilts ready for Halloween, so I’m excited about that prospect. Well, maybe it’s more than four of you out there in the Internets, but at least two of us — Leisa and I — will be among those finished in time for that fall celebration. Again, Leisa and I are making NINE blocks, down from the original twelve in the pattern. 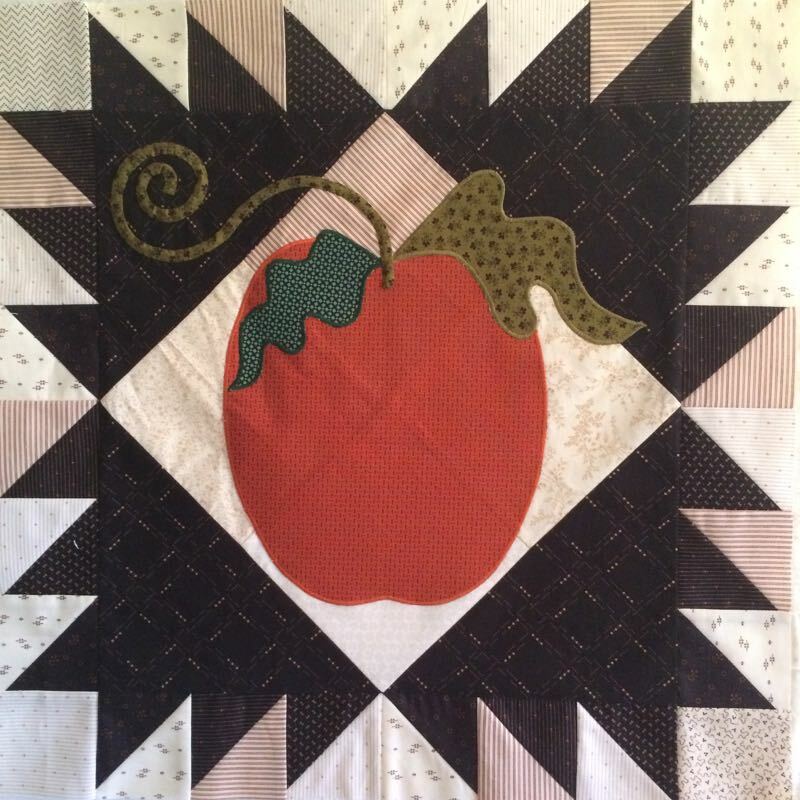 I posted a version of smaller quilt *here,* using all twelve blocks and formulated by Mary Burton. But we’re doing nine, with four appliqué and five star blocks. Yes, all four are done, even the one with the weird-o leaf. It’s staying put for now. Here’s my tip for touching up those stray bobbin threads that work their way up if you are doing satin stitch: get out a Sharpie marker in the color of your thread and color it in. I also use it for errant free-motion-quilting oopsies. And this time, we’re heading right into How to Make A Wonky Star. If you want to go the traditional route, of cutting and appliquéing your stars down to your background, go ahead and get going, and we’ll see you next time, on June 13th. Anyone else who wants to learn this technique, stick around. It’s not a new technique as we used to use it to make things like nine-patch blocks: stack up a bunch of fabrics, cut, swap out the fabrics and sew. I also found a version of this stack-and-slash used in a star block, and the copyright on the page says it’s from 2000-2005. And Bethany Reynolds is credited with the first national use of the technique known as Stack-N-Whack. I tell you all of this to say there is nothing new under the sun, especially in quilting, but only new turns at an old technique or form or idea. We’ll get this far this month, but will do five of these blocks, saving the points around the outside for next month (although you are free to move forward if you want). Get out your strips of fabrics, cut according to the chart. 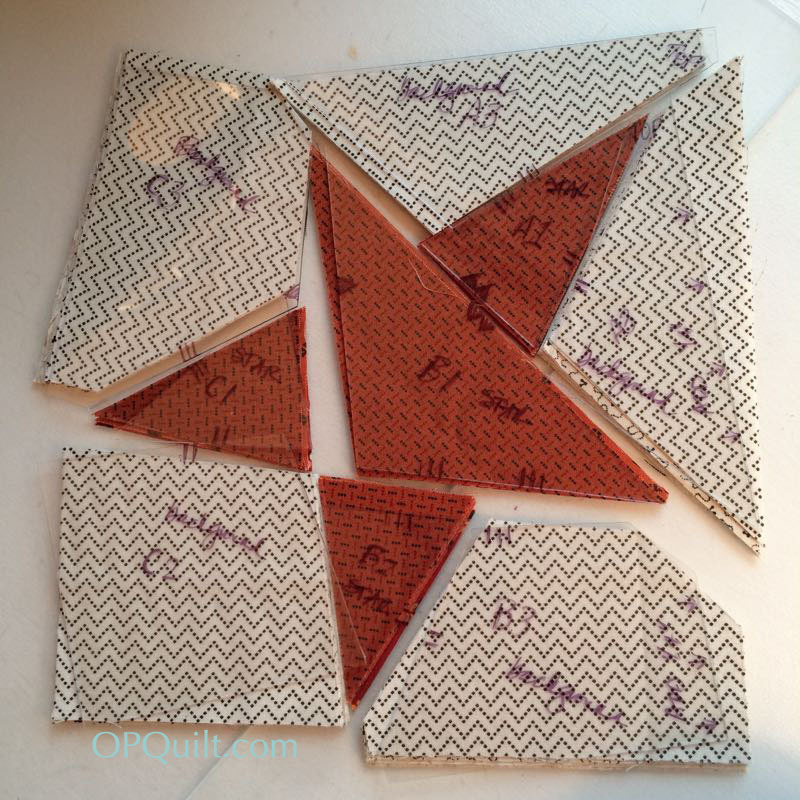 Different versions of the Stack & Slash Star pattern. I drafted and revised this star block multiple times, trying to get the proportions of the Stack & Slash pattern correct. For this reason, please print off only enough for your own use. Please don’t print off enough for your mother or your girlfriend; send them here to get their own. 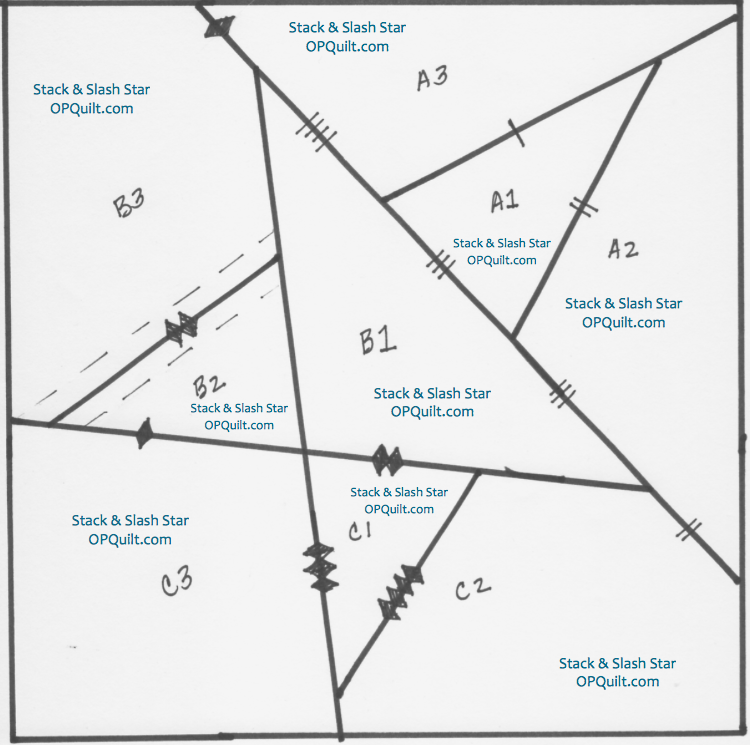 Download the PDF file here: Stack&Slash StarEastmond Print off two: one to use for a template for your star patterns, and one to use as a map for when you are piecing. You’ll notice on the pattern that there are lots of little diamonds and slashes. (These are your notches to help you get the thing back together. It doesn’t matter if you use mine, or make up some marking system of your own, but please do this!) 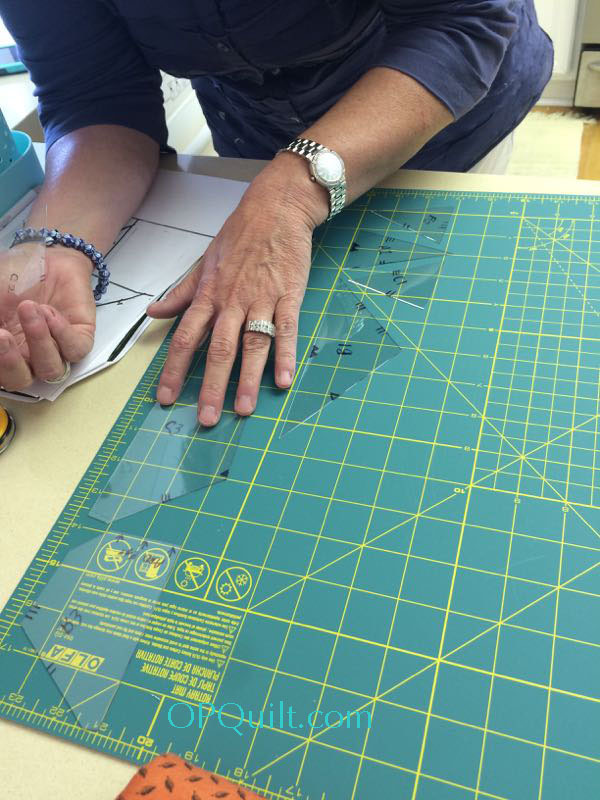 Lay some clear template plastic over the pattern and trace. Looks like mine got reversed somehow, but really it just doesn’t matter one way or the other. Now pay attention to what is the center of the star (A1, B1, B2 and C1) and what is the background (all the rest). 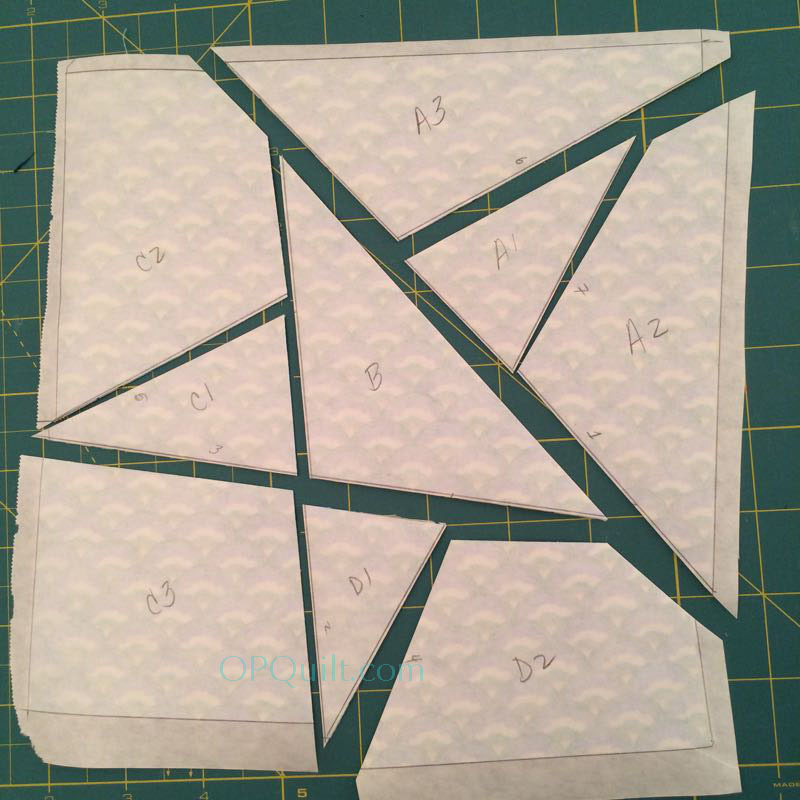 If you do the usual cut of WOF, you’ll have part of the fabric facing you and part of it will be facing down to the cutting table, because of that fold. 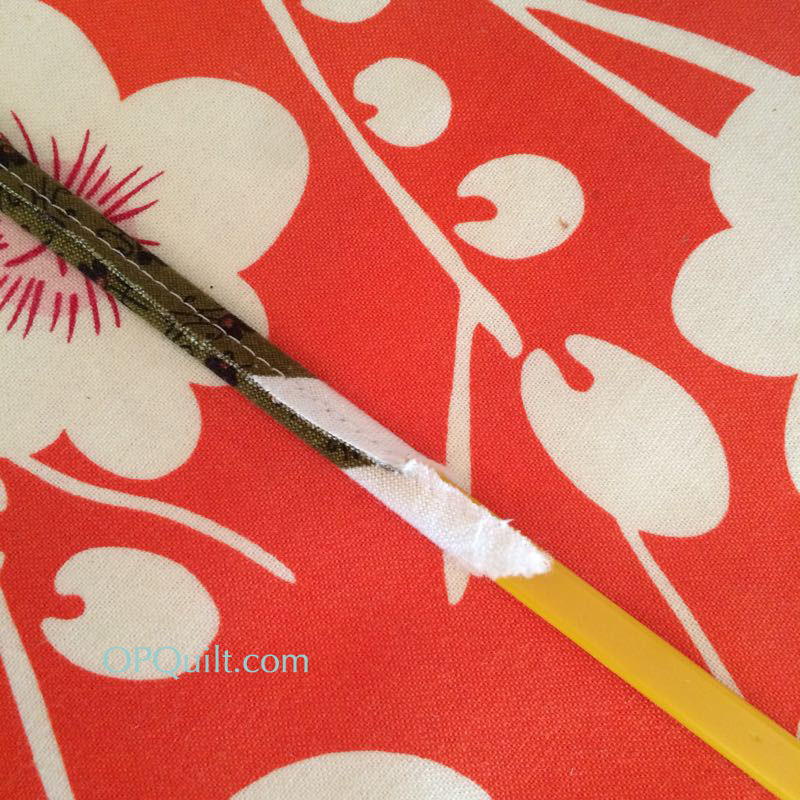 Unfold it before cutting and you’ll avoid this problem. I just had to go back in and cut some parts “backwards” and I made enough for a star or two. So you’ll notice that some of my stars are wonky to the left, and some are wonky to the right. It just doesn’t matter. Really. VERY IMPORTANT: To get the appropriate amount of wonkiness, you’ll need at least FIVE different background fabrics, because there are 5 different pieces to the background. If you want to have the star pieces all different, you’ll need FOUR different star fabrics, because there are 4 different pieces to the star. But so you don’t lose your marbles in construction, cut FIVE different background fabrics and FIVE different star fabrics. You’ll need to do some shuffling as you sew. This is the “map” of the Stack-and-Slash Star (another printed copy) so I could use it as a way to keep all the pieces straight. Here you see five different star fabrics. 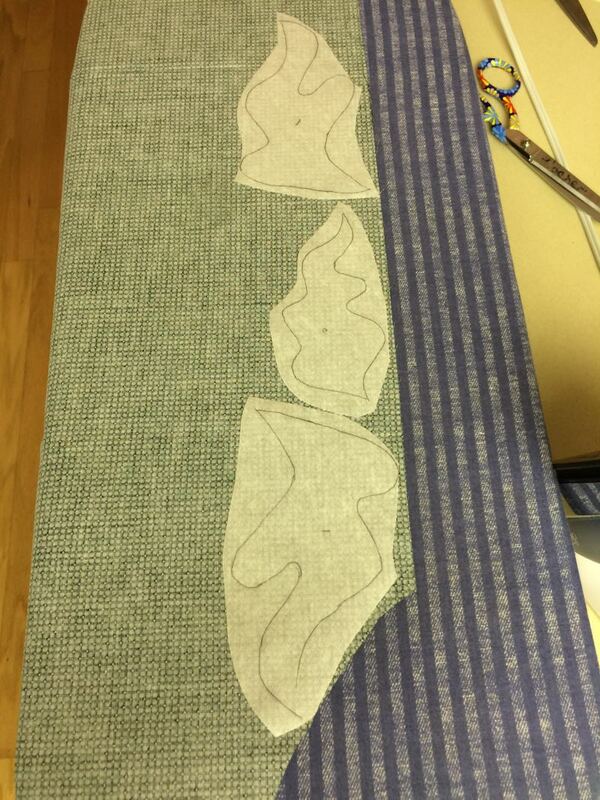 I cut, then laid out the five different background fabrics, too. First we’ll do the BACKGROUND fabrics. Leave the star fabrics along. 1–Leave background stack A3 (upper left in this photo) alone. Starting with stack A2 (upper right), take the top fabric and move it to the bottom of the stack. Now move around the star in a clockwise fashion (or refer to the photo to the left which has the pieces listed). 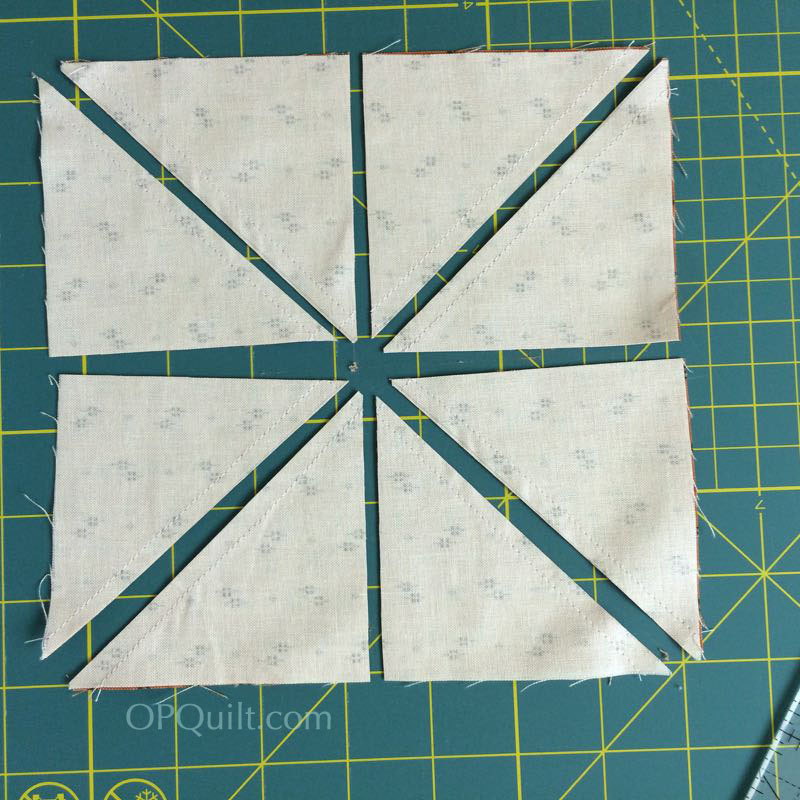 2–Take C2: Take the top TWO fabrics and move them to the bottom. 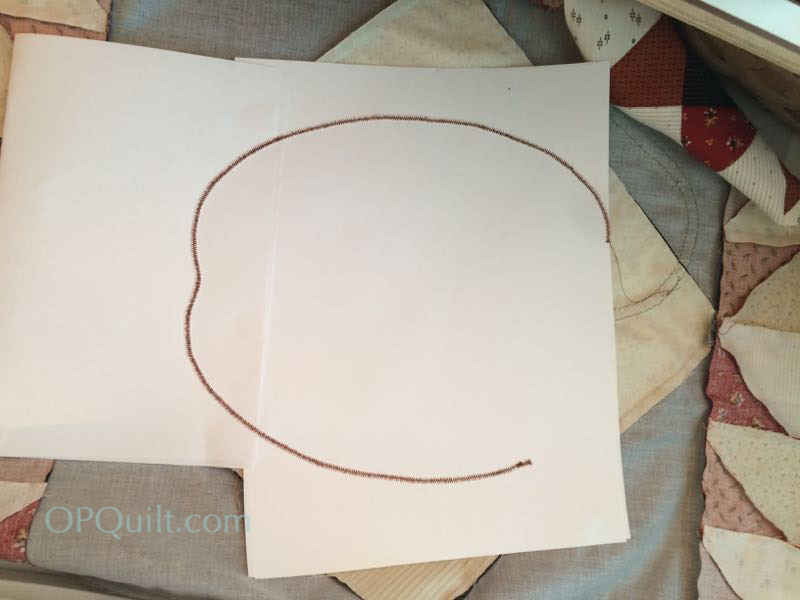 3–C3: Take the top THREE fabrics and move them to the bottom. 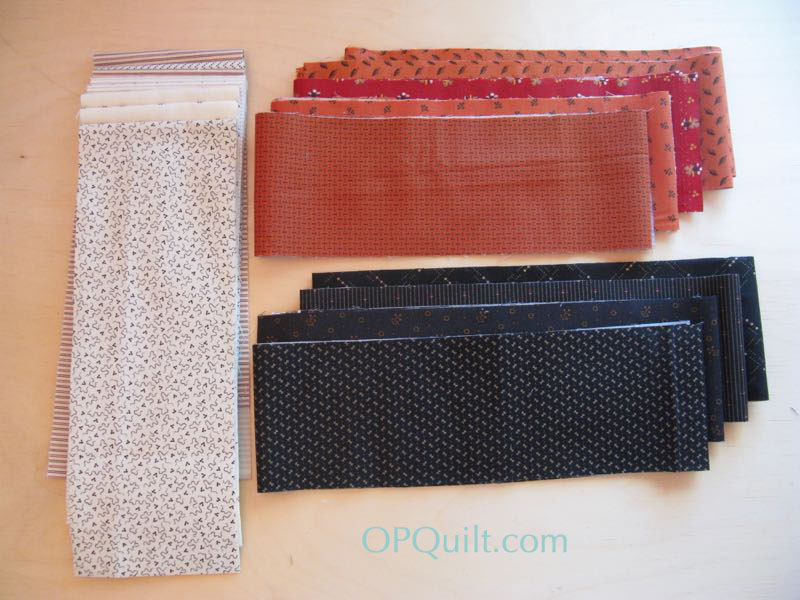 4–B3: Take the top FOUR fabrics and move them to the bottom. 1–Referring the map above, start with A1 (leave it untouched). 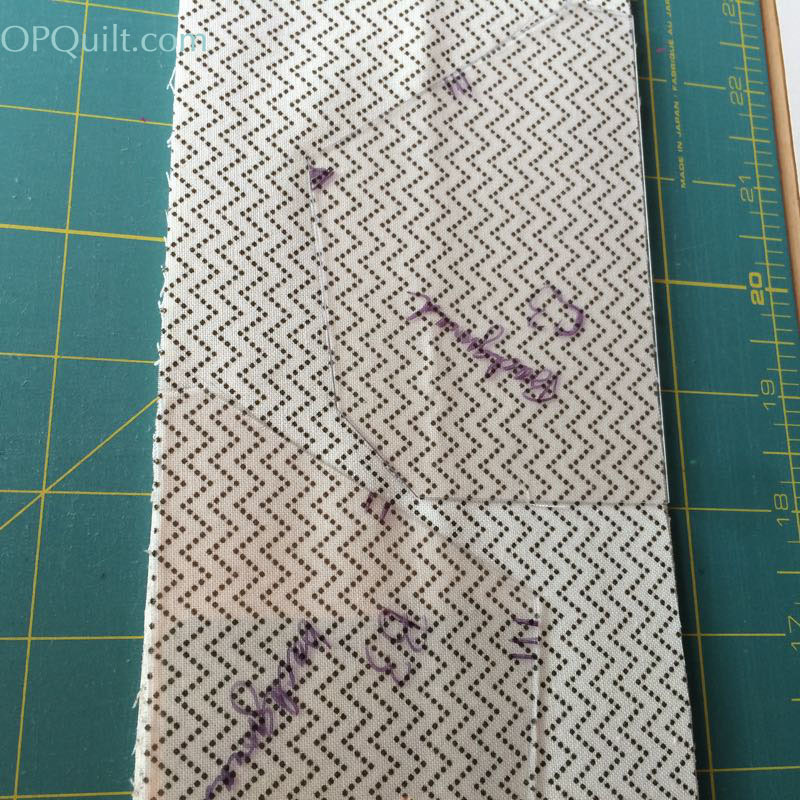 2–B1: Take the top fabric and move it to the bottom. 3–C1: Take the top TWO fabrics and move them to the bottom of that stack. Now keep reading. 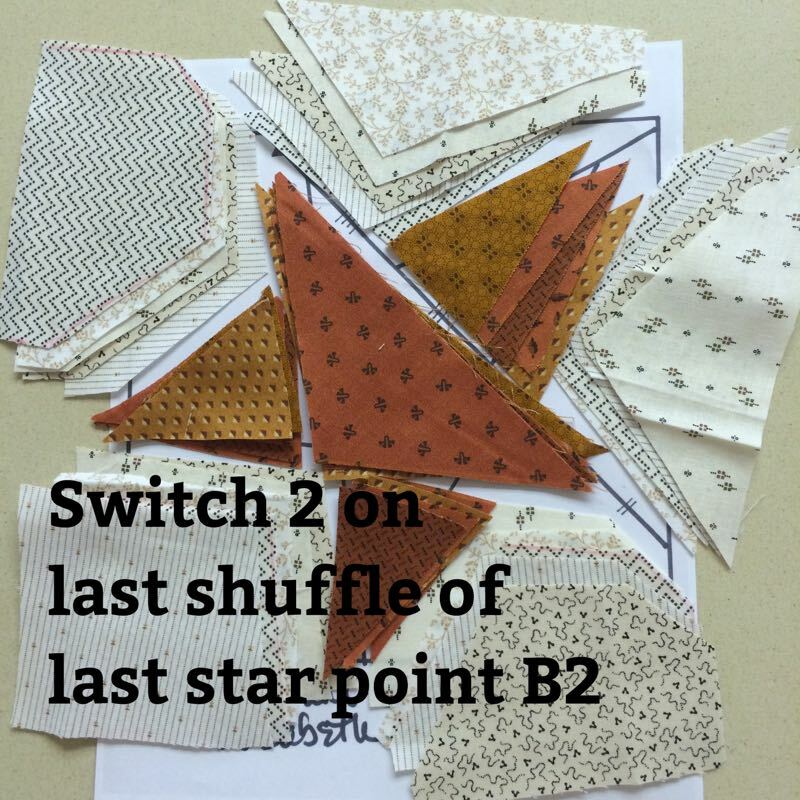 4–Since you have FOUR star pieces, you’ll need to do some switch the the top FOUR fabrics on the piece B2, and move them to the bottom of the stack. I don’t know why, and no, this isn’t the Gospel Truth, and yes, I could have said it wrong, but that’s what I did to get them all different. This way, when you sew that last star (star #5), you won’t have two the same on the last one. If you do it differently, please let us know in the comments. If this is all too confusing, on YouTube there are multiple videos — just type “stack and slash,” or “stack and whack.” If you have a lot of time, *this* one is in four parts, but it’s very thorough. Now we start sewing them together. Sew the A parts together. 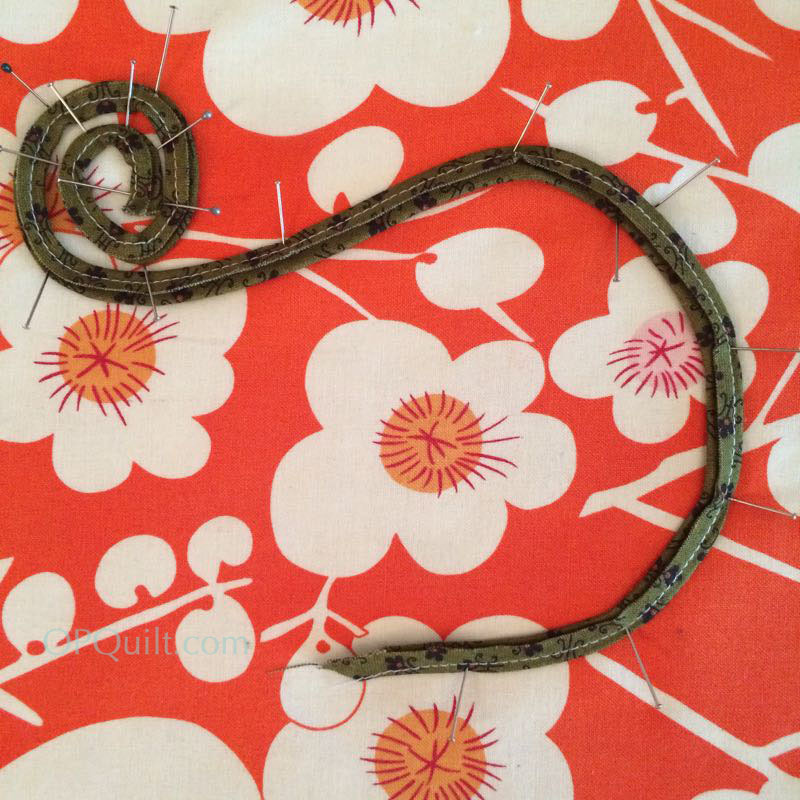 Sew the C parts together. Some sections need straightening up before I sew the next seam. If they are too out of whack, just even them out. Now all the B-pieces are sewn together. Sew them to the C-pieces. I evened out that edge. Notice that monster dog ear at the top right. Don’t even worry about it–just slice it off. Join the sections together, pressing the seams to one side. All the outside edges are skitty-wampus, but it’s all sewn! Now it’s time to even them up to our Gold Standard Measurement of 5 1/2″. Find the A1 piece and put that in the upper angle corner and then monkey your ruler around until you have a nice mostly-even space around all the start points. I put tape on the 5 1/2″ mark so I could frame it up better. Now you see better how I laid it on the wonky star. Repeat this over and over. You can cut and sew a bunch and it goes much faster, but have chocolate at the ready. 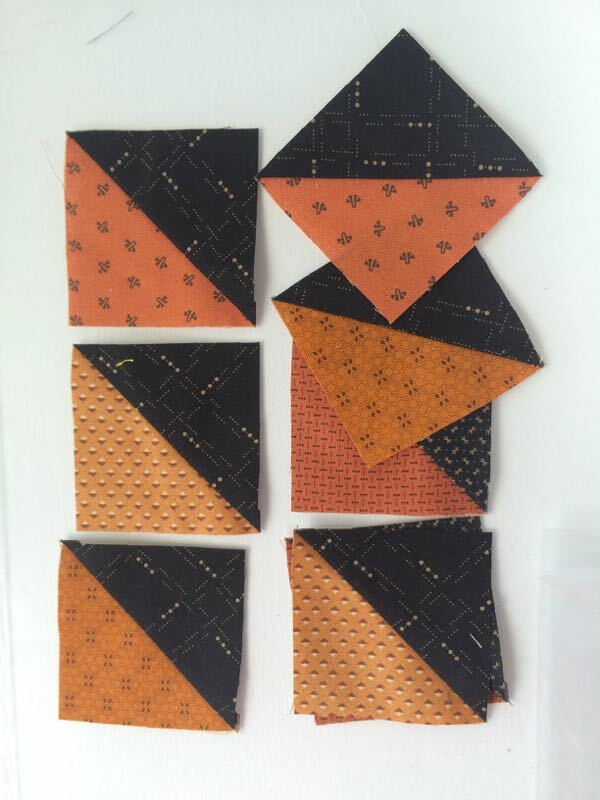 Add on your outside large triangles, varying them from orange to black, as are your star points. We’ll save the outside HSTs for next month. So, get busy making wonky stars and we’ll see you on June 13th! 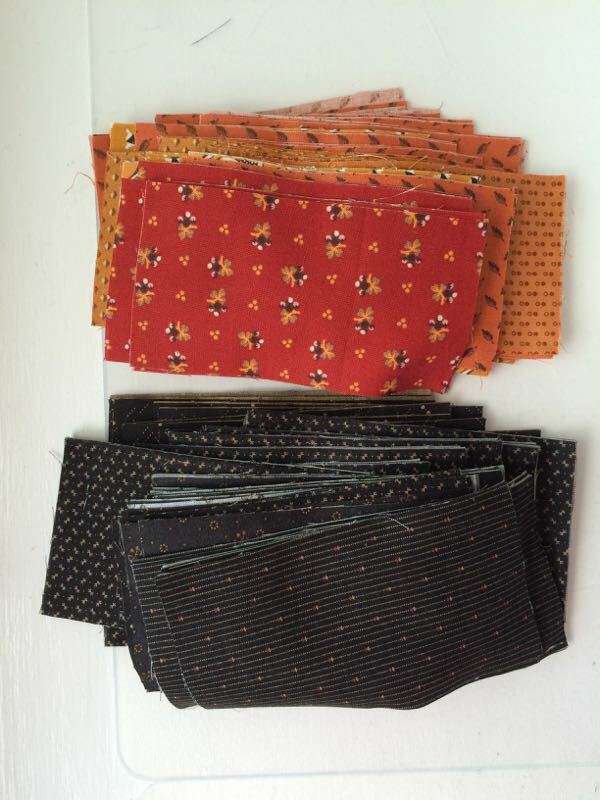 Step 1 (Preparation): February 13, 2016–buy all the fabrics and find the pattern. 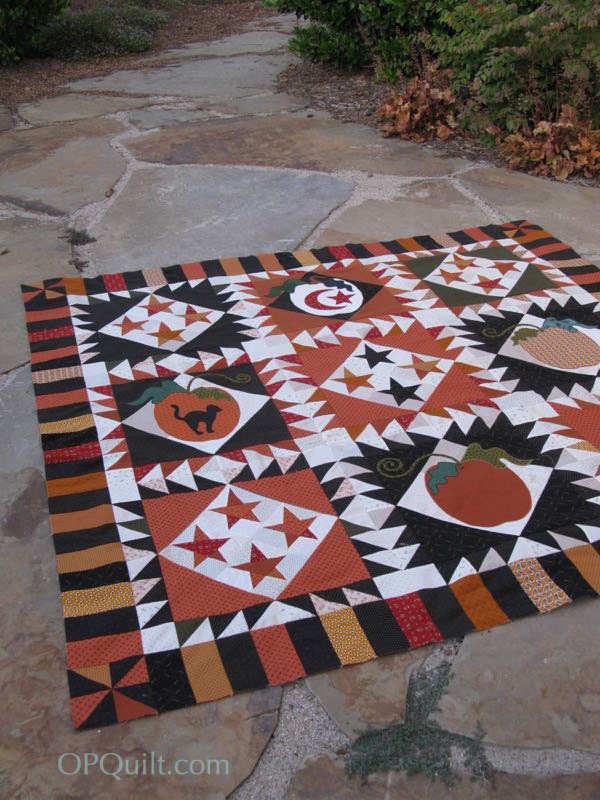 Buy your pattern from The Primitive Gatherings Online. Link is *here. 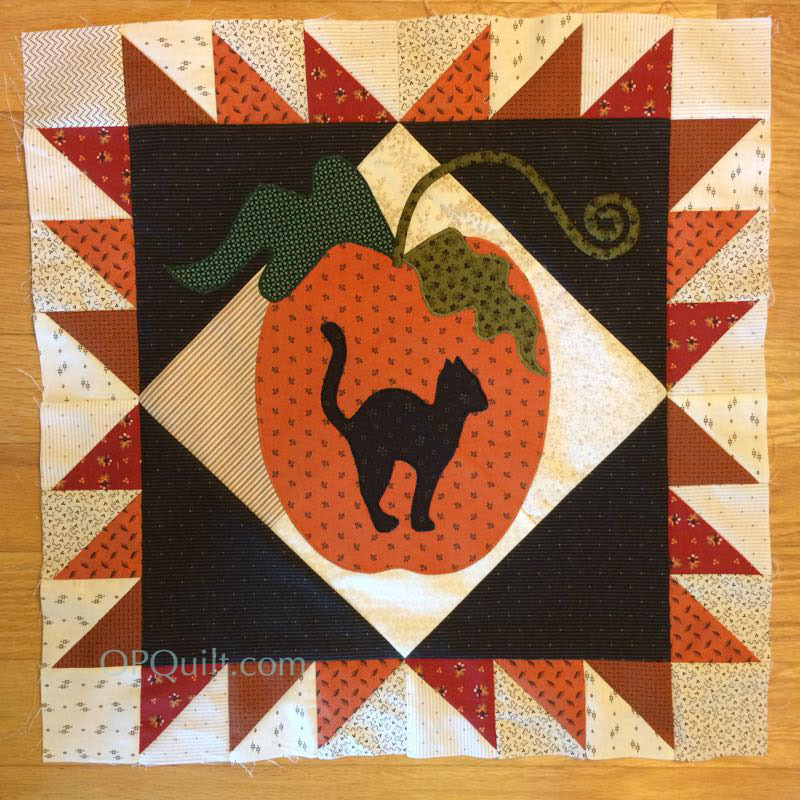 * The quilt measures 90 by 90, which is too large for me, so I’m only doing nine blocks. 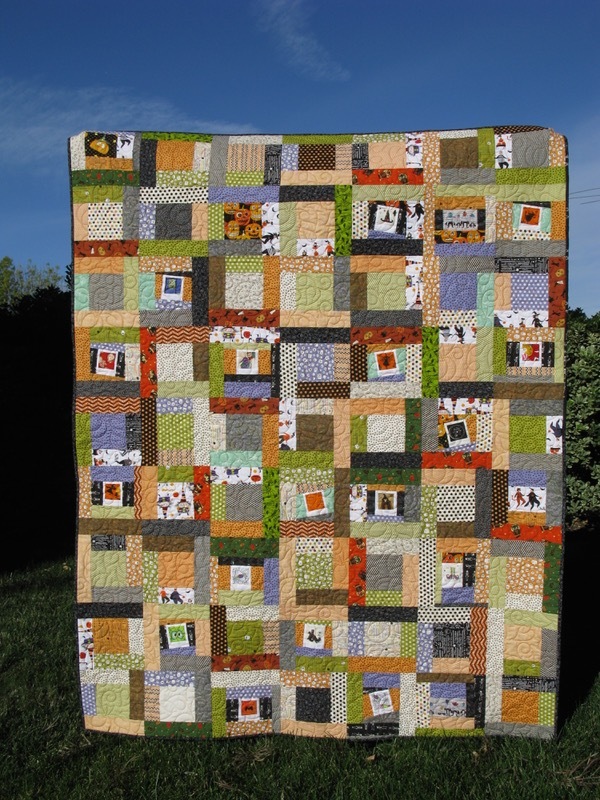 Each block is 20″ square, and with the outer borders, that should come to roughly 65″ square. I may change my mind, but this looks good from here. 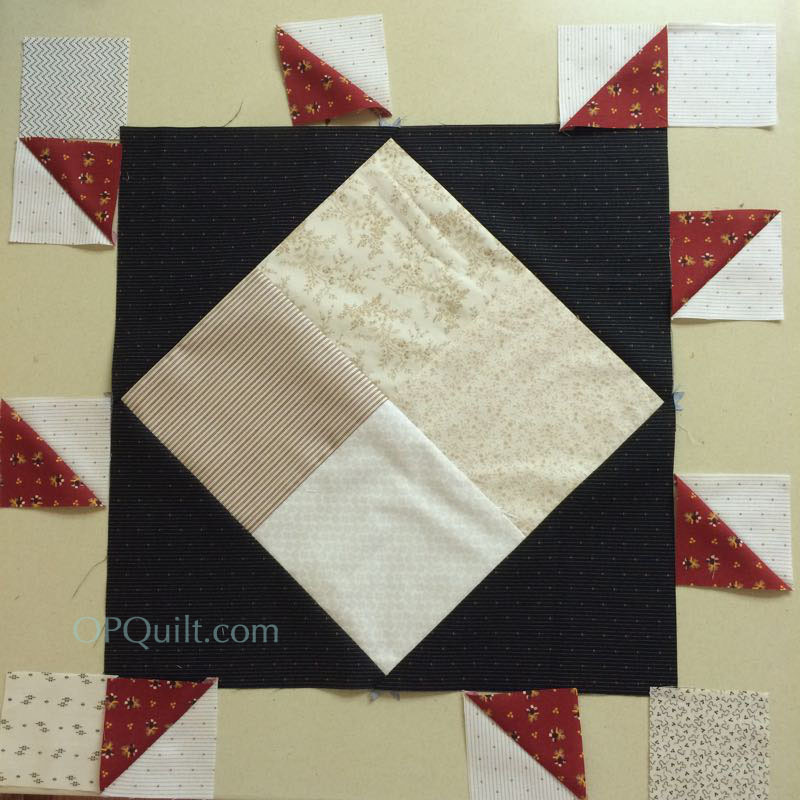 Step6: July 13, 2016–Arrange the blocks on your design wall and stitch together. Cut the pieces for your borders. Make the four corner pinwheels. 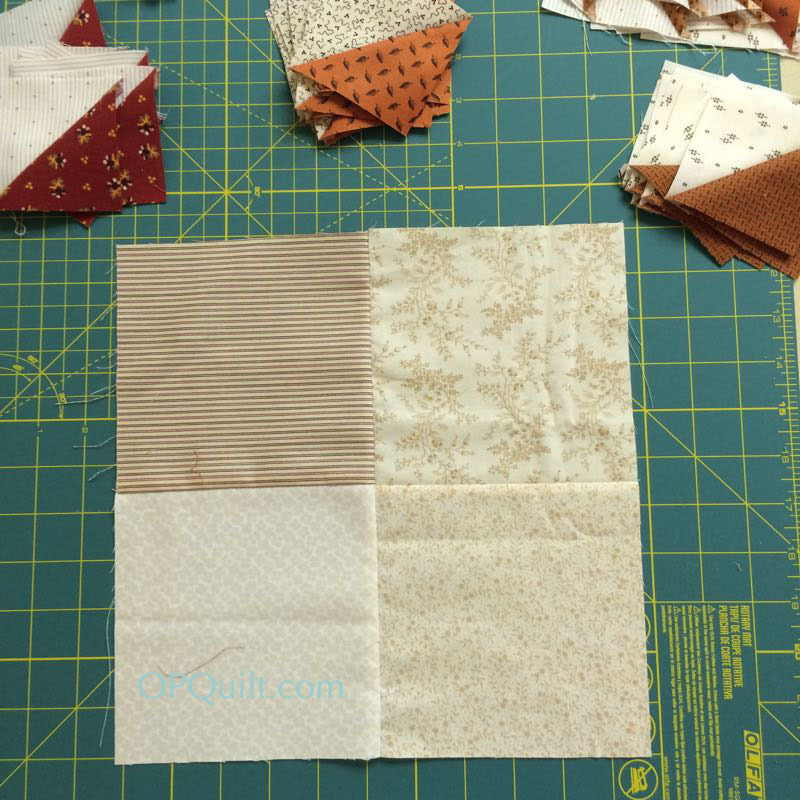 Step 7: August 13, 2016–Sew borders together and attach them to the quilt. 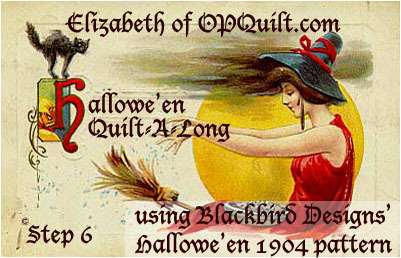 Posted on April 13, 2016 by Elizabeth E.
Welcome again to the Hallowe’en 1904 Quilt-A-Long. 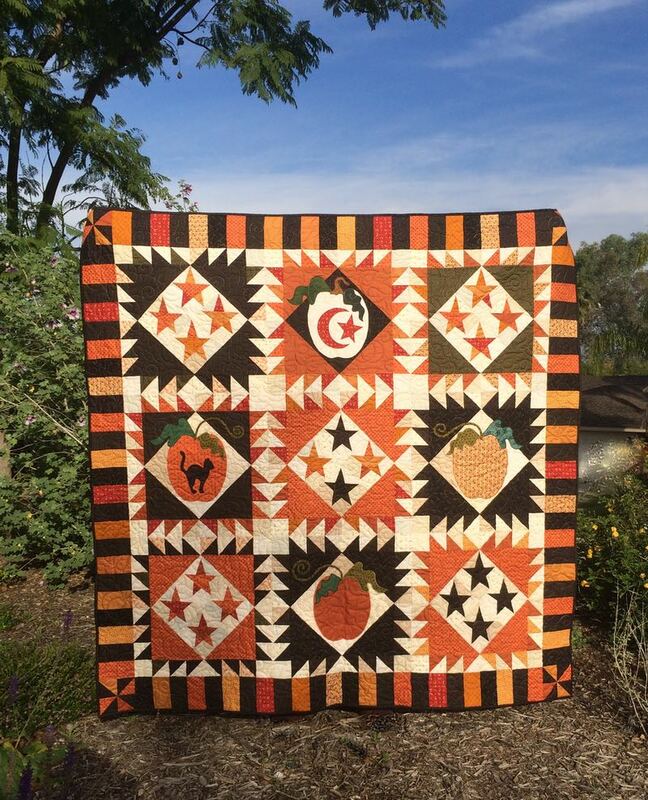 And of course, it’s lovely springtime in Southern California, so that really makes us feel like working on Halloween stuff, but we agreed to work early so we could hang our quilts up at the first of October, not the last. 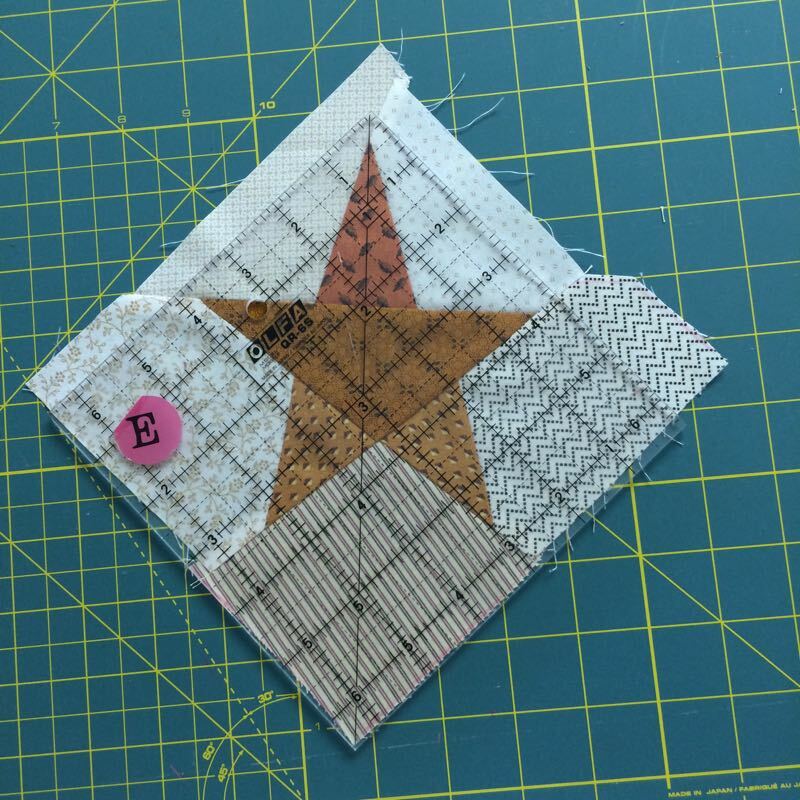 While the original quilt has twelve blocks, my friend Leisa and I are making a quilt with nine blocks, and so have adjusted all the quantities accordingly: four blocks with appliqué and five blocks with stars. In Step One, we gathered supplies. In Step Two, we did all our cutting. 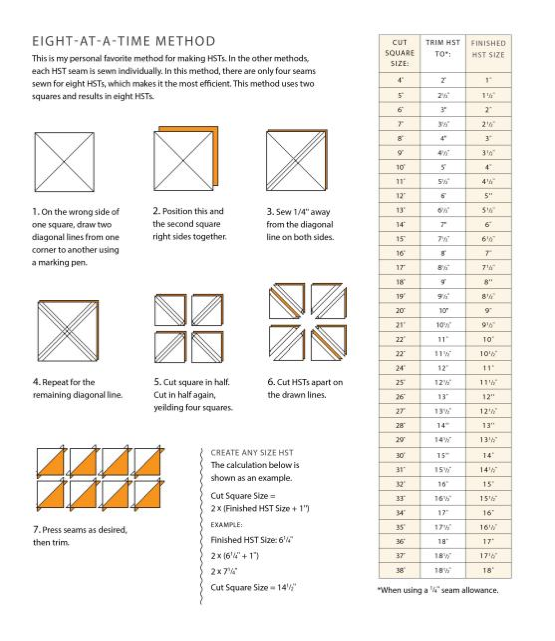 There is a cutting chart you can download and use to guide you. 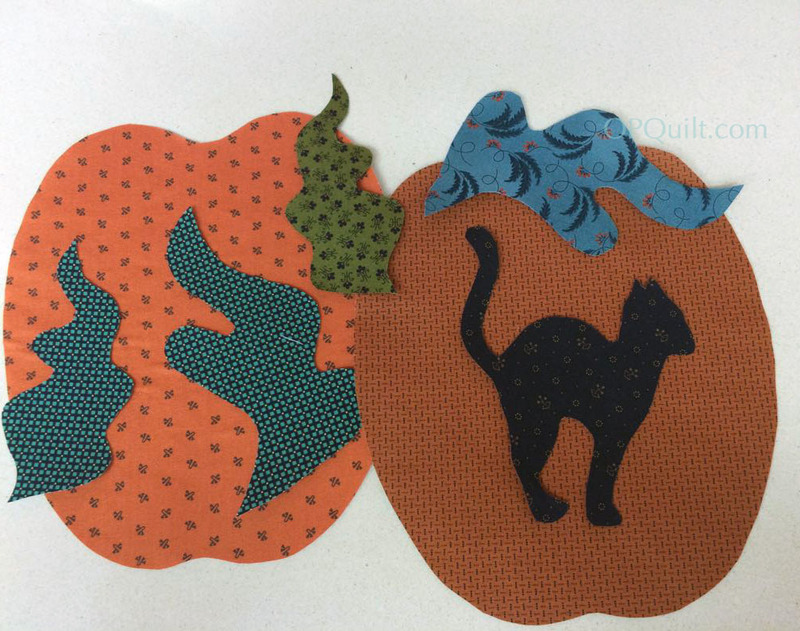 Now, in Step Three, we making the appliqué blocks with the Halloween shapes on them: pumpkin (2), pumpkin with cat (1) and moon and star (1). 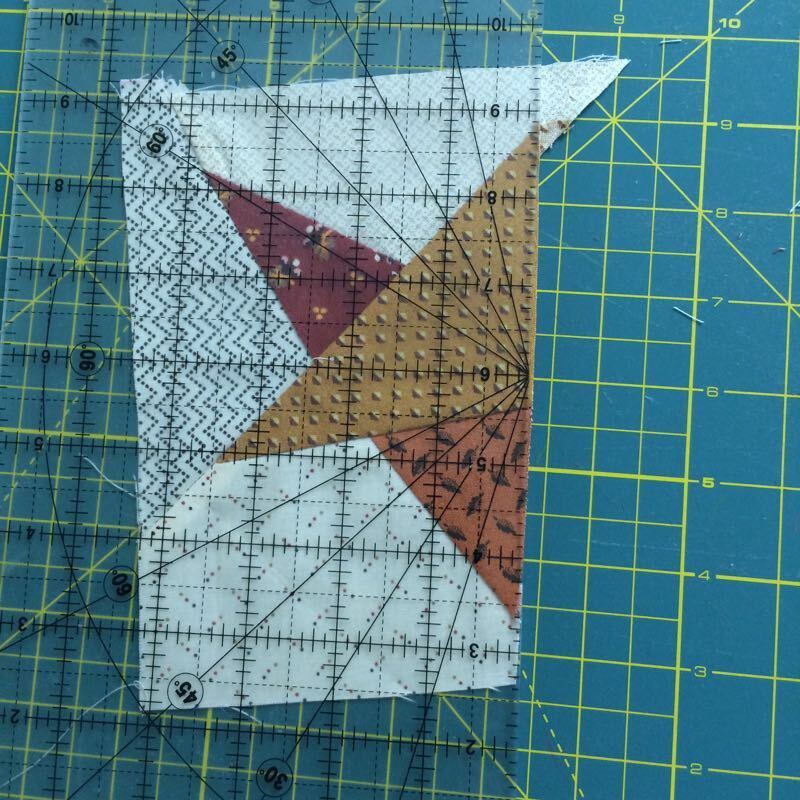 We’ll also talk about how to make half square triangles (HST) more efficiently, and then about appliquéing the whole thing down. Here we go. 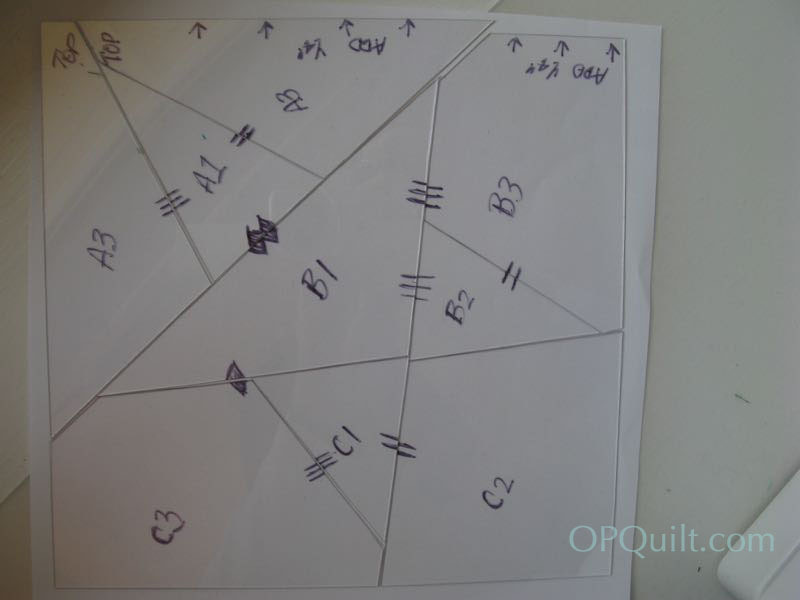 Leisa came over for an afternoon, and we started by tracing around all the templates, getting our motifs organized. We decided to add a black cat to our pumpkin, so here is the PDF file: Halloween Cat. Print it at 100%, so it ends up about six inches tall (or tweak it to make it bigger or smaller–whatever you like). We wanted the cat facing to the right, so flipped it over and traced the outline on the back with a black marker pen. 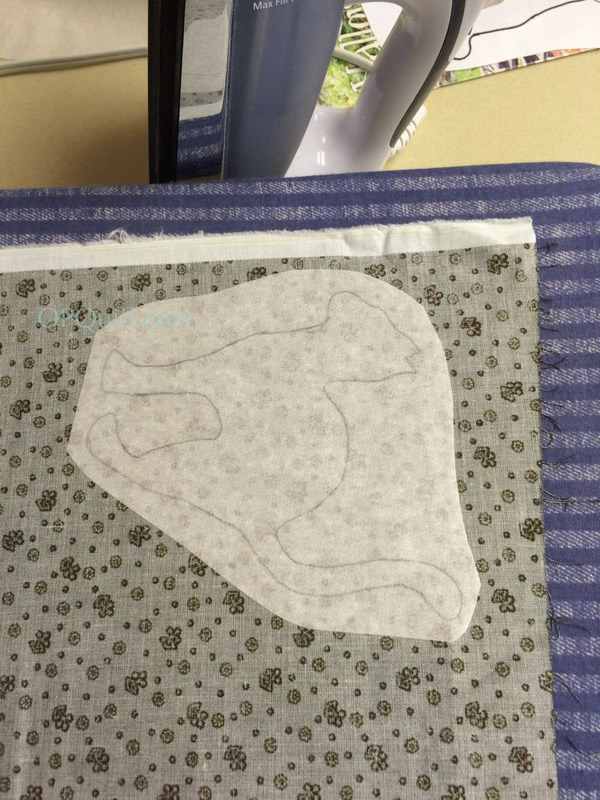 Then Leisa traced it out for us on the fusible stuff. Remember that it has to be backwards, to be facing the right way. We used Steam A Seam 2, following their directions of which paper to trace onto, and then cut the shape out loosely, after which we ironed it onto the back of the fabric. I recommend using either a pressing cloth, or a larger piece of their release paper so you don’t get any gunk on the iron. Cut out all your shapes and then set them aside. 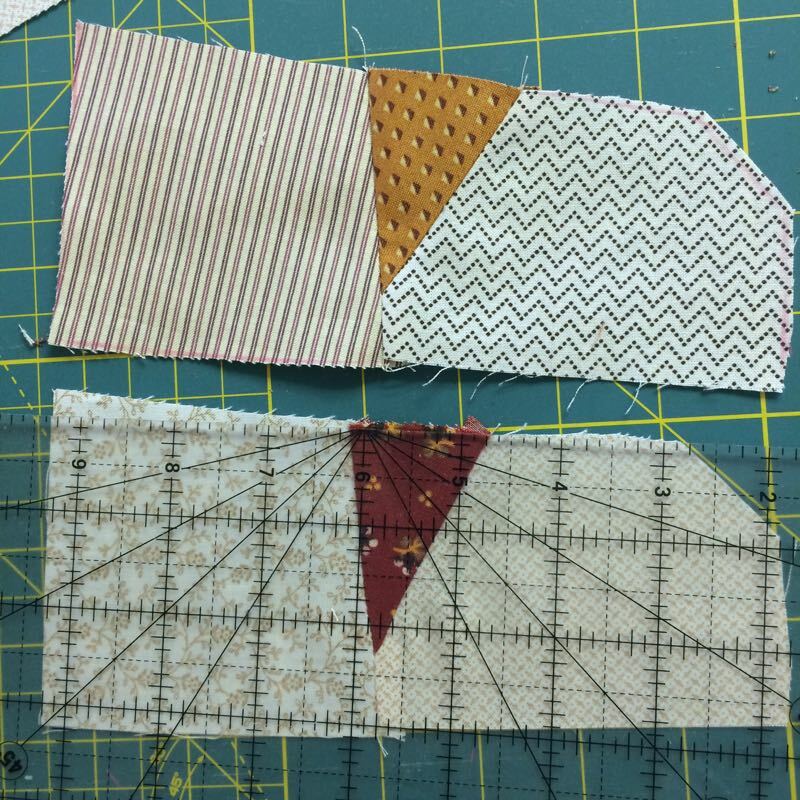 So basically, you draw two lines across the two diagonals of your block, then stitch 1/4″ away from either side of the line. It looks rumply because you’ve been sewing on the bias. Take it to the ironing board and press and steam out the block so it lays flat, and the stitching is nestled into your fabric. Now you’ll be cutting across the block in two ways, as shown by all these extraneous photos. I’m sure you’ll get it after seeing all these. First cut side-to-side and top-to-bottom. Don’t slide them apart–mine are that way just to show you. Then cut along your penciled lines. Again, do it while everything’s together. Mine are apart for illustration purposes only. Take the triangles to your ironing board and press to the dark side (insert Star Wars reference here). 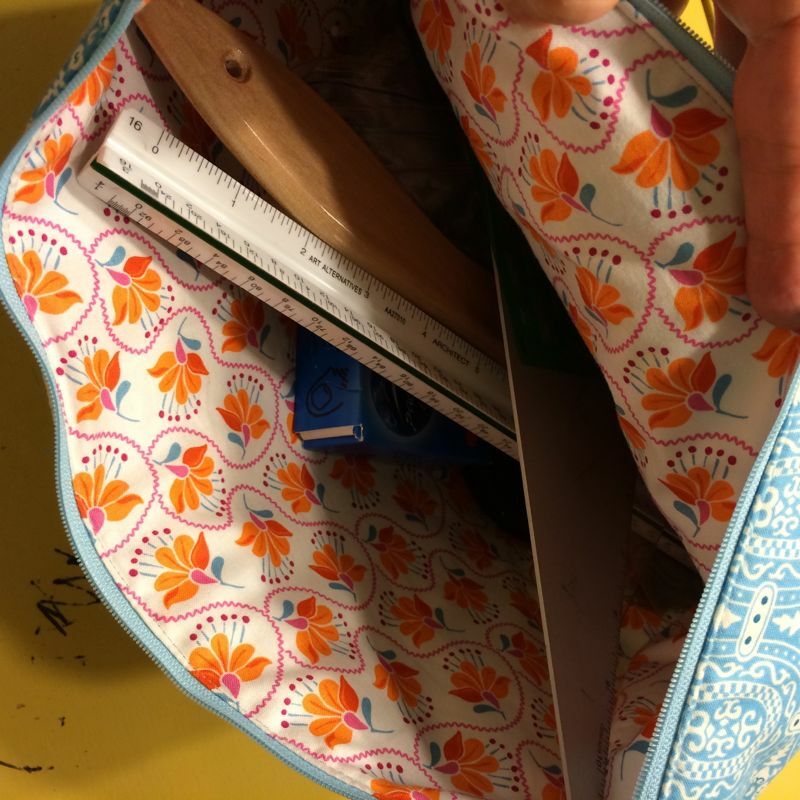 I use a Bloc-Loc ruler (6 1/2″ size) to true them up to 3 inches square; it has a groove in it that fits neatly over your seam and makes truing up much easier. 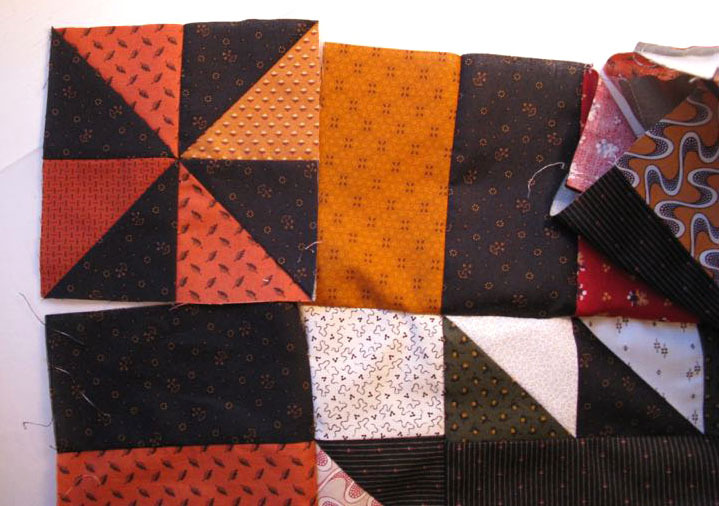 You’ll need three sets of these blocks for each large block in this quilt. You’ll repeat this process, choosing different darks and different lights. Let’s do that math again. Each Eight-at-a-Time square makes. . . 8 HST. 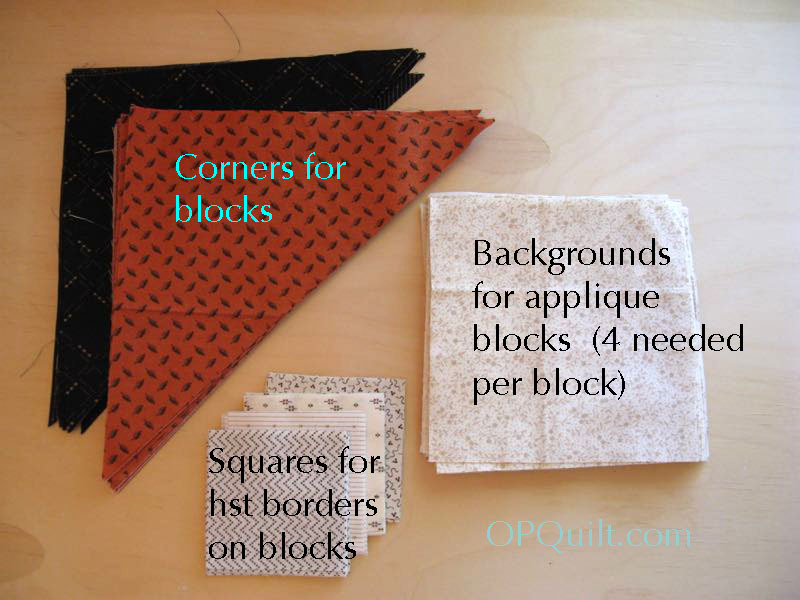 You need 24 HST per quilt block, so you make three sets. 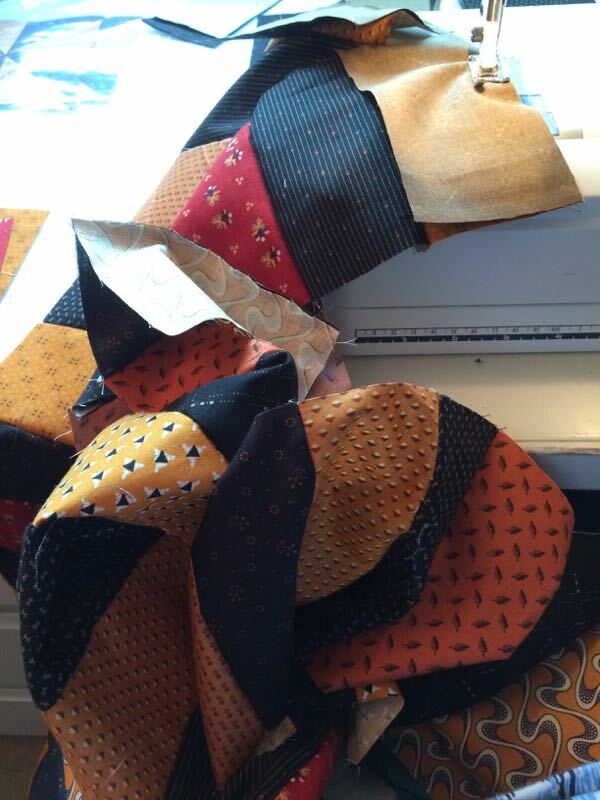 I tried to vary my fabrics, using three different lights and three different darks (or oranges). 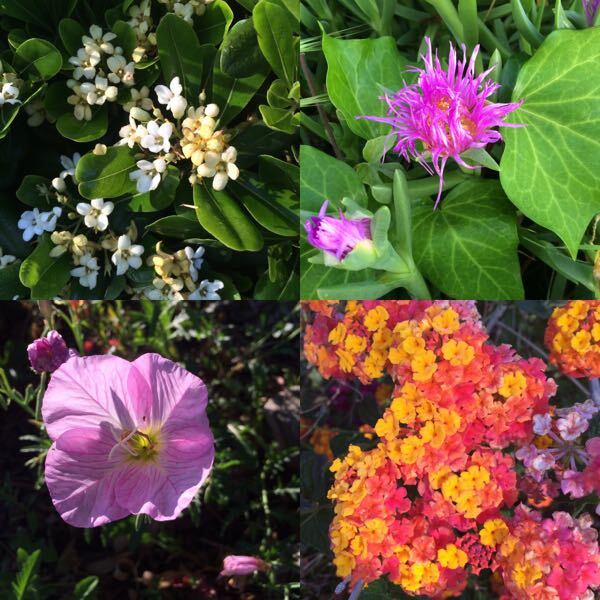 You’ll find out why you want variety in a minute. 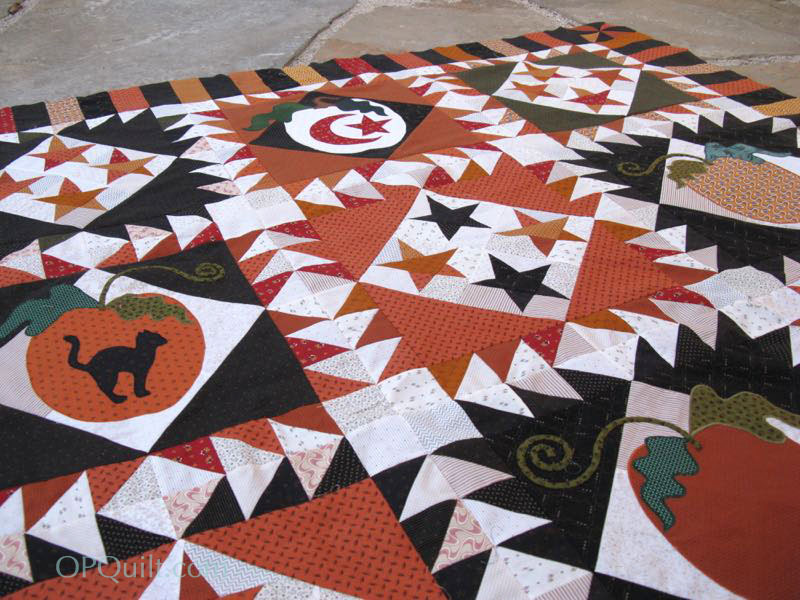 After they are all trued up to 3″ square (all 24 per block), set them aside. 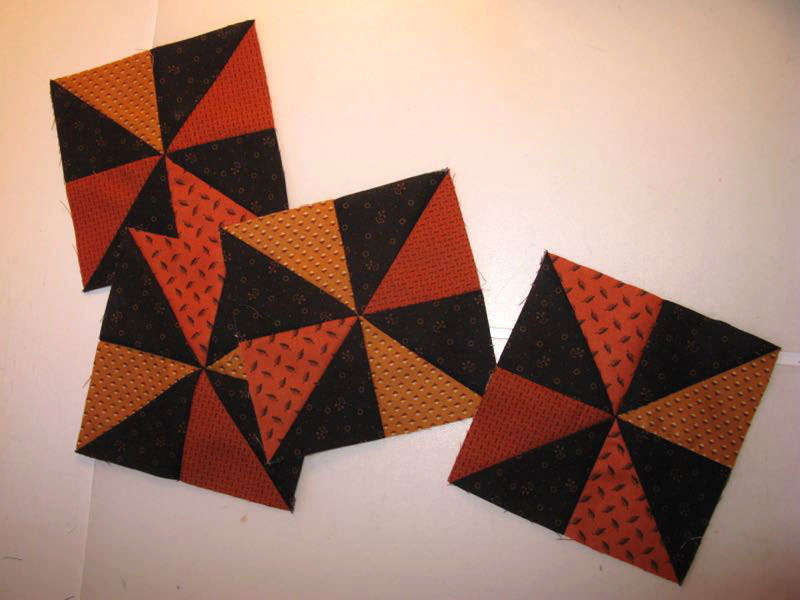 Choosing either black or orange, sew on four large triangles, two at a time, to your set of four light squares. 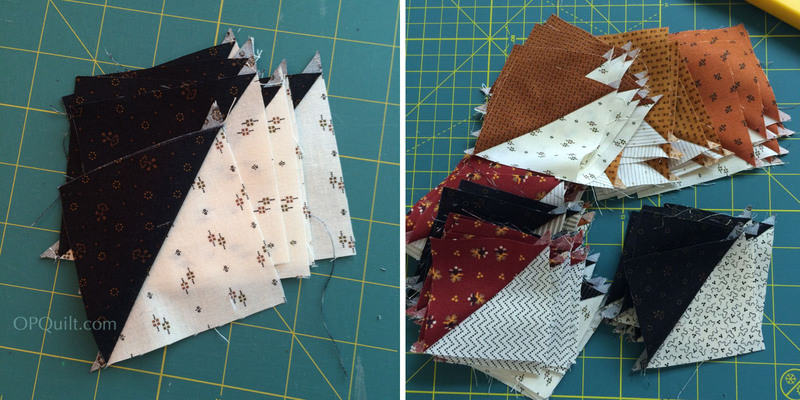 Grab your stack of HSTs. Starting with one set, distribute them around the block, two per side, spacing them randomly. I also put my smaller corner blocks down, so I can make sure to keep everything as random as I can (trying NOT to match the fabrics, but sometimes it happens. If it does, don’t fret). Here’s mine (orange HST) and Leisa’s (black HST). 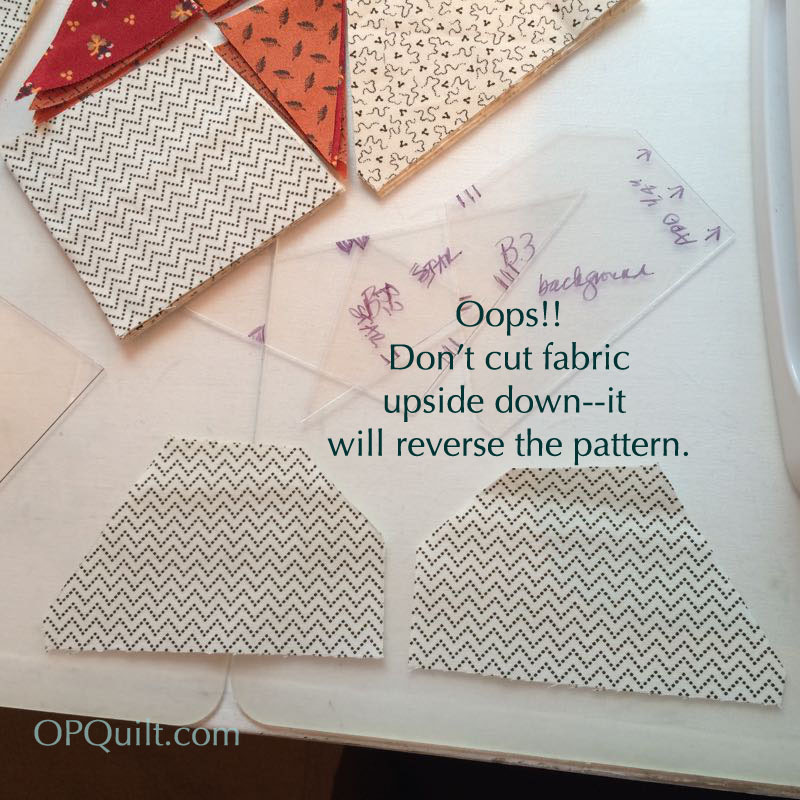 Start with the lower edge of triangles; sew them together in a strip. This goes on very smoothly if you are using a 1/4″ seam allowance when you stitch (not 3/16ths” and not 5/16s” Strive for accuracy). Press to the dark side (okay, I couldn’t resist). Matching up that center spot, pin, and then stitch the row onto your larger block. Press toward the larger block. Now for the side rows: pin, but add on the corner blocks on each end. 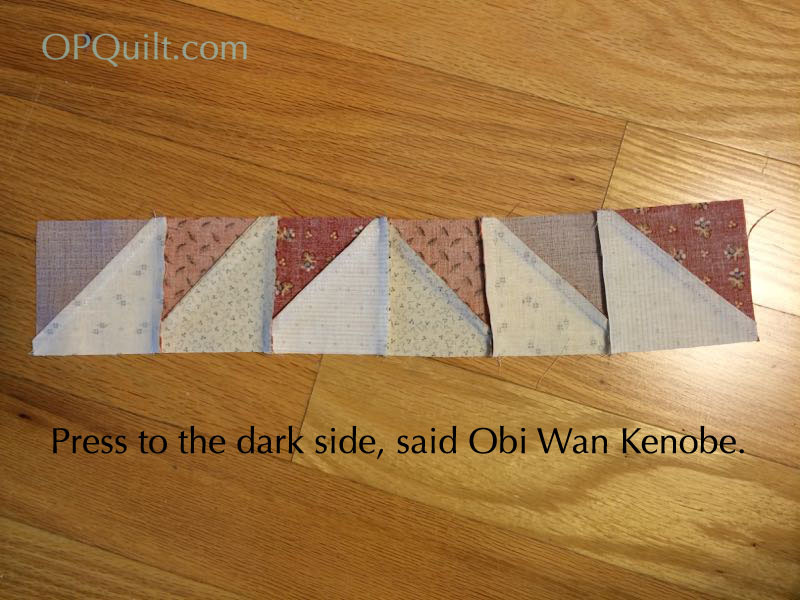 Press the row’s seam allowances toward the dark side EXCEPT for those corner blocks. On those, I pressed toward the corner block, so that putting this together would be easier (the seams will nest–you’ll see what I mean). Now attach them to the larger block, matching those corner seams, and stitch. Press toward the block. Get your cut-outs, and start playing. Remove the backing paper and you’ll find it easier, as the fusible stuff is tacky and will adhere lightly as you arrange and re-arrange. When you like where things are, fuse them to your block, following the directions that came with your fusing product (I use a cotton setting, lifting the iron on with an up-and-down motion until it’s adhered, but don’t mash it flat and sear it into the cloth. Easy does it). Now it’s time to make that curlicue vine/stem. 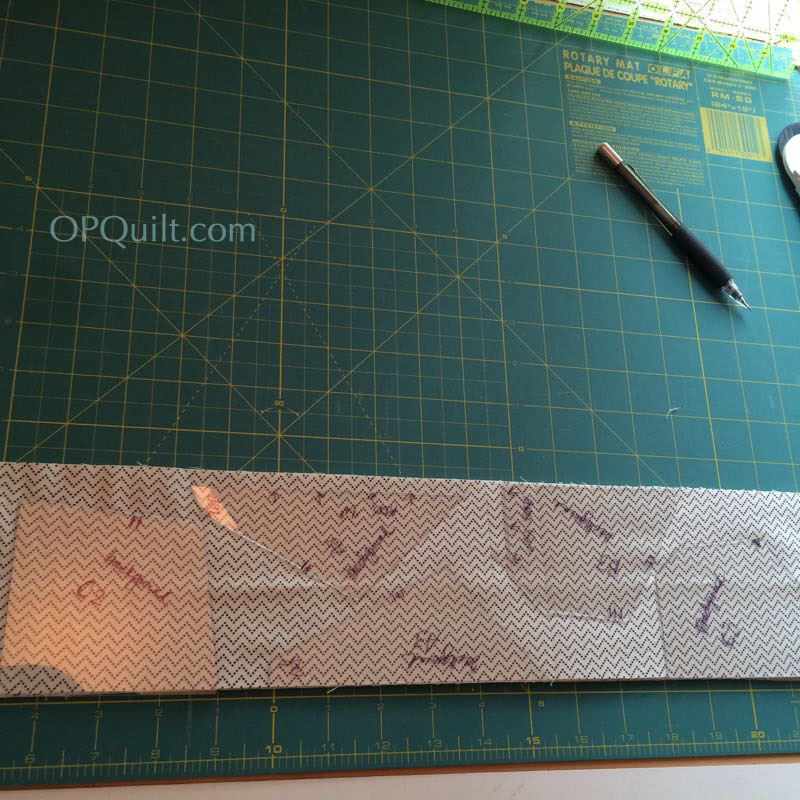 Cut a bias piece of fabric, 1-inch wide and at least 14 inches long. Fold it in half, with the right sides outside. 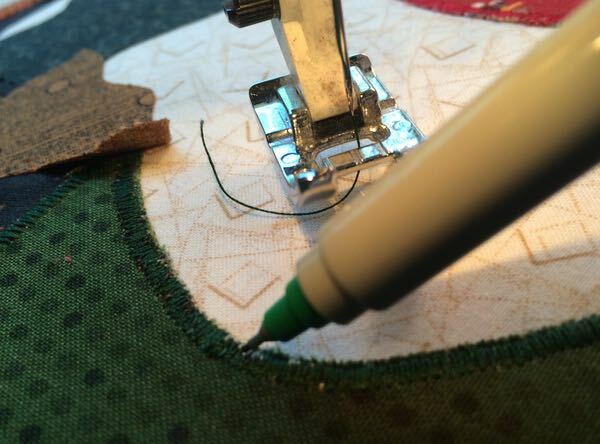 Stitch in fat 1/4″ seam. 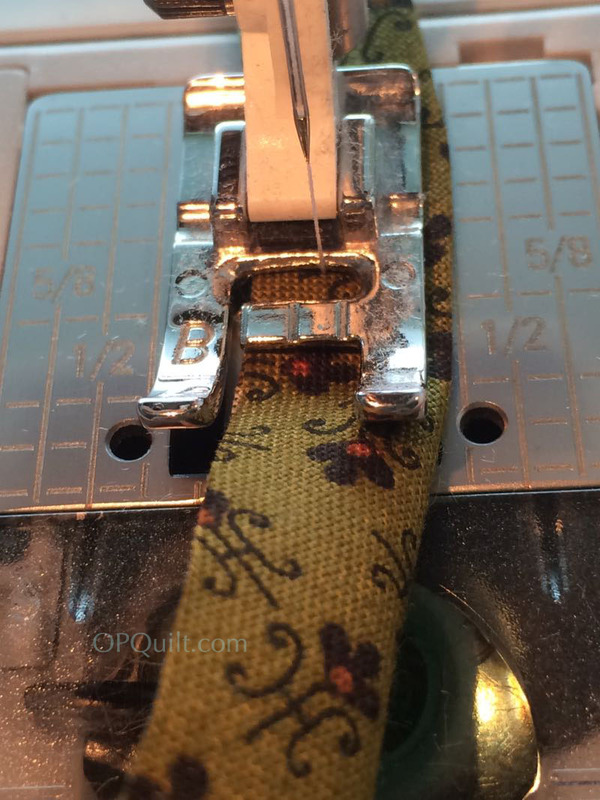 I use bias pressing bars and insert them into the tube, rolling the seam allowance to the top. Press lightly. Remove the 1/4″ bar, and press the bias lightly. You don’t want to mash it flat, but you do want to set the bias tube so the seam remains to the back side. 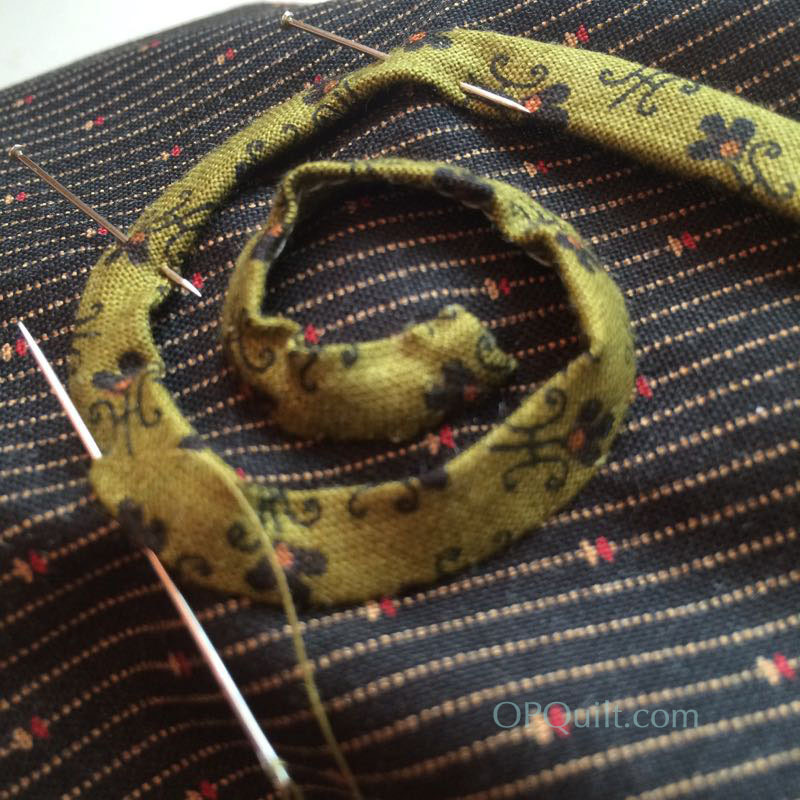 On a padded surface (I use my ironing board), coil and pin one end fairly tightly, then using the pattern pictures as a guide, loosely curve the curlicue stem the other way. Steam it with your iron, then let it cool. Remove the pins. Drape it/arrange it/fiddle with it on your block. I concentrated more on the coiled up section, then let the curve artfully drape back to the center of the pumpkin, not worrying about how long it was. I decided to sew it down by hand. 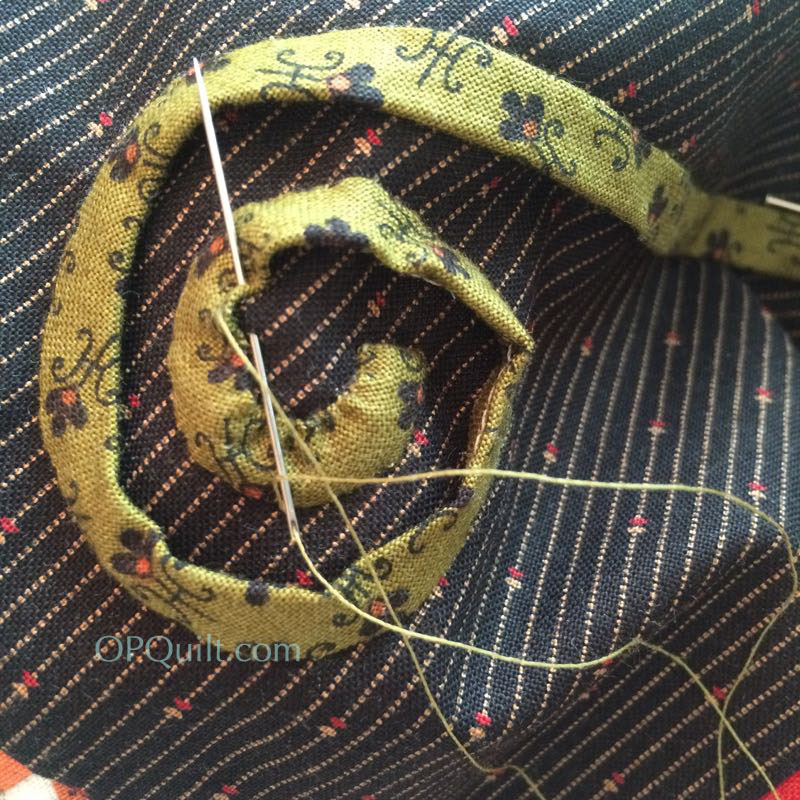 First sew the outer edge, then the inner edge (shown below), coaxing that inner edge flat with nudges from your finger and by taking smaller stitches. You are not necessarily aiming for *flat* but more for *nice curve. * After stitching it down, give it a little steam from your iron to press it lightly. Next one is prepped up. I cut off the extra stem about 1/2″ below the pumpkin’s edge and folded this end (as well as the inner coil end) under 1/4″ and tacked the edges down. 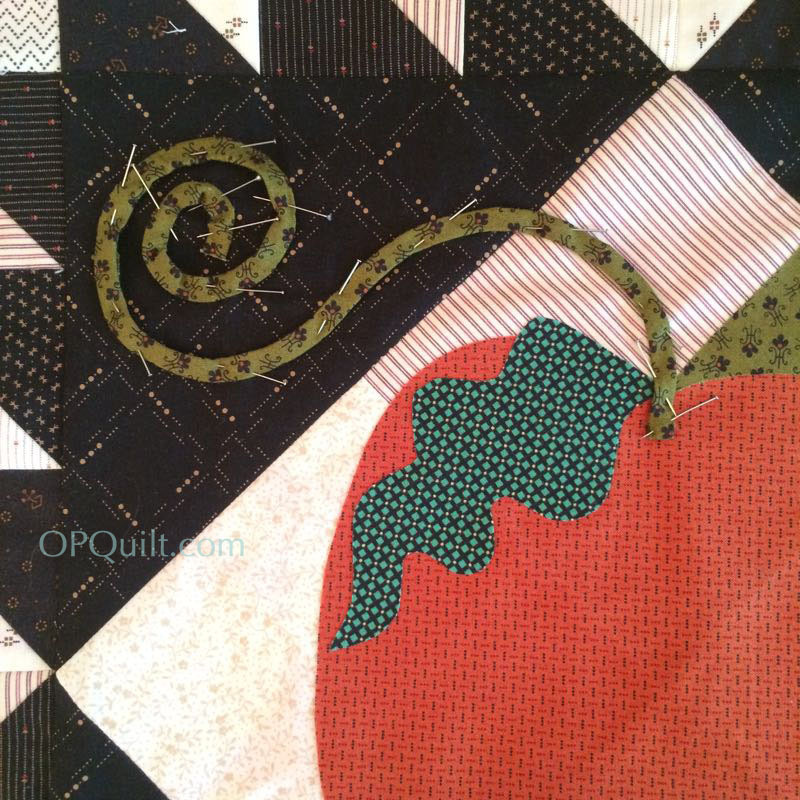 I’m not a huge fan of machine-done buttonhole stitch, although I really like it on others’ quilts. If you are skilled at that, try that stitch. For me, I went with a medium-wide satin stitch, my needle just over the edge of the piece. I lifted up a leaf a bit as I got to the end, another advantage of not searing your applique piece into your fabric. I ironed it back down again after I was through. Here’s my secret to getting even appliqué stitching without having the bobbin thread pull up to the top: two sheets of computer paper. It also prevents stretching as you stitch. 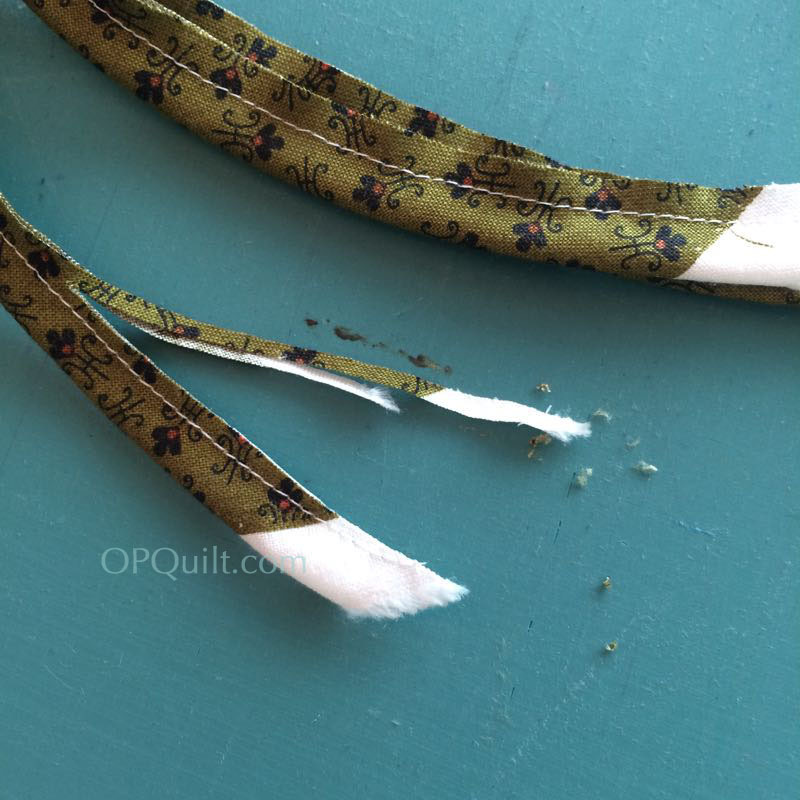 I’ve backed all my stitching with this for years and years and years–it comes off easily, like tearing perforated paper, and makes your stitching nice and smooth. 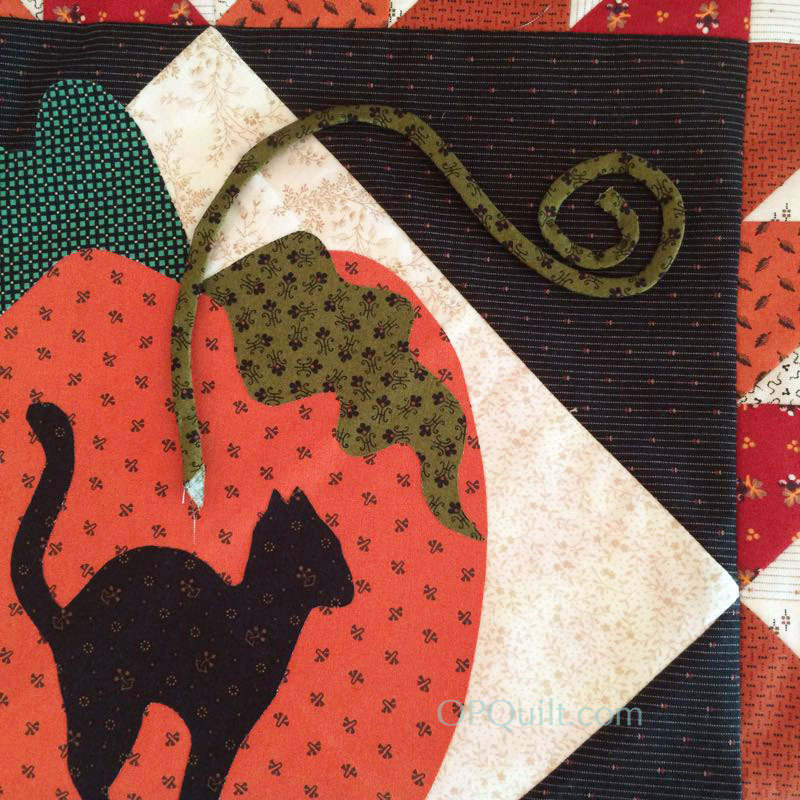 After stitching down the pumpkin (the shape at the bottom of the stack), stitch down your leaves (next layer up) and finally, your cat. 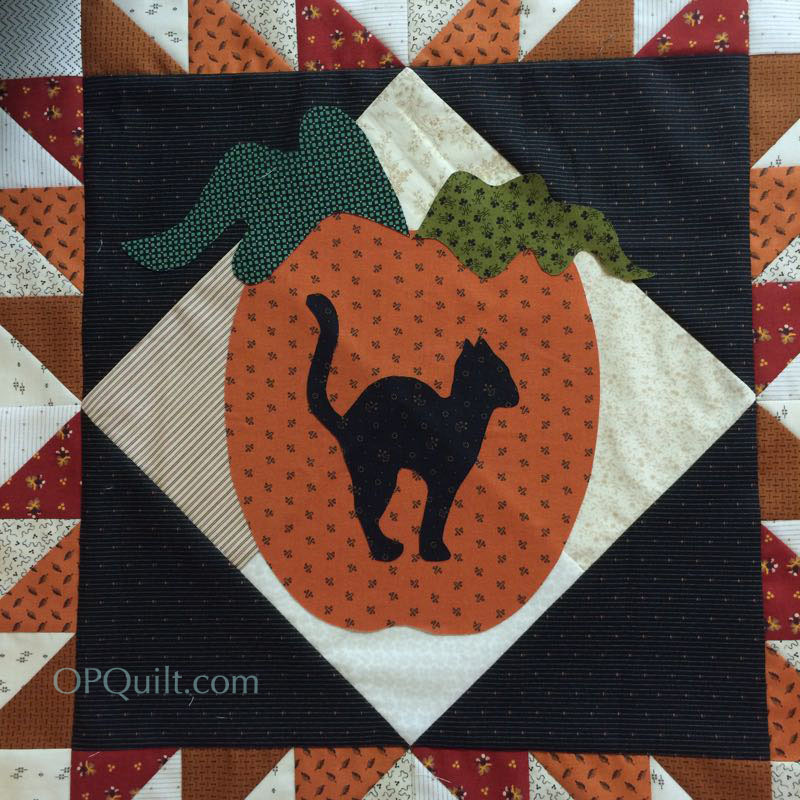 In some quilts, I’ve seen a star in the middle of the pumpkin. Well, that’s it for this step: because we’re doing nine blocks, we chose to do four with cut-out motifs. You’ll need to adjust whatever you’re doing to the number of blocks you’ve chosen. Close-up of my appliqué. If truly this bias thing is driving you mad, feel free to try Thelma’s method of drawing a shape and fusing it down. Now I need to get busy and finish these! I have all of this month to do it in. 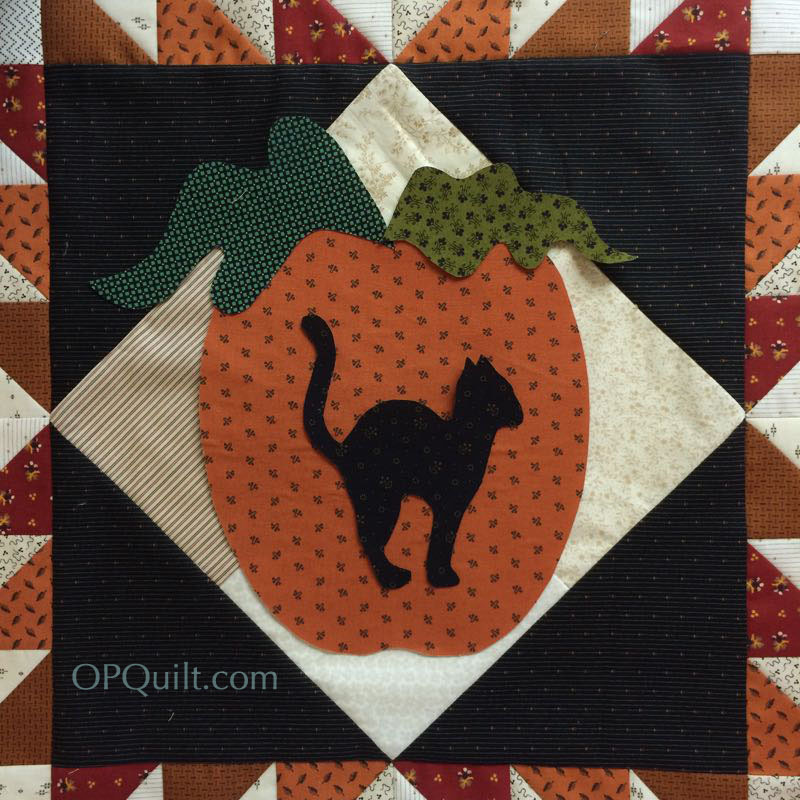 Next post in the Hallowe’en 1904 QAL will be May 13th. I plan to finish up these three, then make scads and scads of HSTs, getting ready for the next steps. Hope you can finish yours, too! Here’s my latest block. I cut down the moon because it needed to be more round (according to my husband and I always listen to him) and I smallerized the star, then put them both on a white pumpkin. I did two layers on that white pumpkin: the fabric you see and I underlined it with some cream solid fabric so the black wouldn’t show through. 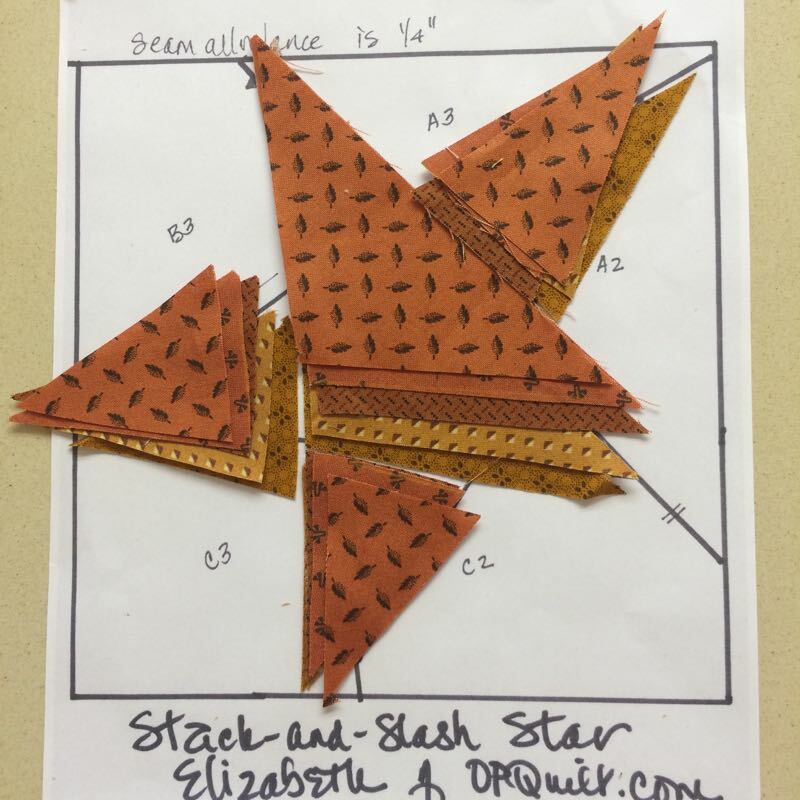 I created a stem (2 1/2″ inches high), and a smaller moon and star for inside the pumpkin (PDF file of the patterns are here: StemStarMoon_OPQuilt). Print it out at 100%. I’m much happier with things now. Don’t be timid about playing around with your pieces and colors until you find what makes you happy, too. 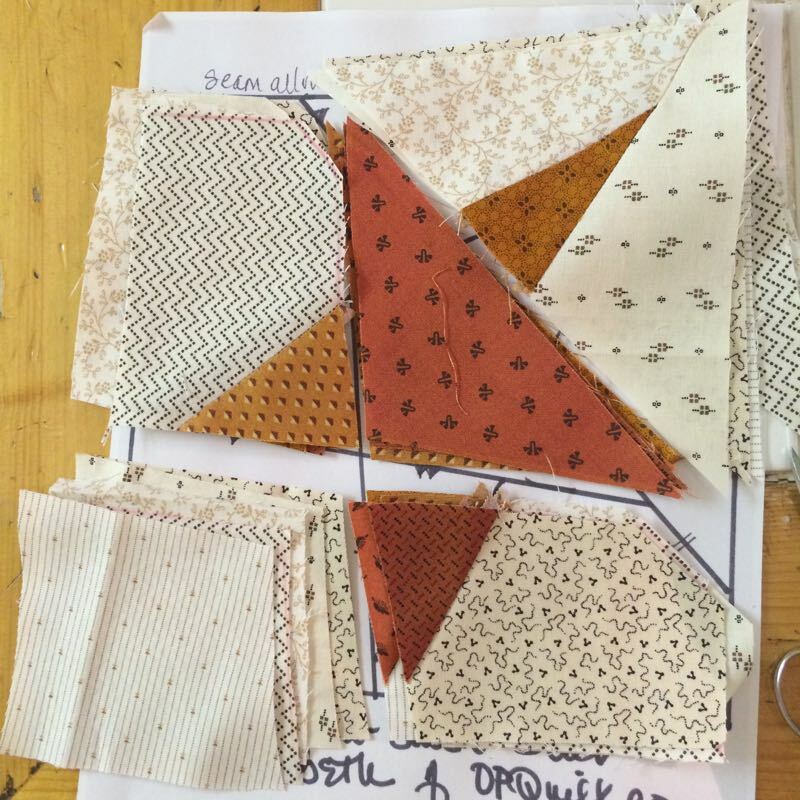 Step 1 (Preparation): February 2016–buy all the fabrics and find the pattern. Mine was purchased from Common Threads in Waxahachie, TX (www.commonthreadsquilting.com). The quilt measures 90 by 90, which is too large for me, so I’m only doing nine blocks. Each block is 20″ square, and with the outer borders, that should come to roughly 65″ square. I may change my mind, but this looks good from here. 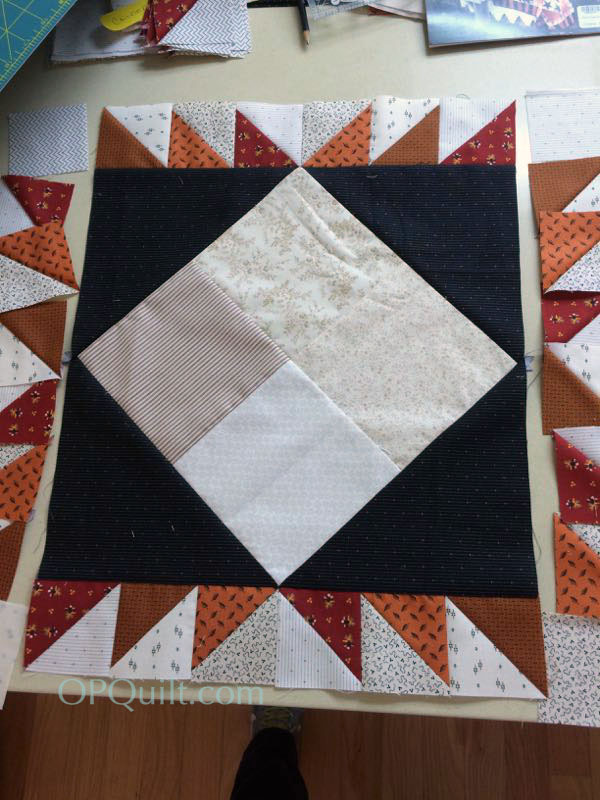 Step 2: March 2016–Cut out the quilt: the tan backgrounds of the squares, the border triangles, the smaller half-square triangles, strips for the wonky stars, but save the piano key border for later. Step 3: April 2016–Assemble four blocks and add large appliques; use Thelma’s method (of Cupcakes and Daisies) for adding the curlicue stem. Make and add half-square triangeles (HSTs) around these blocks, using the 8-at-a-time method of HSTs. 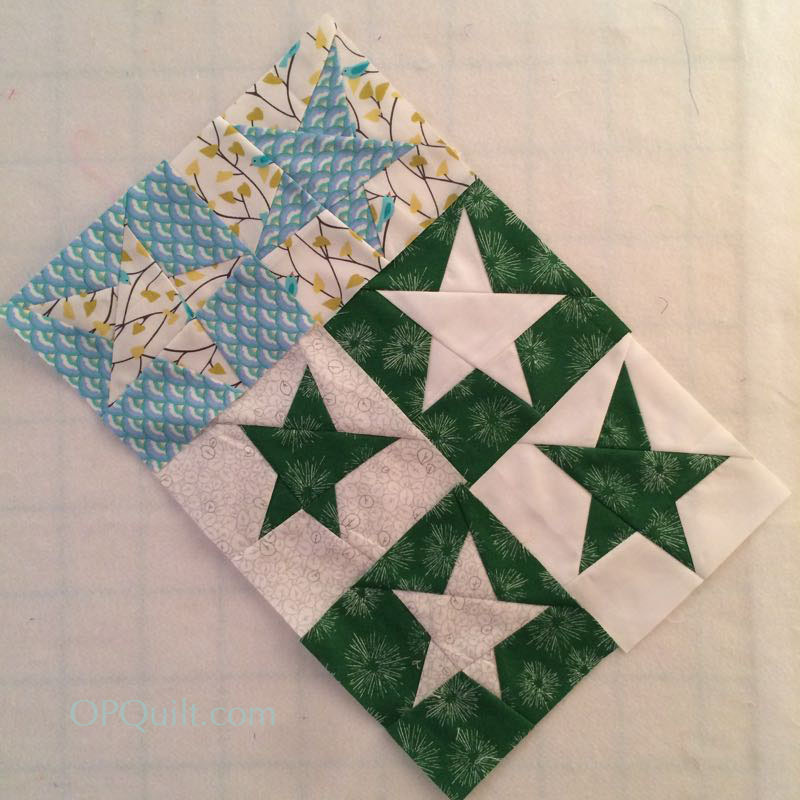 Step 4: May 2016–Cut and make the wonky star blocks from templates and strips. We’ll be using Thelma’s method. I’m doing five blocks, so will need to make twenty wonky stars and true them up. 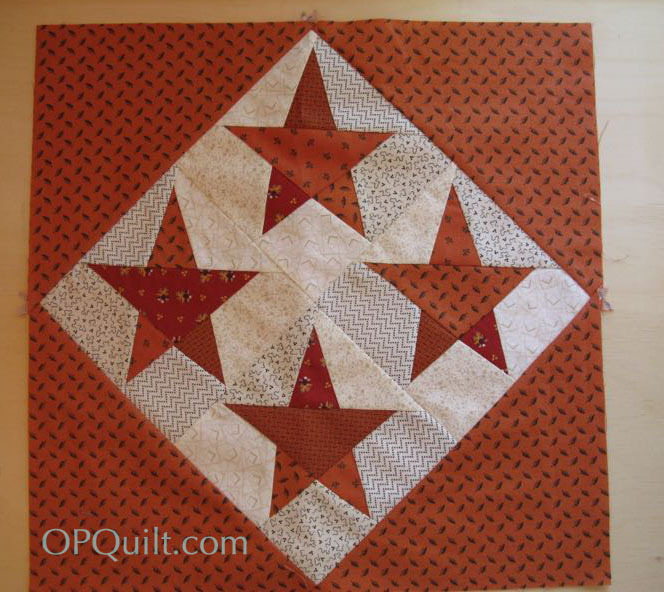 Step 5: June 2016–Assemble the rest of the star blocks, adding the large triangles on each corner and their HST borders. In the pattern, and in the photo above from Thelma, they are mixed up and varied, but also harmonized (some have a mix of orange and black, some have just black, some have just orange.) Make your own rules and go with it. 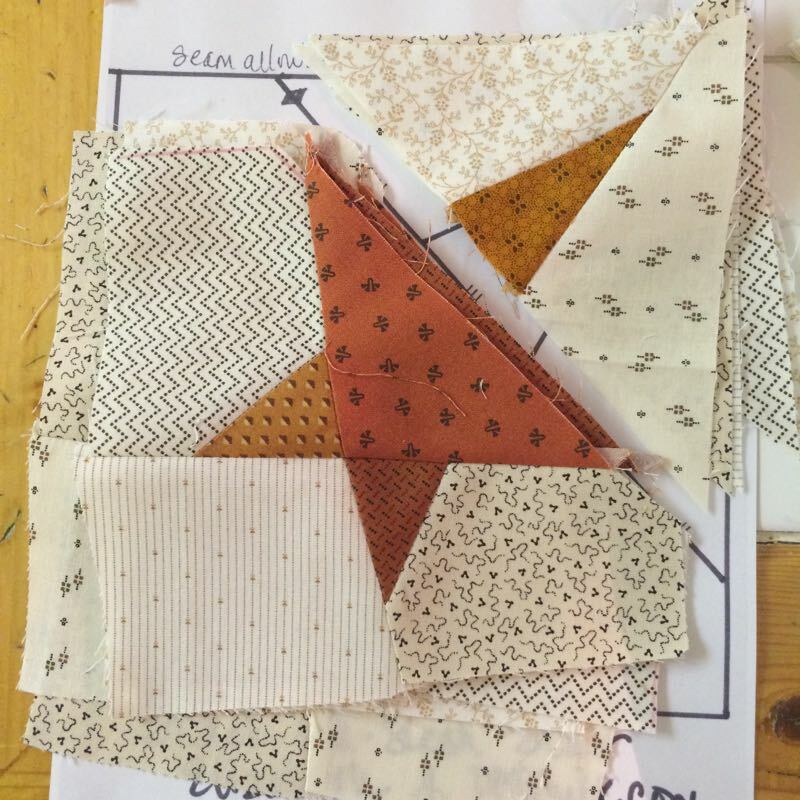 Step6: July 2016–Arrange the blocks on your design wall and stitch together. Cut the pieces for your borders. Make the four corner pinwheels. 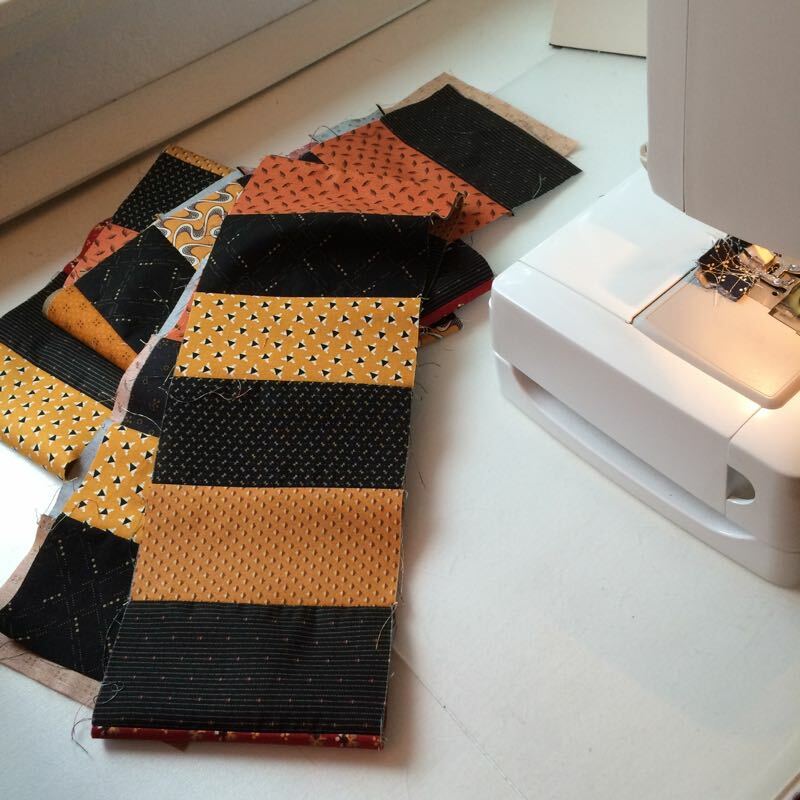 Step 7: August 2016–Sew borders together and attach them to the quilt. Posted on March 13, 2016 by Elizabeth E.
Happy March 13th! 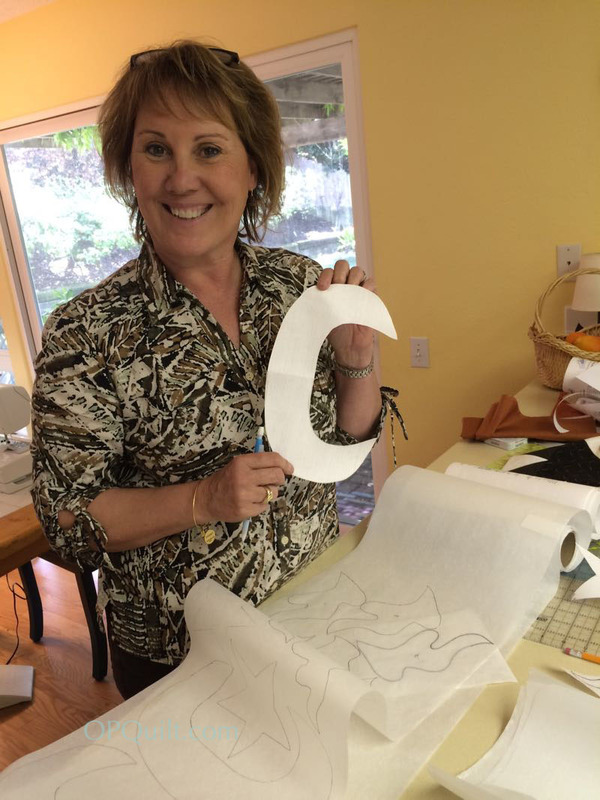 My friend Leisa and I got busy this month, cutting up our fabrics so we could show you this step. I’ve made some alterations to our Master Plan (below). 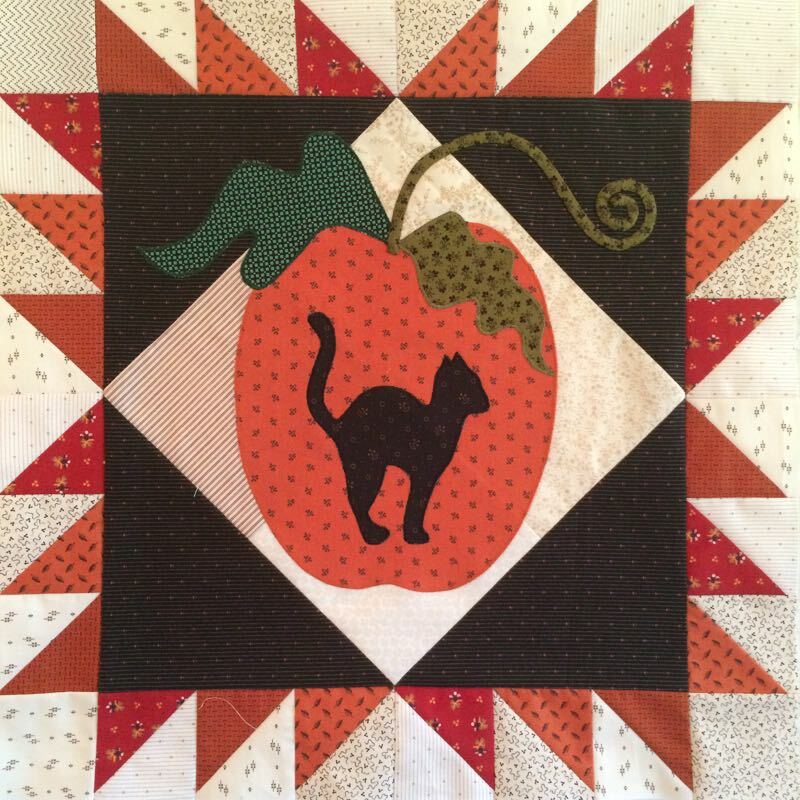 If you’re not making this quilt–see you at the next post! 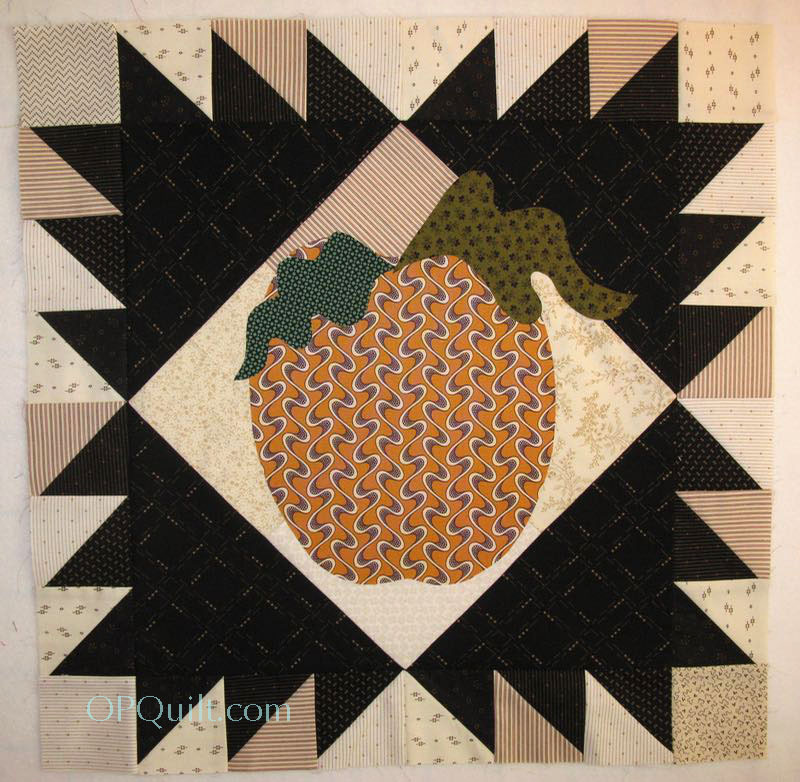 HOWEVER, at the end of this post, I’ve included a smallerized version of this quilt, thanks to Mary Burton, one of my readers, who often “shrinks down” quilt patterns in order to make the full compliment of blocks. 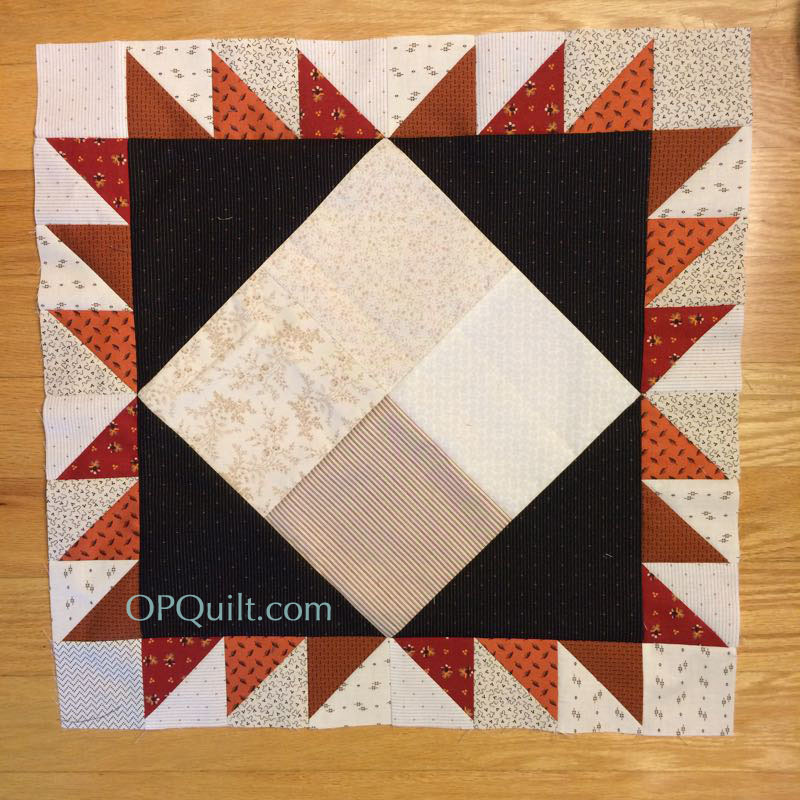 So you can make a smaller quilt, by also making smaller blocks. More, later. 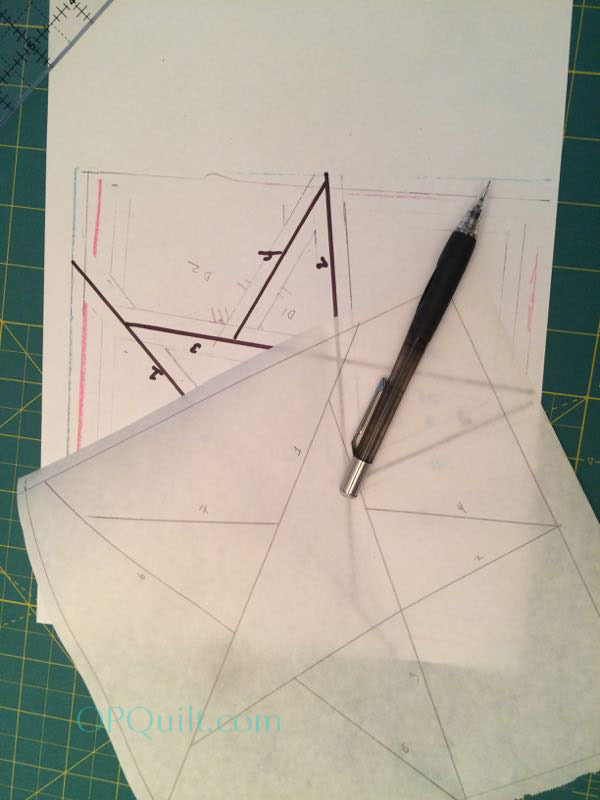 As a reminder, we are following this pattern by Blackbird Designs, so of necessity, to protect the pattern designers, I won’t show complete measurements. But where I’ve deviated or made up my own pattern, I’m happy to share. As you look at YOUR chart, you’ll need to decide how many star blocks you want, how many appliqué blocks you’d like to make. 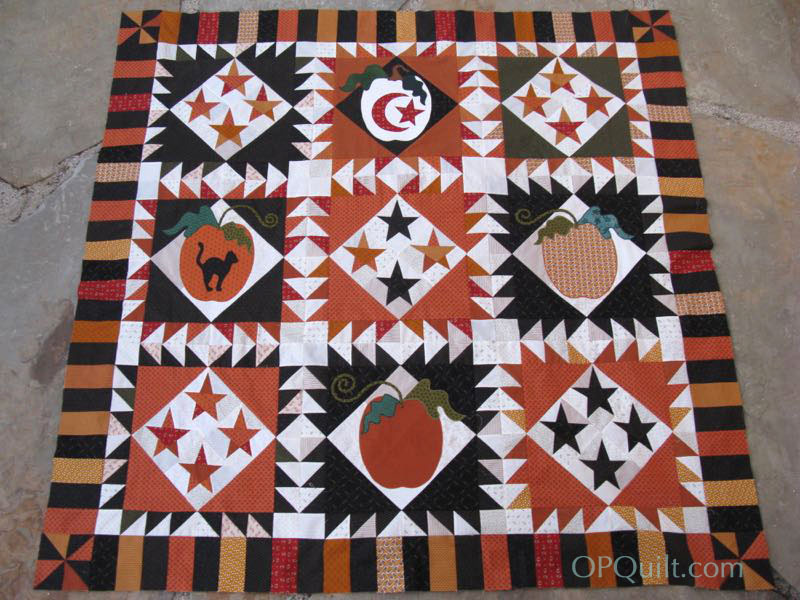 Then, further subdivide your appliqué choices into how many pumpkins? how many cats? how many moons/whatever? 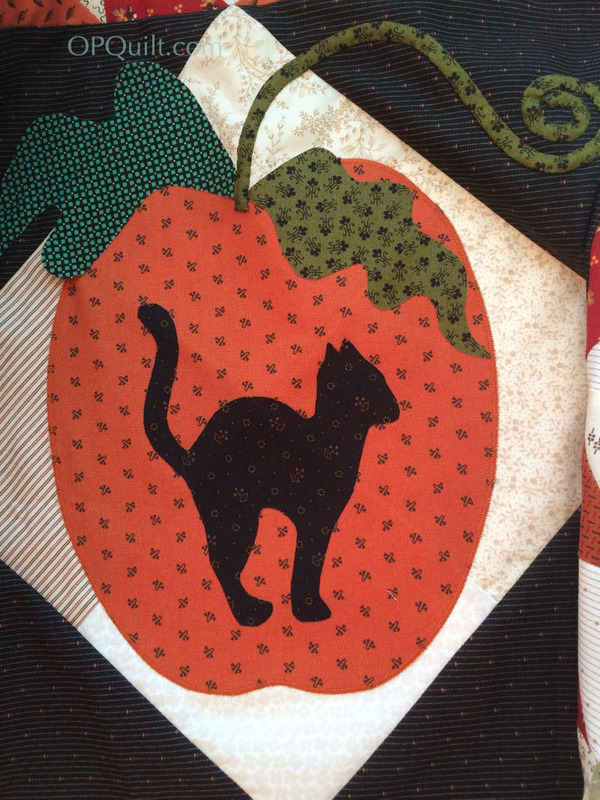 The pattern includes the pumpkins, stars and moons, but for the cat, you’re on your own (that’s what we have Google Image for–just type in silhouette halloween cat). Thelma’s owl is referenced in *this* post. Leisa and I are making 5 star blocks, 1 cat-on-a-pumpkin block, 2 pumpkin blocks, and 1 moon block. 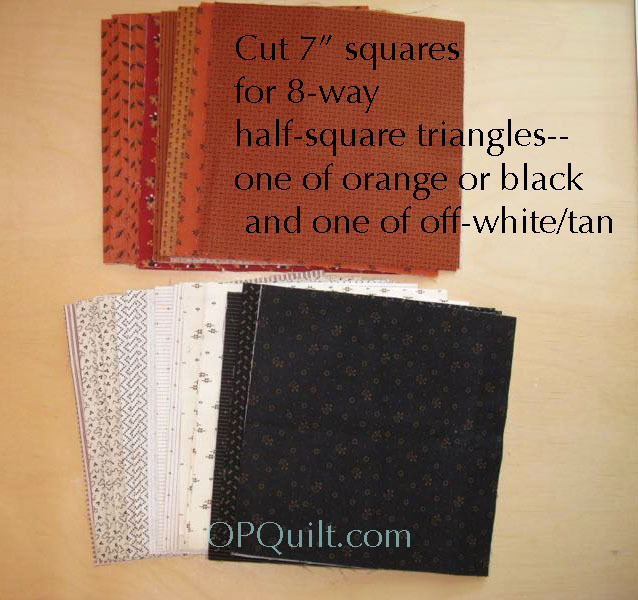 Cut seven-inch squares on this step, half in light and half in dark (orange/black) fabrics. Then to make sure I was on track, I thought I’d better sew up one of these 8-way HST things and cut the triangles for the corners around the appliqué just to make sure it all worked. It does. I’ve put on the leaves on my pumpkin, but not the curlicue stem (that, and appliquéing them down will come later–I’m just testing). By the way, this block measures 19 1/2″ (finished)– just to compare it to Mary’s version of 9″ (her instruction sheet further down; keep reading). 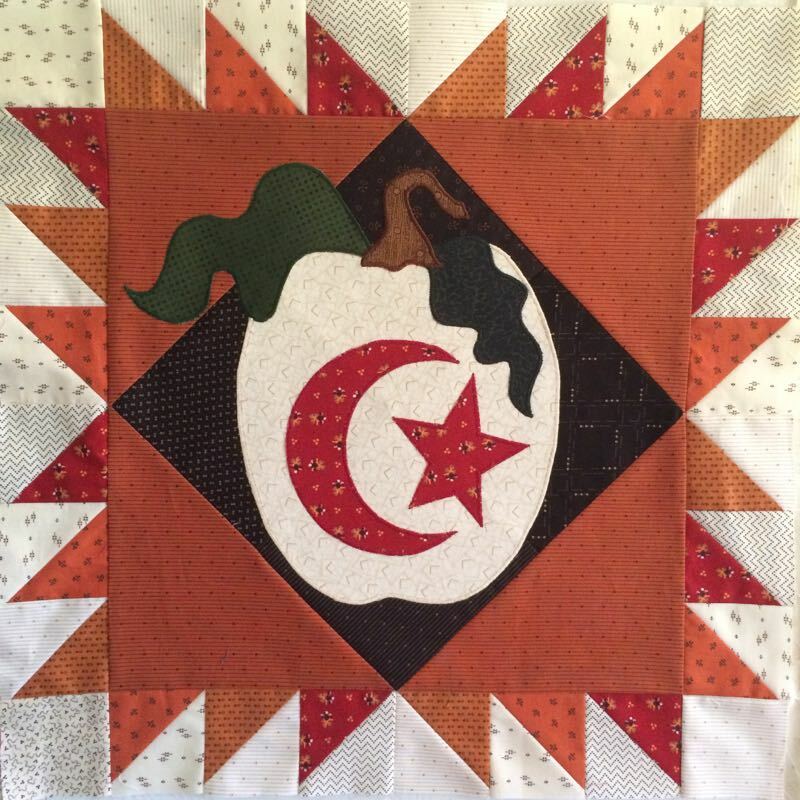 ATTENTION: If you are going to appliqué down your stars onto the center of your background blocks, skip ahead to the next section. This next discussion (somewhat confusing until you start the actual construction, but I’ll do my best to explain it now) is for those who want to make wonky stars. Let’s talk about the Wonky Stars. 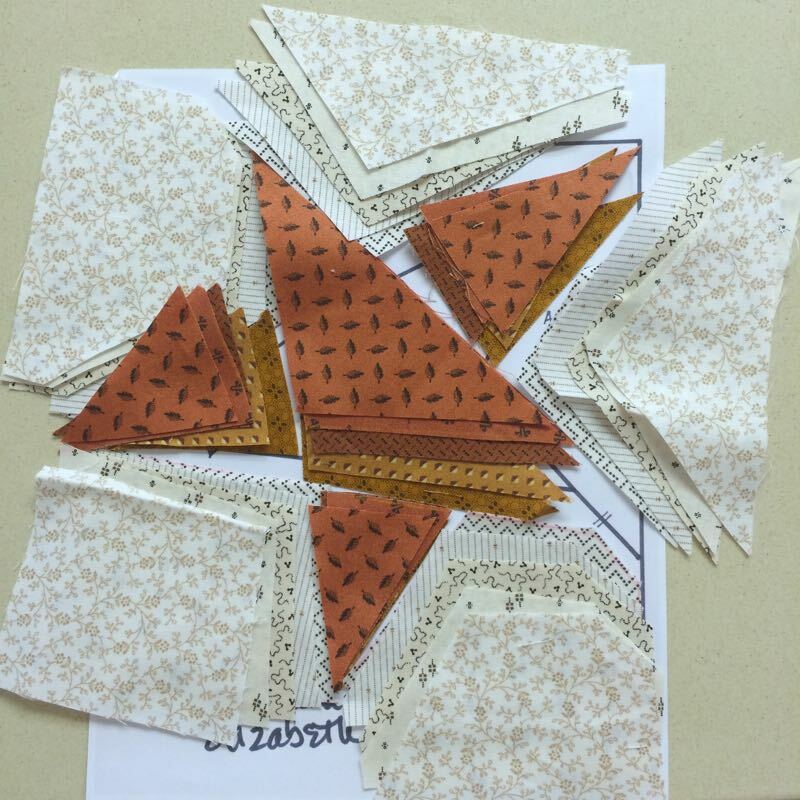 Here’s a sample (without the HSTs) to see how the fabrics are all placed around. There are four pieces for the star centers, and five pieces that make up the star backgrounds. Sew them together, trim and you have our block. While this cutting-bigger-and-shuffling thing was big in the 1980s when we’d make wonky nine-patch blocks, it’s currently being taken to new heights by the Buggy Barn. 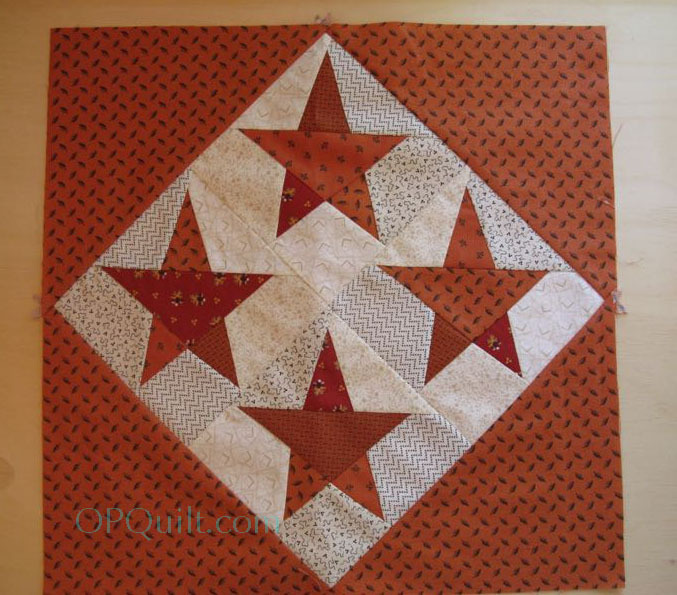 But generally you make a pattern for the star bigger than you need, then sew it together after shuffling the pieces. I’ll give you this template next month, but above you can see one of the earlier prototypes. The stars in the blue/light print are my first prototype and you can see I cut off the points. Re-draft. The next set (the lower green/white) just looked weird. Re-draft. I am pretty happy with the top two stars (green white) as their proportions look okay to me, and when I did them up in the fabrics of the blocks (above), they still looked okay. So, how did we figure out what to cut? First, following Thelma’s lead, I made plastic templates for each piece, then divided them up by star-center and star-background. Leisa laid out the templates on the cutting board, trying to see how economically we could fit them onto a strip of fabric. She came up with a 4″ strip of fabric for the star backgrounds (and it will take 18″ of that strip for one background set) and a 3 1/2″ strip for the star centers (and you’ll use 11″ of that strip). So you can get two complete star backgrounds from one 4″ by WOF strip and three complete star centers from one 3-1/2″ by WOF strip. The trick is, though, that you need a variety of prints to make the wonkiness. 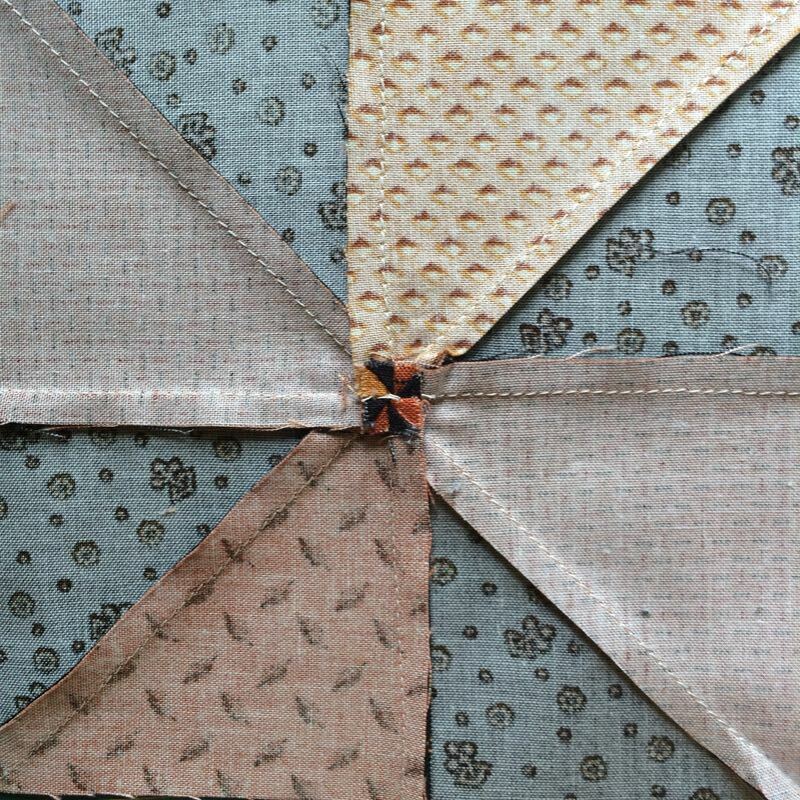 Since there are 4 pieces to the star center, you’ll need at least 4 strips, each of a different fabric. For the star backgrounds, you’ll need 5 different strips. ARE YOU THOROUGHLY CONFUSED? Me too, and I already did it. Just download the chart, follow along how many we cut (or count the number in the photo) and get everything cut. 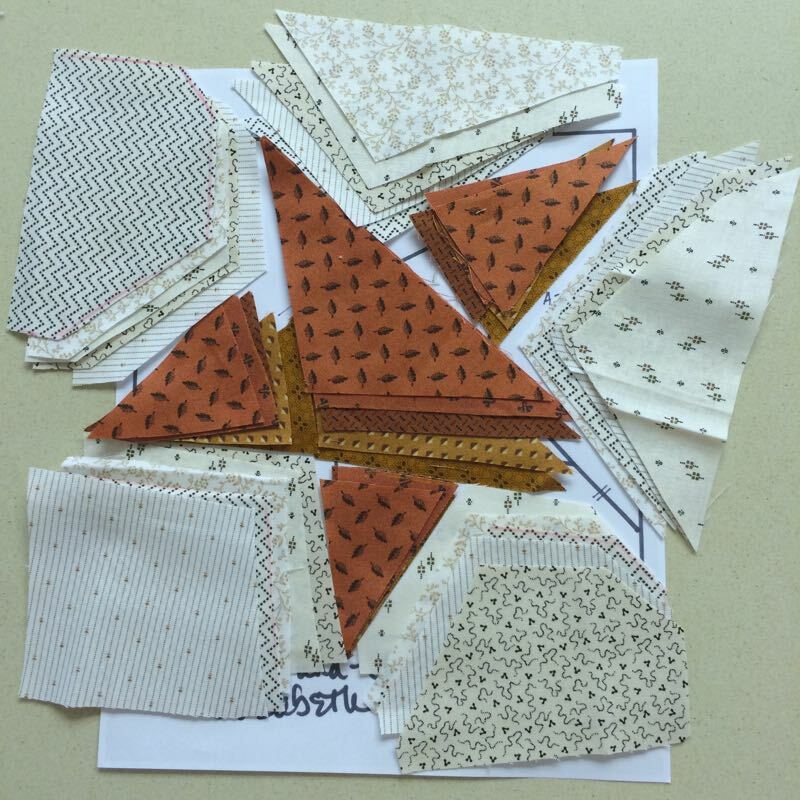 Don’t give away your extra fabric, in case you need more, and tuck it all away in a box until April 13th, when we’ll start constructing the appliqué blocks, and I’ll show you how to do the 8-way HST blocks, too. Wonky stars are coming in May. 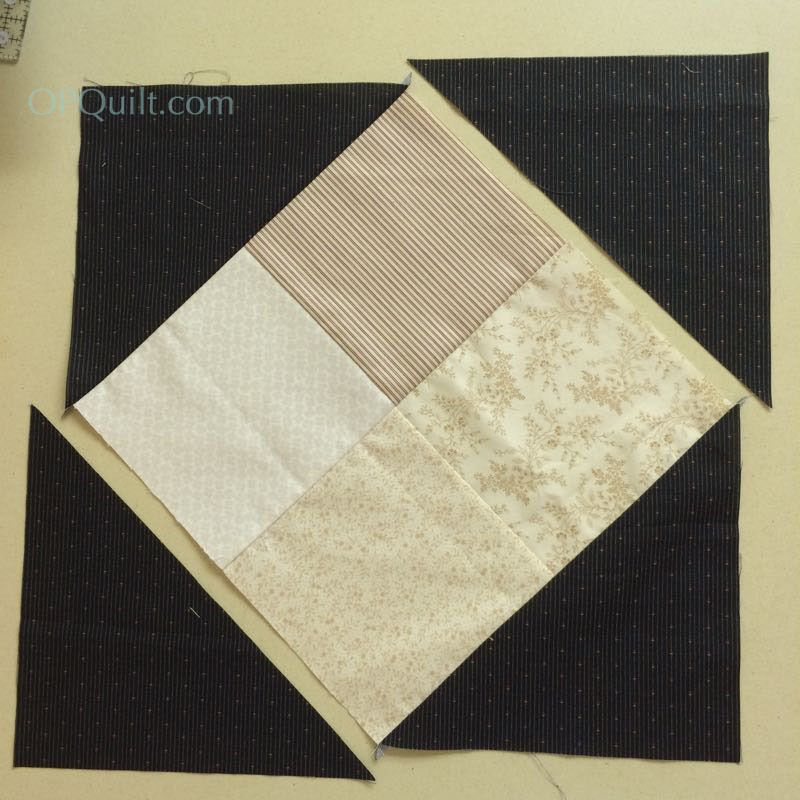 I’ve purposely left this photo uncropped so you can use the outlet for a gauge as to how elegant this smaller version of the quilt is. Really fabulous, and I love the way her backgrounds in the star blocks go from medium to light. 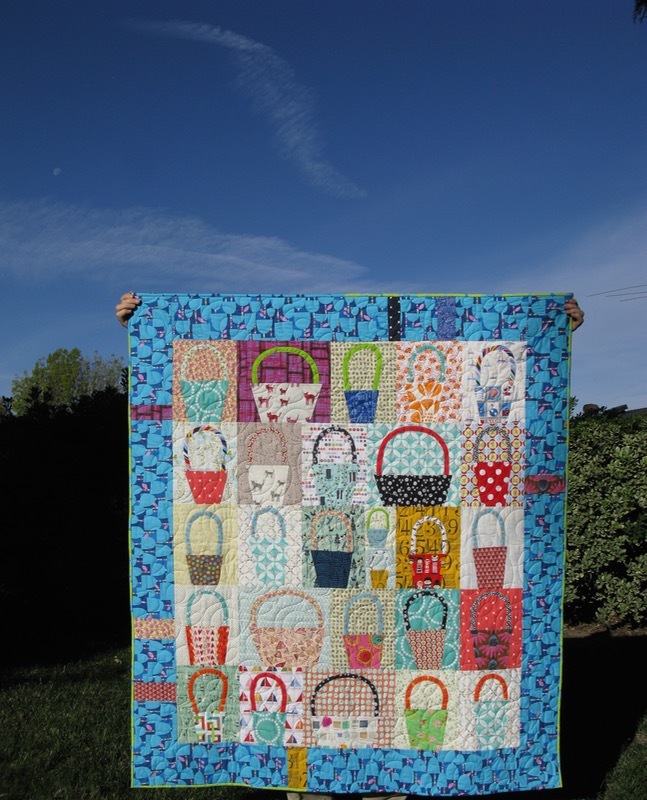 “[Going smaller] isn’t harder when you are an experienced quilter. You just take your time. 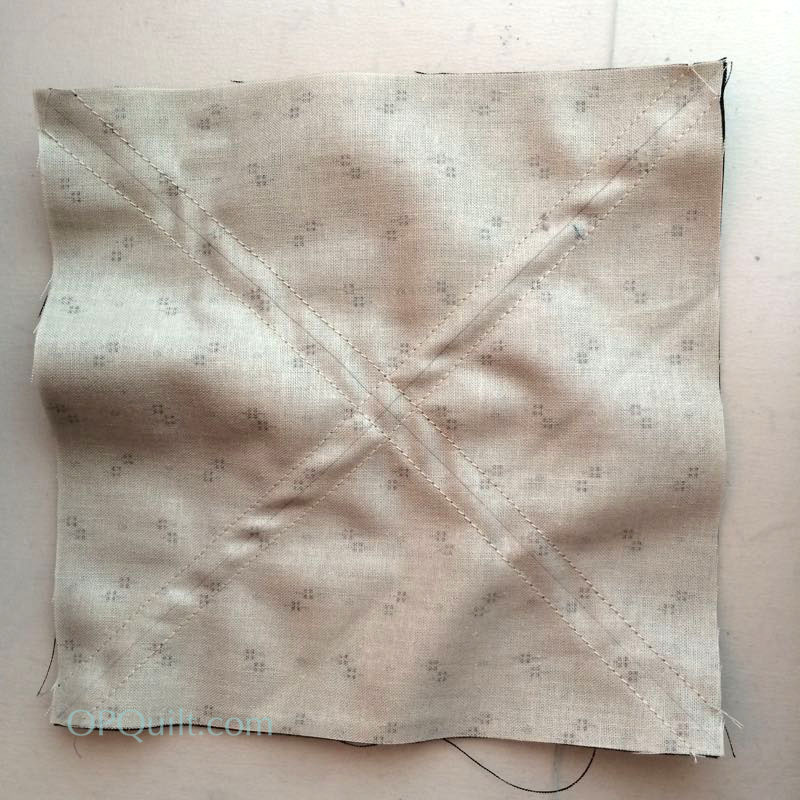 Take two squares, sew your seam and measure that piece to be sure you have the measurement you are supposed to have. Do that until you get the correct measurement. If you do that you should not have to pin. Also, you will always be able to use that needle position for all future projects. The only part that I had to slow down for were the half square triangles because they are so small. If you use the easy angle ruler, they actually cut and go together fast. I just learned how to use it this year and it’s wonderful. 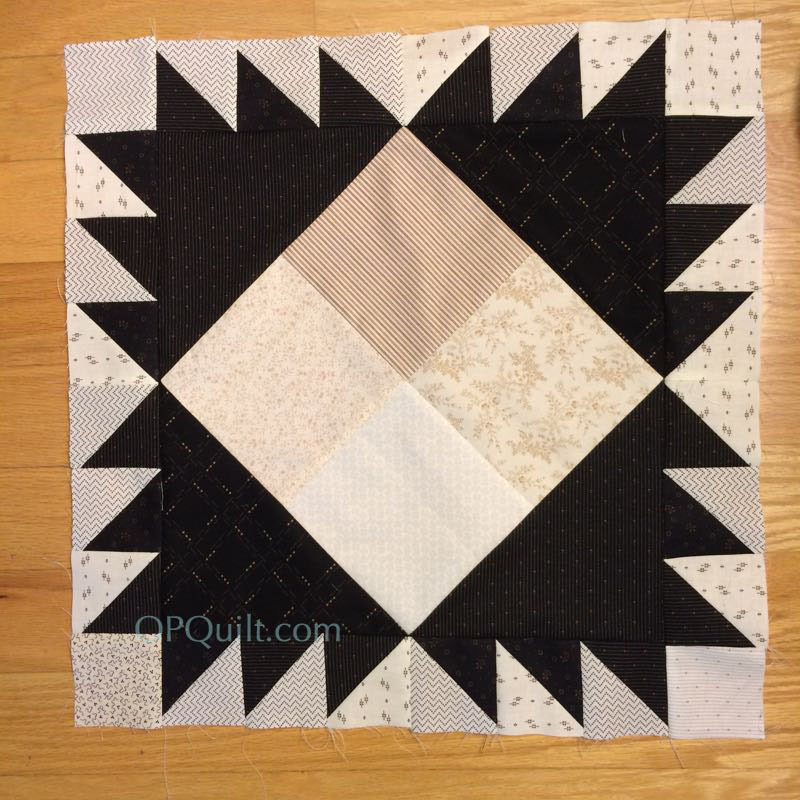 Since I made this quilt last spring I just cut 2-inch squares in half and sewed my triangles together and then squared them down to 1 1/4.” The Easy Angle ruler leaves that step out and you don’t have any fabric waste. You do have to find your correct measurement though. 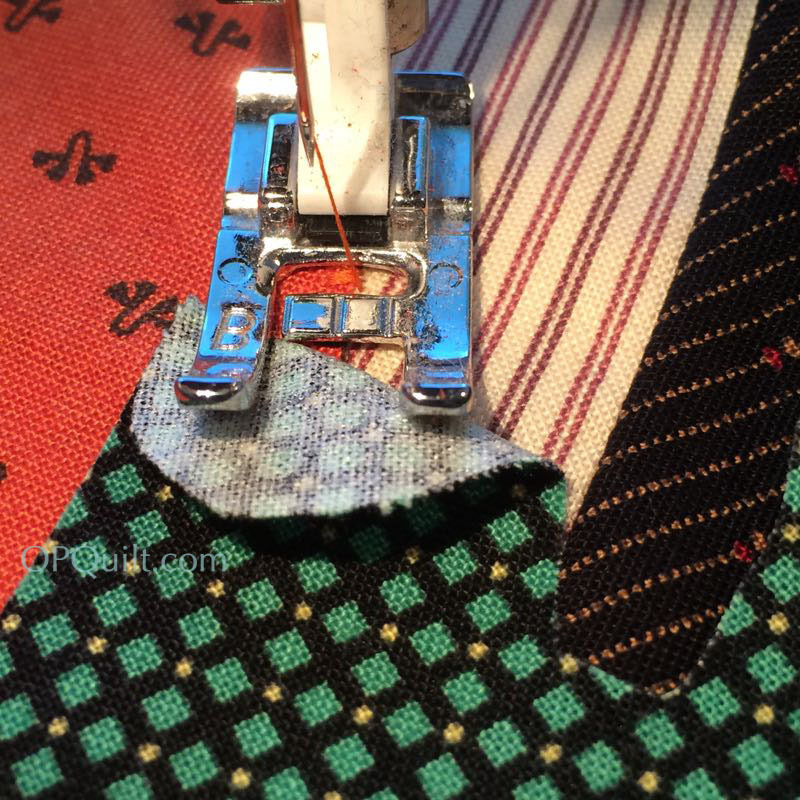 You don’t measure your seam, you measure those 2 squares after you sew them. Download her instruction sheet here: Burton_Halloween1904 And if you want to thank her, leave a comment and I’ll forward it on to her. By the way, I’ve changed some of the schedule stuff below. Just keeping’ things up to date. See you next month! Step 3: April 2016–Assemble four blocks and add large appliques; use Thelma’s method (of Cupcakes and Daisies) for adding the curlicue stem. 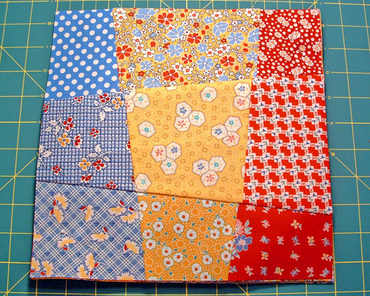 Make and add half-square triangeles (HSTs) around these blocks, using the 8-at-a-time method of HSTs, here and here. 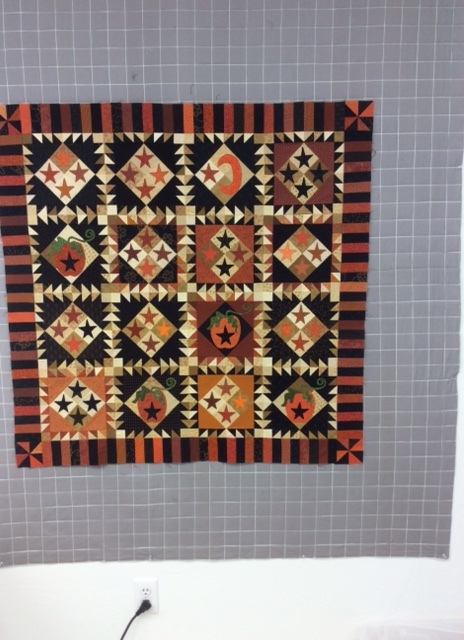 In the pattern, and in the photo from Thelma, they are mixed up and varied, but also harmonized (some have a mix of orange and black, some have just black, some have just orange.) Make your own rules and go with it. 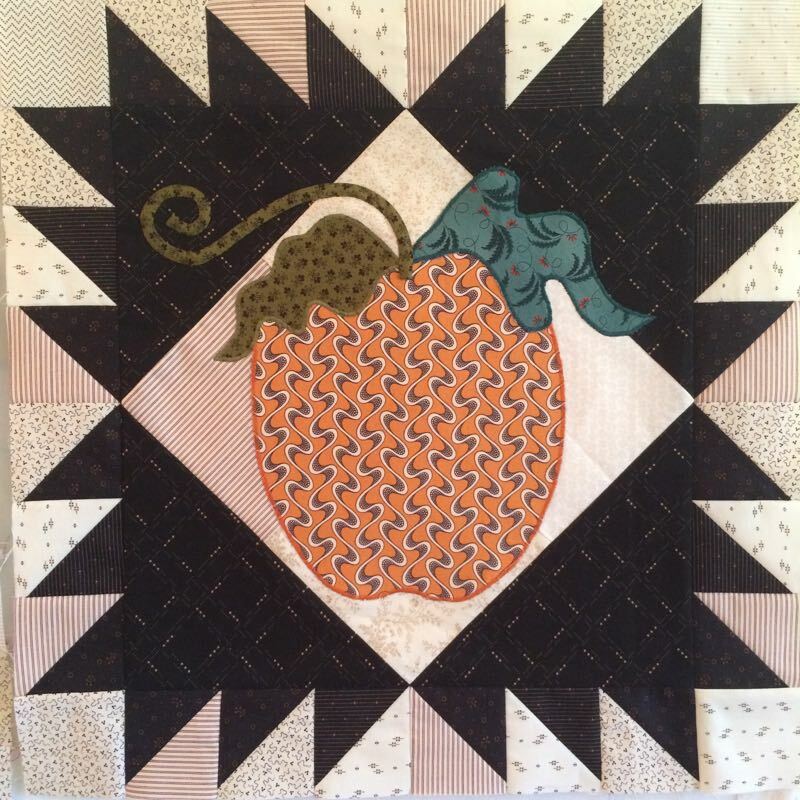 Posted on December 2, 2015 by Elizabeth E.
I began saving Polaroid blocks for this quilt two years ago, and purchased the fabric about the same time. I thought it was time to push it over to the “done” side of the ledger, given my last post. Label’s not yet finished–coming soon. The title is taken from one of Einstein’s scoffing statements over the idea that that one particle can have an effect on another particle which might be some distance away. He thought is was not possible. Modern physics has proved him wrong, and scads of poems have been written about this, so I thought, why not a quilt title for a spooky quilt? of miles, the speed of light, it will make no difference…. 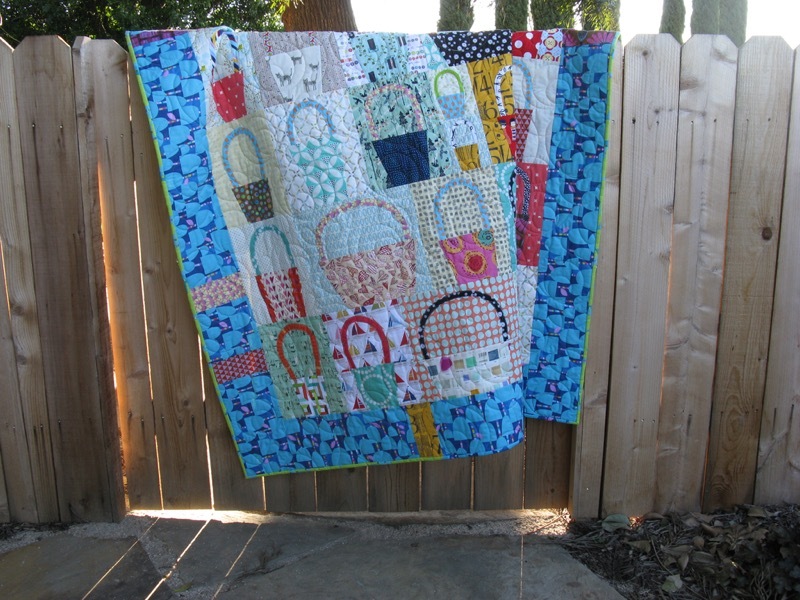 This was a fun quilt to make, a really great one to do with large scraps. I have a tutorial •here• for cutting up the baskets quickly, and the how-to for the handle is *here. * Just go go go, trying not to think about it too much, and have fun while you cut and sew. The title is taken from “The Picnic,” a poem by Maylee Bossy, about an outing after her husband has passed away. My husband is still very much here, but the poem involved a quilt and a basket — how could I pass it up? So I guess that deadline thing is working for me, right? 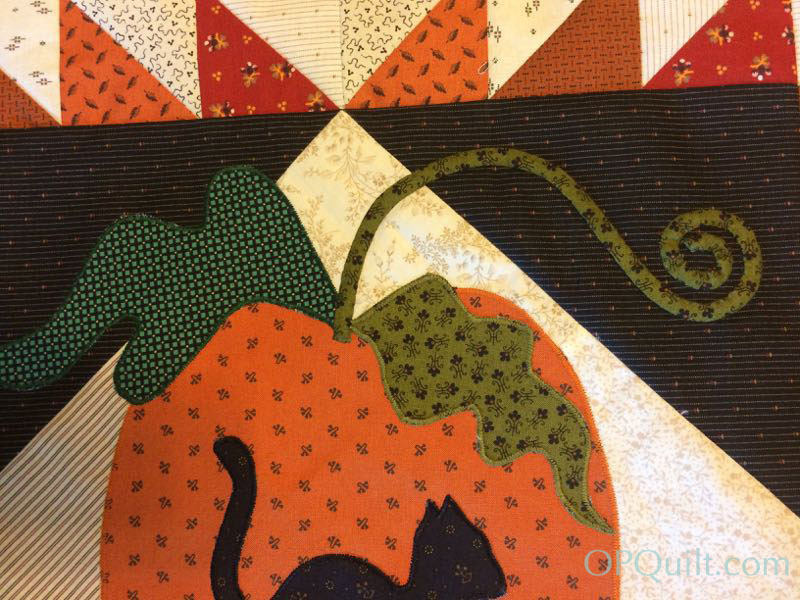 A Halloween quilt finished in November? 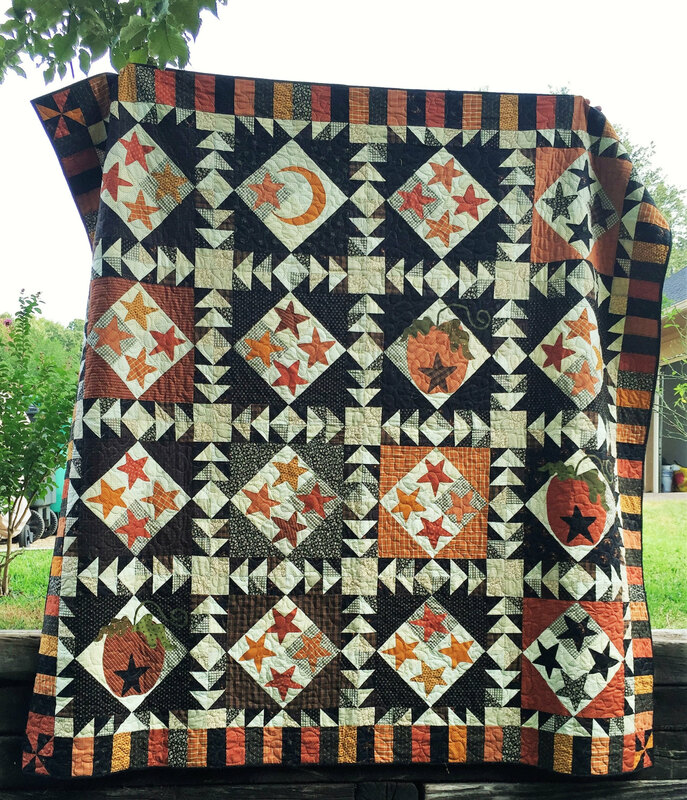 A Spring quilt finished in autumn? Let’s just say we’re EARLY, and leave it at that. 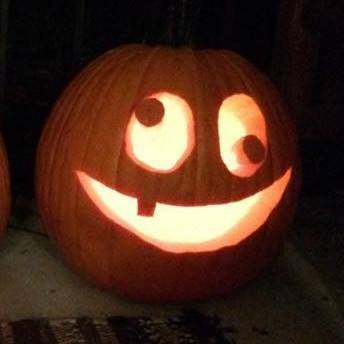 Posted on November 9, 2014 by Elizabeth E.
To get you back in the mood for this post, here’s my son’s pumpkin. Did I tell you he has a great sense of humor and can write computer code that drives websites? 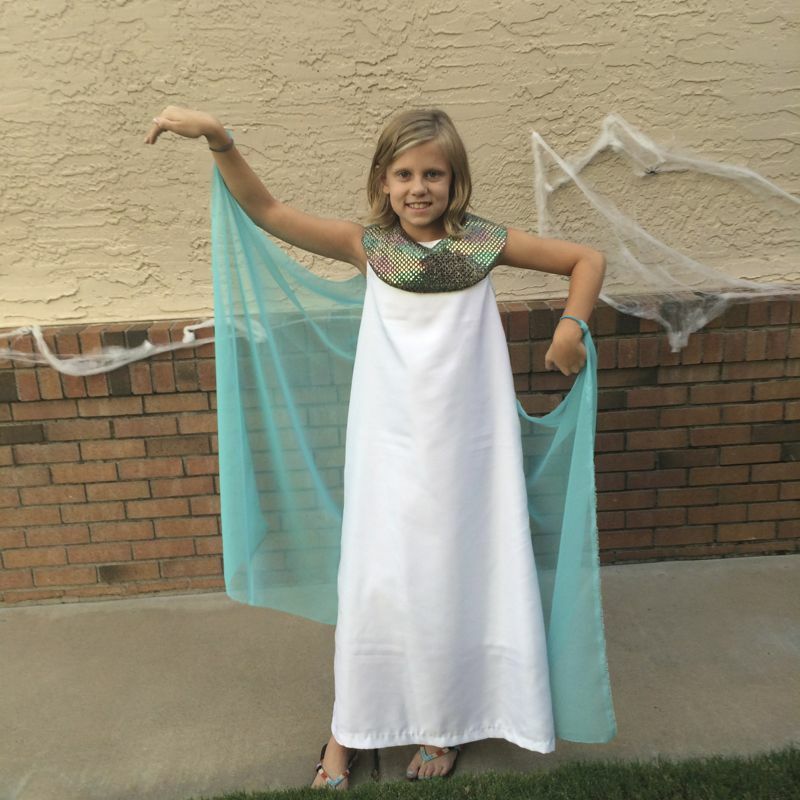 First up is Keagan, the Egyptian Princess. I visited my daughter’s home in October and went right to work. We had to double-line that white sheath because, well, it was white. 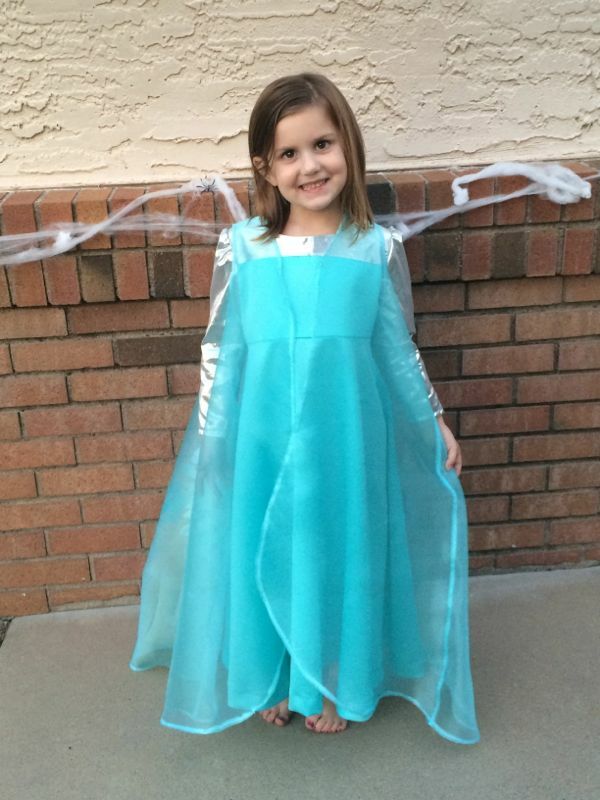 Keagan and I talked over costumes, looking some up on Pinterest before she went to school and then I headed to JoAnn’s. I hate paying a billion dollars for patterns, so picked up one of the $2.99 Quick and Easy patterns that looked like it might work, and added on enough at the bottom to be long enough. I used the bodice of the dress to fashion a collar out of paper and tried it on her. Keagan had a few suggestions and I trimmed it to her specifications. The drapey thing was pinned on in the back with a safety pin, then wrapped around some rubber bands. Her mother and dad fashioned some gold bands for her (one solution is to cut a Pringle’s can into sections, then spray-paint gold) which she slipped over to hide the hair bands. She also had some on her upper arms to complete the look. 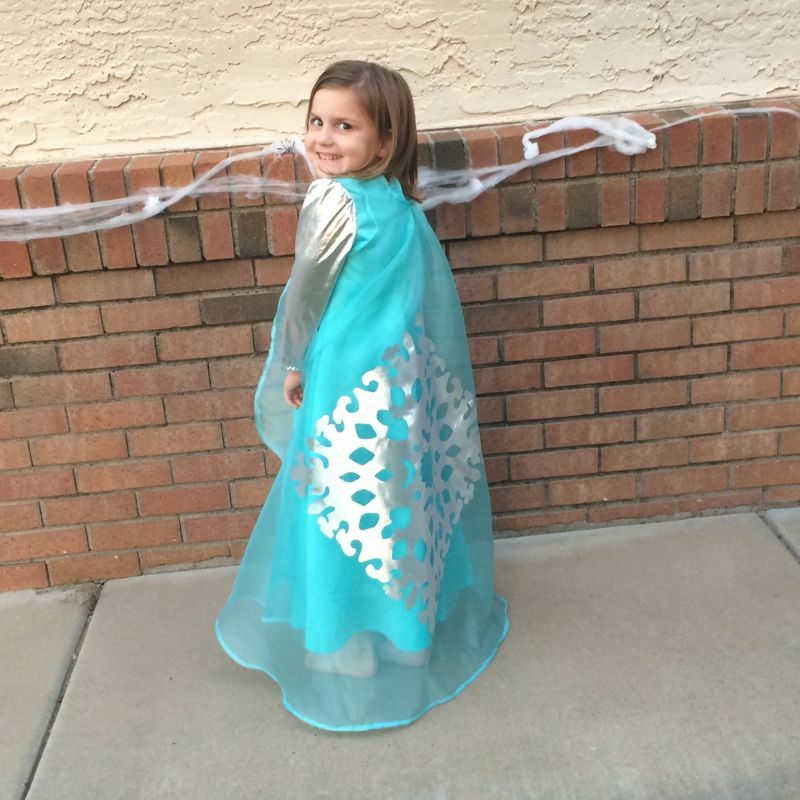 Maddy wanted to be Elsa. She had VERY detailed instructions, and since she was recovering from a tonsillectomy I had her at my disposal for measuring. The dress had to had see-through sleeves and silver at the top of the bodice, and Maddy was very specific about the drapey overcoat thing, wanting it to flow from her shoulders, but since I only had one day to get both costumes done, I went with a “coat-type” construction, made out of organza so it would have some body. 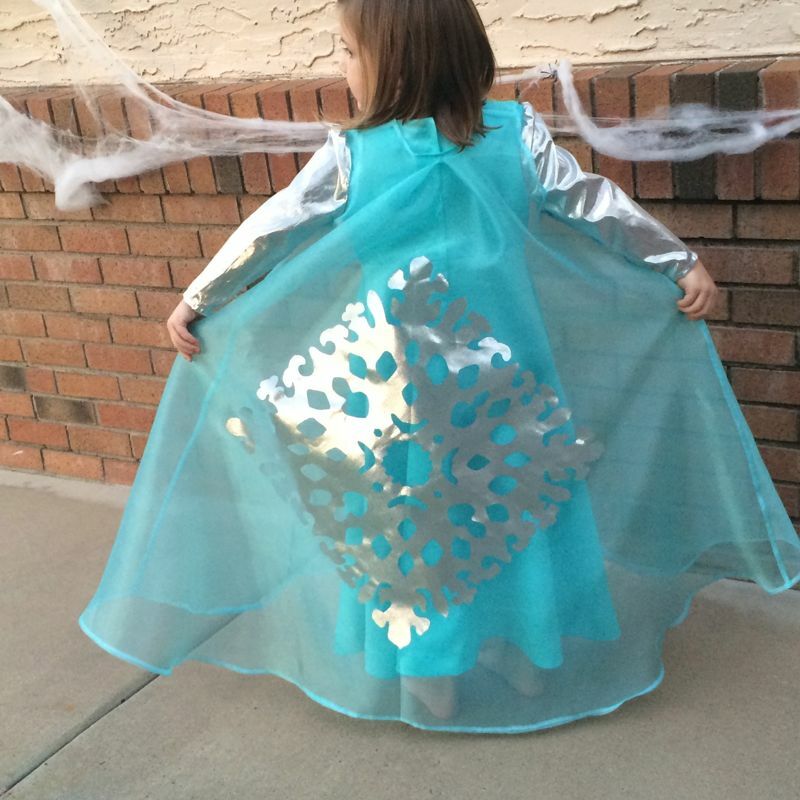 We cut out a giant silver snowflake by tracing it onto the paper side of fusible web, adhering it to the silver lame. We cut out the lame, peeled off the paper and fused it on. Because the lame and the organza are kind of “open” this process left a residue of stickiness. 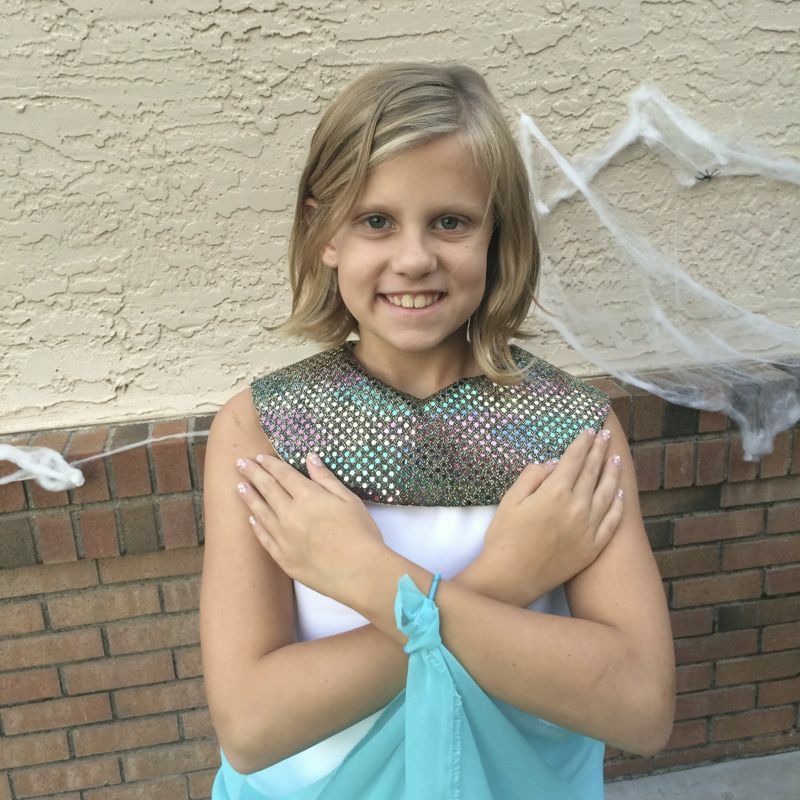 I told my daughter she’d better wash her ironing board cover so it wouldn’t stick to anything she ironed after that. I’m told both costumes were a hit. 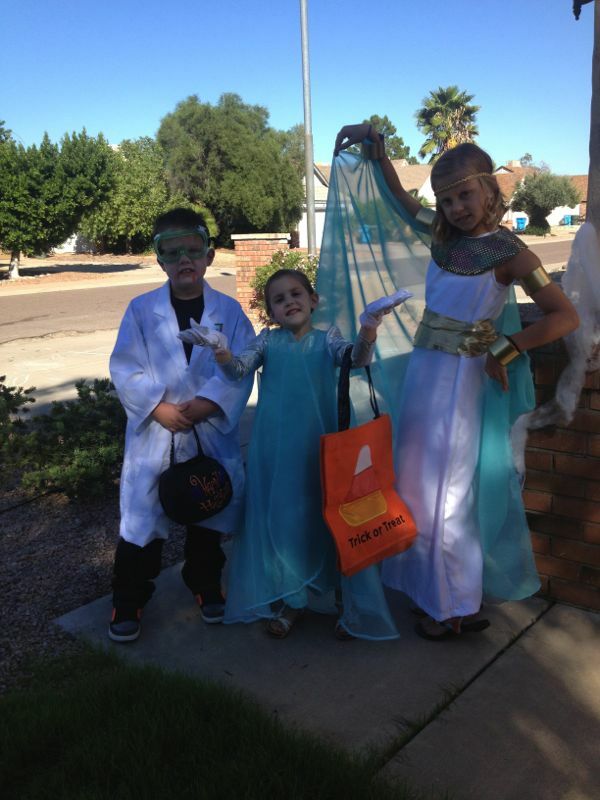 Here they are with their brother who was a Mad Scientist-Zombie Guy. Maddy is not wearing a crown (it’s a bush behind her). Sure looks like a crown, though. 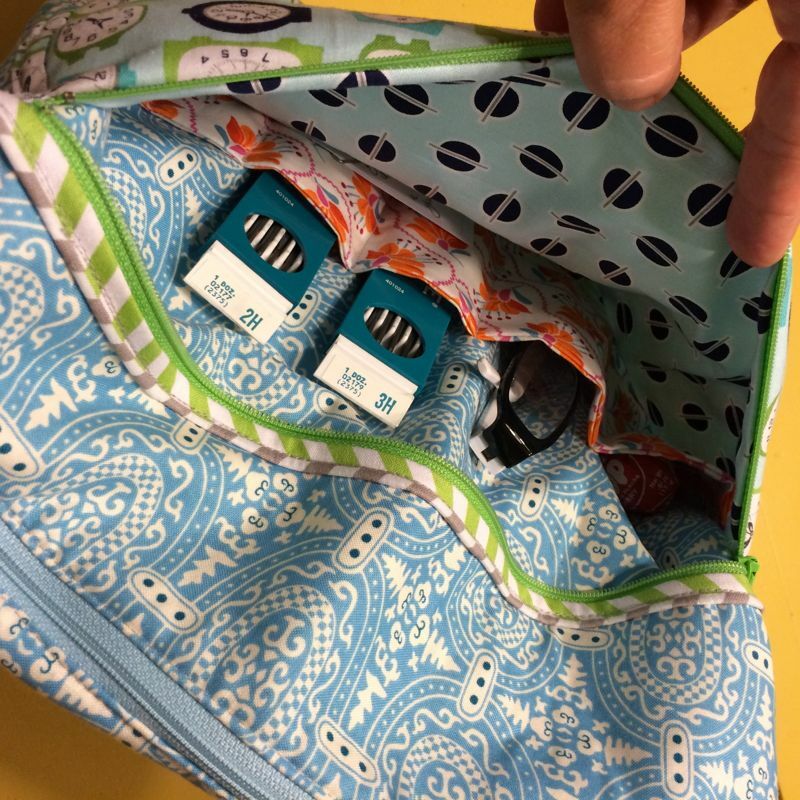 I was also able to get ahold of the pouch I made for Barbara and check it out, fully loaded. She says it works great. 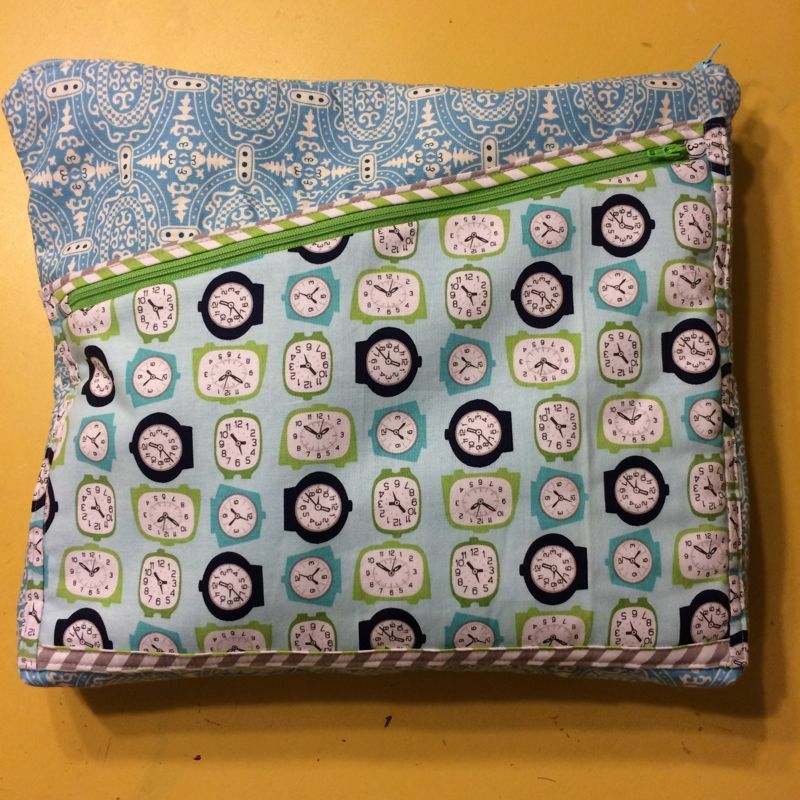 I’m so glad I can sew! Thanks, Mom!